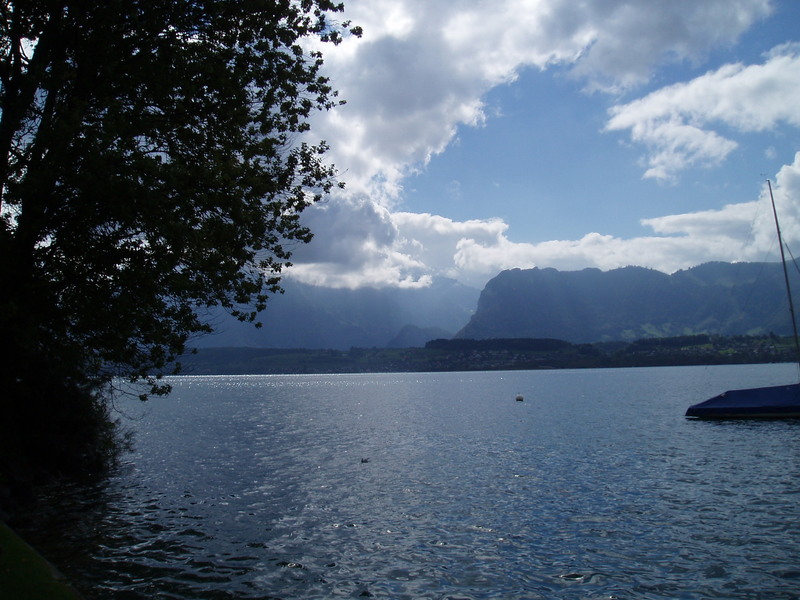 Oh my – here we have been in Interlaken and then Lucerne for two nights each. 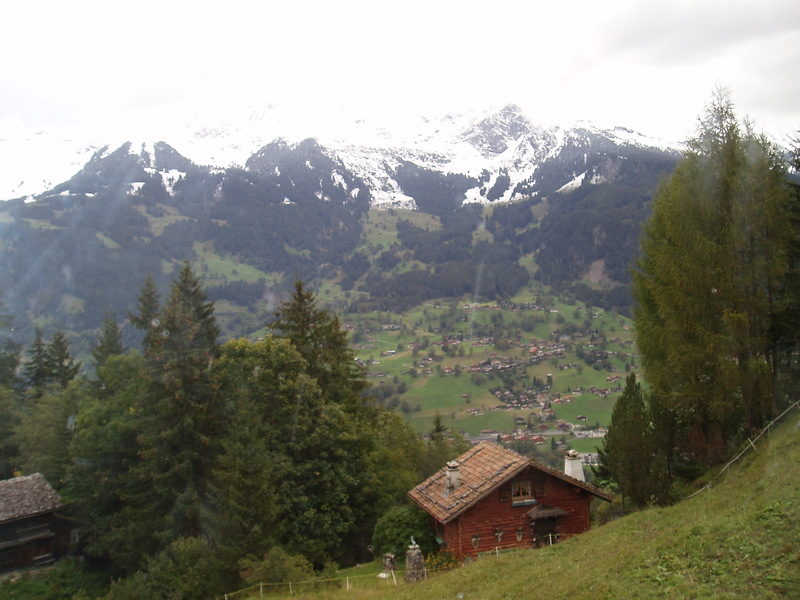 And from each of these amazing places, we went up a different part of the Alps. What an AMAZING experience. We are so privileged to see all of this in our lifetime. It is like NZ on steroids! It is hard to explain on paper / electronic how amazing this is. 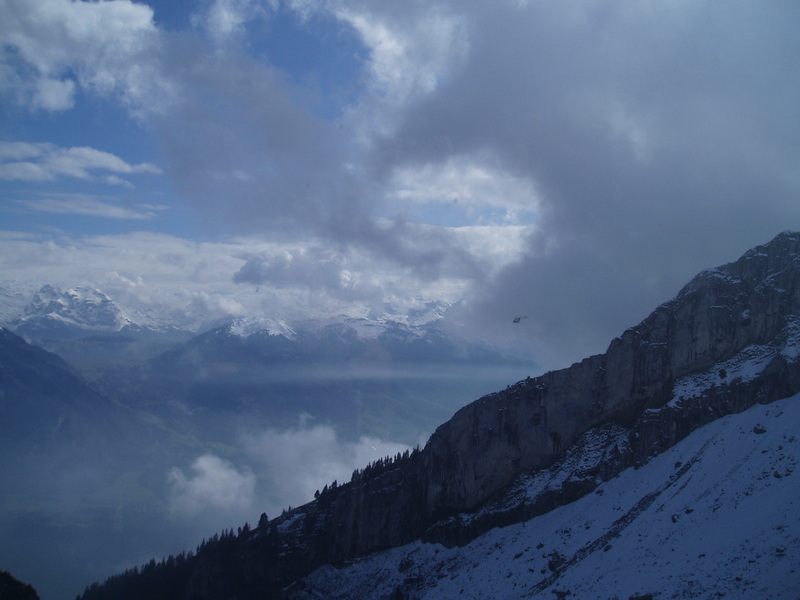 The size, snow, Alps, people, smell, colours………. The feel of the place. Incredible. We cannot beleive the number of wathc shops……. phew!! 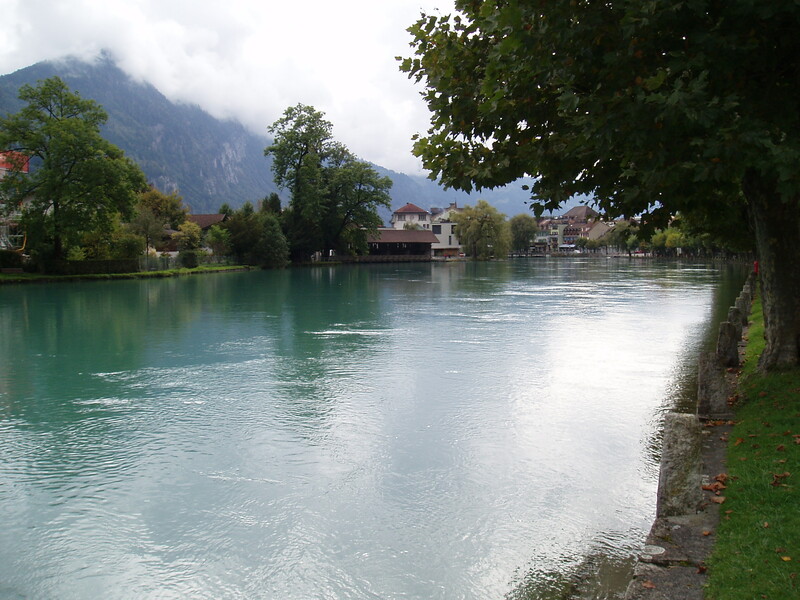 First: Interlaken. Which means town between lakes. 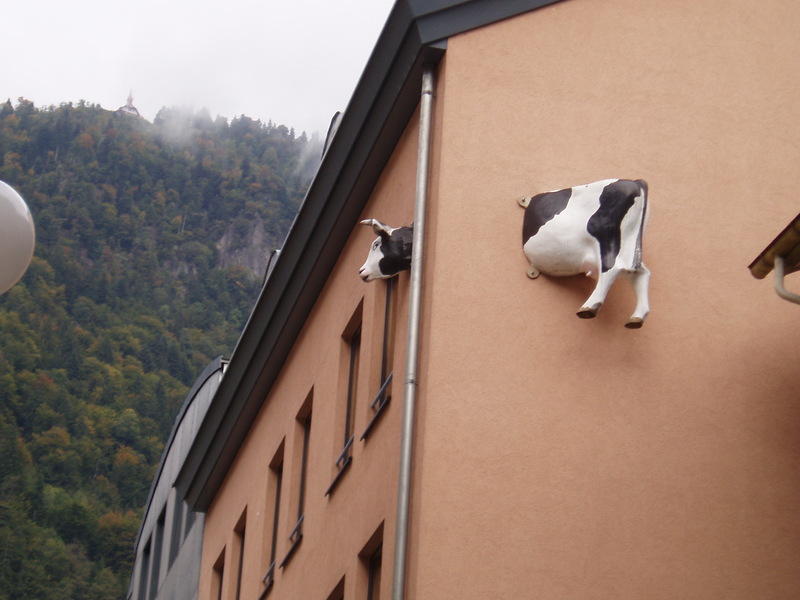 It is in the Alps, but lower down. We had a lovely refurbished hotel that had great staff. First day we did a lot of walking to get a feel of the town…….. and then dinner at the hotel. 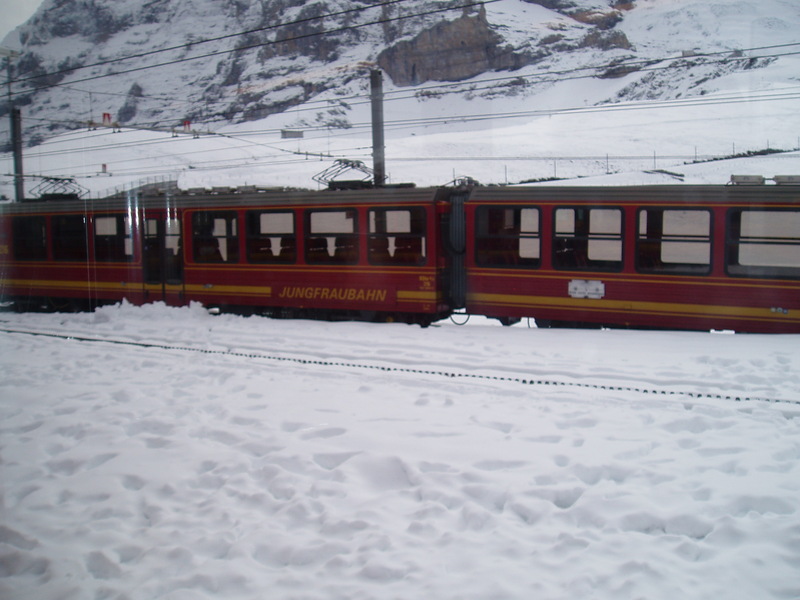 We were meant to go up the mountains to Mt Jungfrau BUT low cloud and no sights meant we couldn’t go. 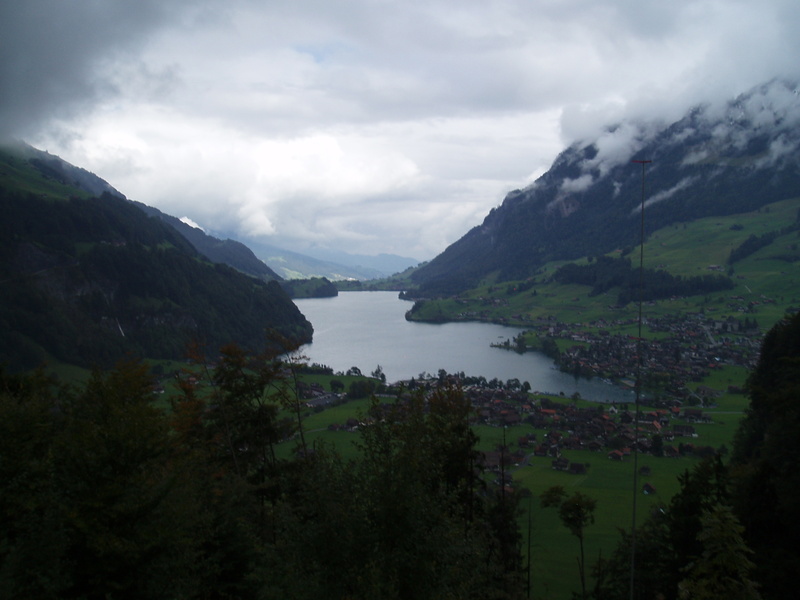 So we meandered the town, went sightseeing up the lake to a few townships, and then came back. The light, smell and colours were amazing. Like being in Central Otago on the most perfect autumn day. Wonderful. Mmmmmmmmmm. The place we had lunch happened to be having a festival that day so lots to see and hear. Then the next day it was a bit clearer. 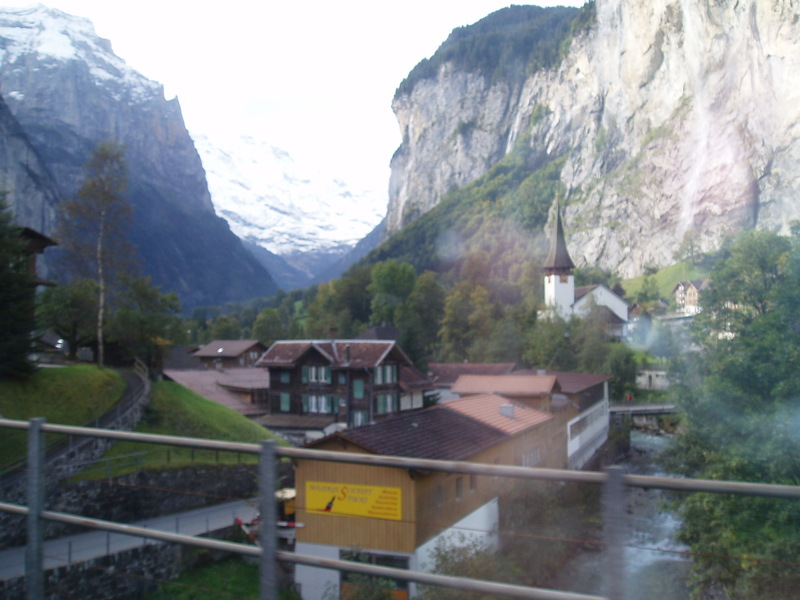 So on the train and up we went to Mt Jungfrau – the highest mountain in Europe accessible by train and 1,000 meters higher than Mt Cook. Oh my goodness!!!!!!!!!!!!!! 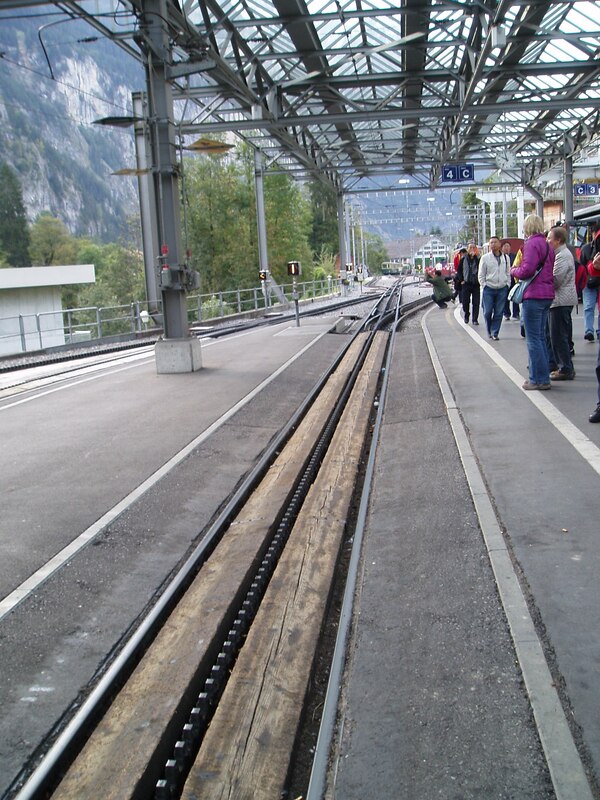 We had to change trains 4 times to get on steeper and steeper tracks. Finally on to a cog train. Oh my – the scenery was truly something. 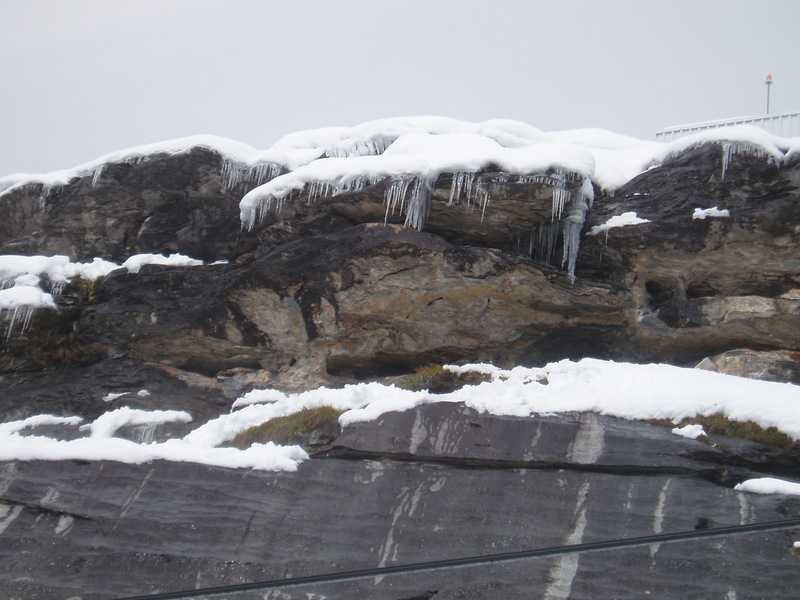 Icicles up mountain - and only autumn! 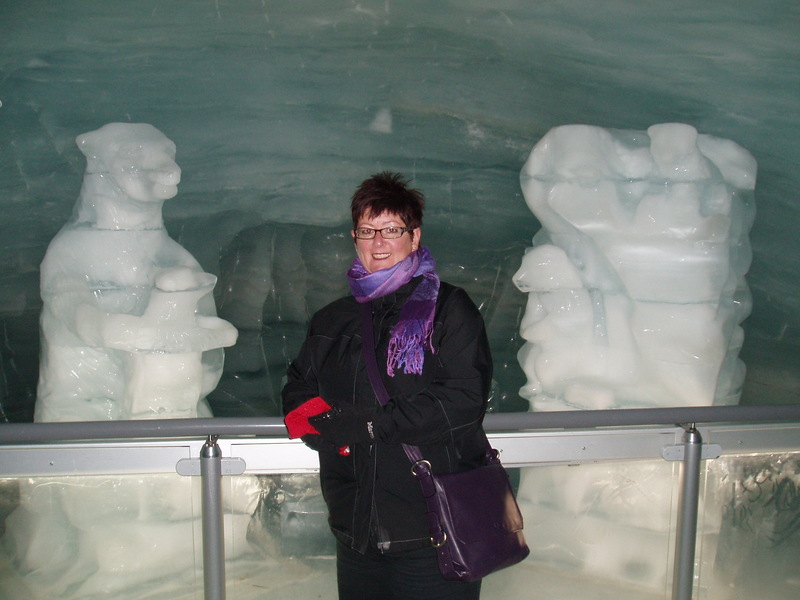 At the top it was amazing – we saw all we could including the ice palace – ice sculptures in an ice cave really. A young man slipped and broke his leg on the snow outside so we were extra careful on the ice / snow. 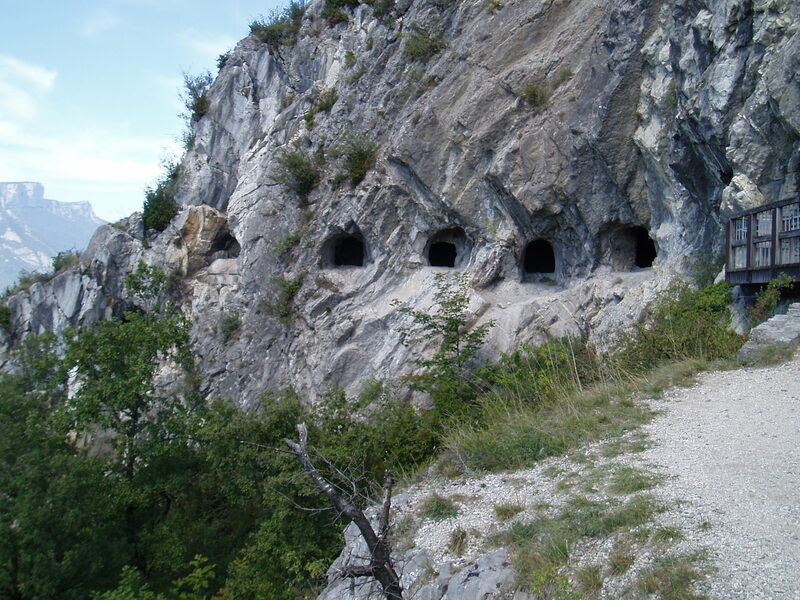 The photos show the beauty of the area. 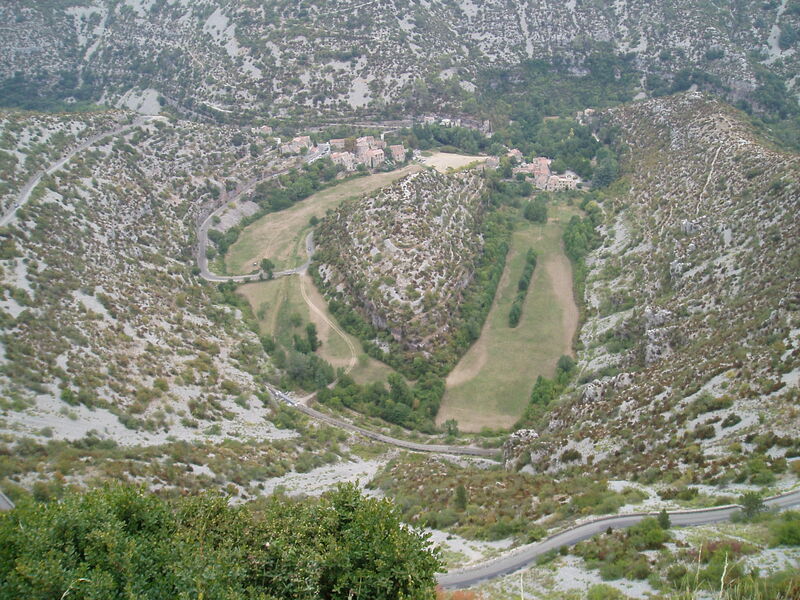 the track includes the cogs in teh middle as the gradient is so steep! 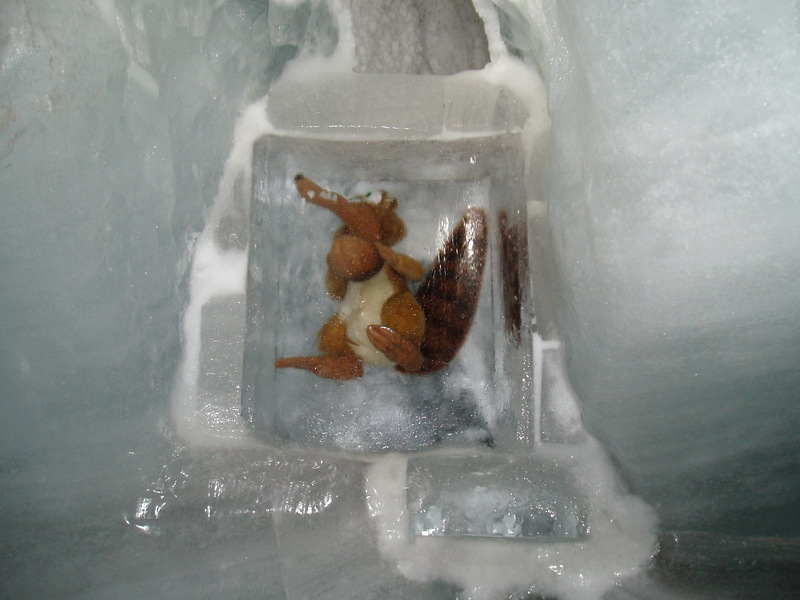 Ha - Ice Ages Critter stuck in Ice Cave. Made us laugh! PS: Note new purple handbag! 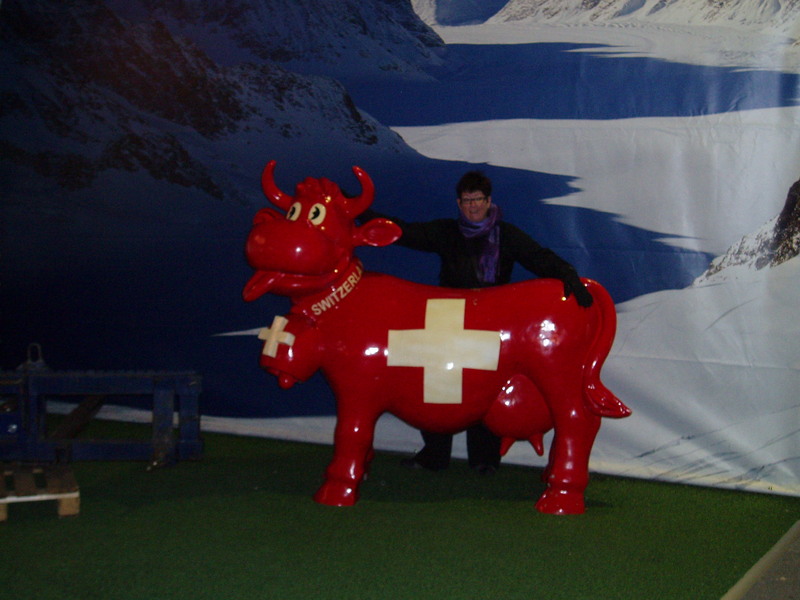 Jo and Mountain Cow in Jungfrau! 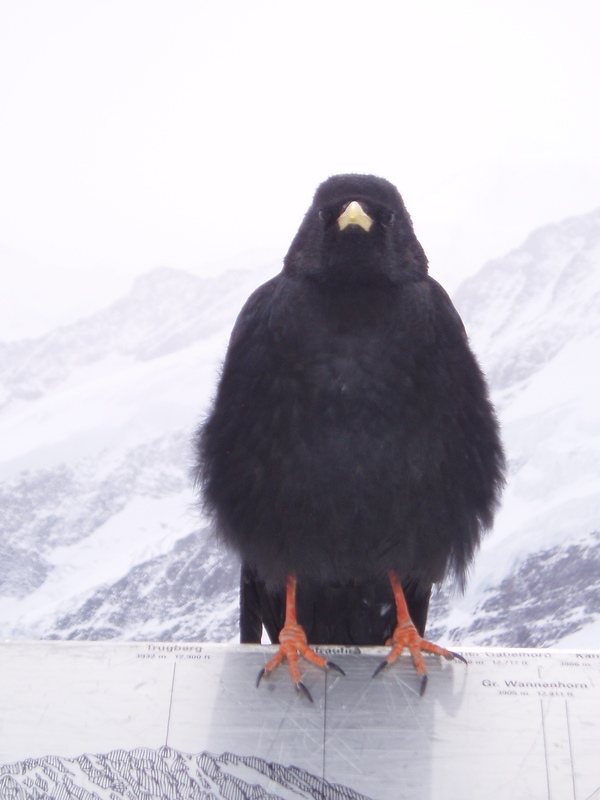 These birds up top of the mountain were so cheeky – I am sure they are feed regularly by the people! This one was posing for photos by us tourists! 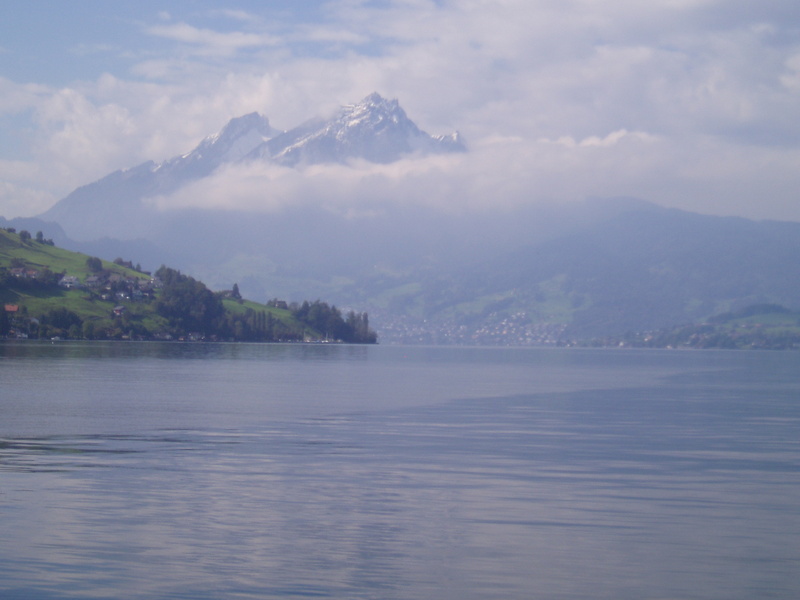 Back down and off to our next port of call, Lucerne. Only 2 hours drive point to point. Peter is now a natural at driving on teh right side – not tat either of us yet know teh road rules here. Uh oh………. 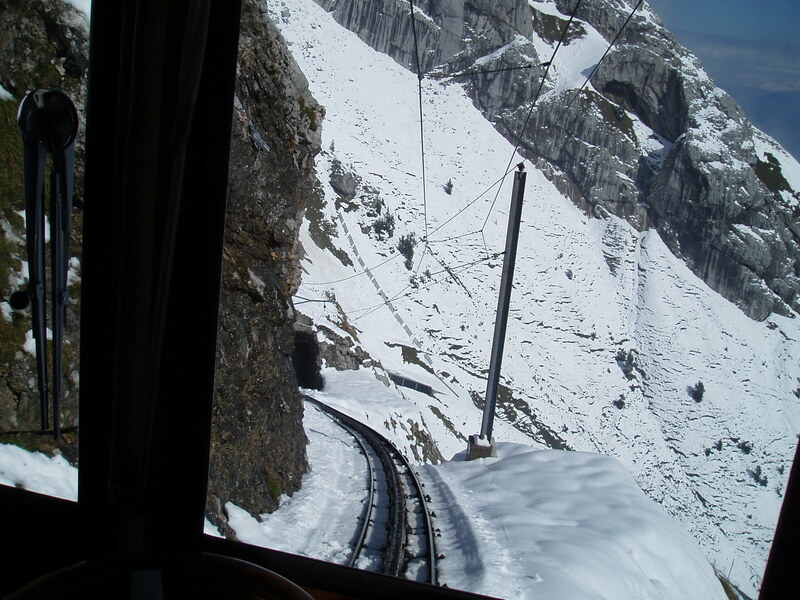 The next day we went on the boat to catch the “Steepest cog train in the world” up to Mt Pilatus. Oh my goodness – what a day. Honestly I think the pictures can tell the story. It was magic. We were breath taken – literally. 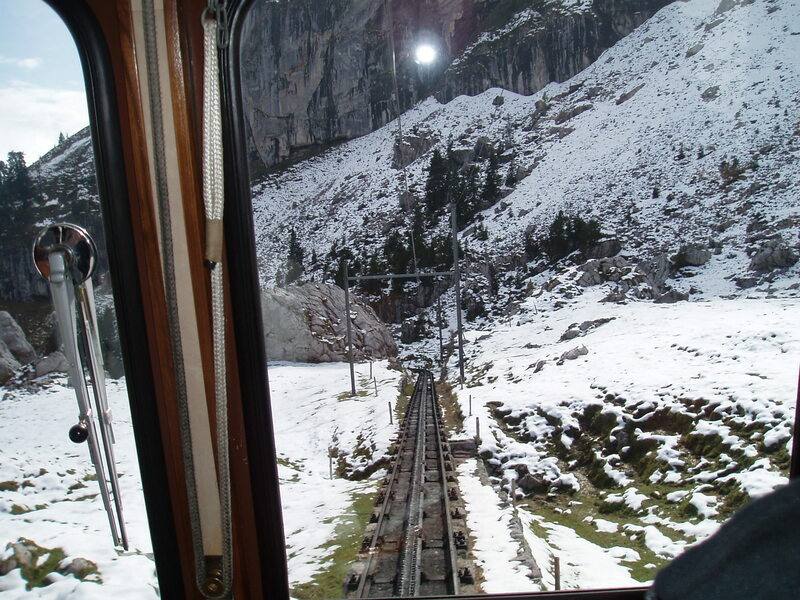 The train goes at 45 degrees most of the way up and 47 some of the way. Unfortunately (for him) there was an English man who was literally terrified of the trip but we loved it. It was magic. After exploring and looking around we had lunch up there. 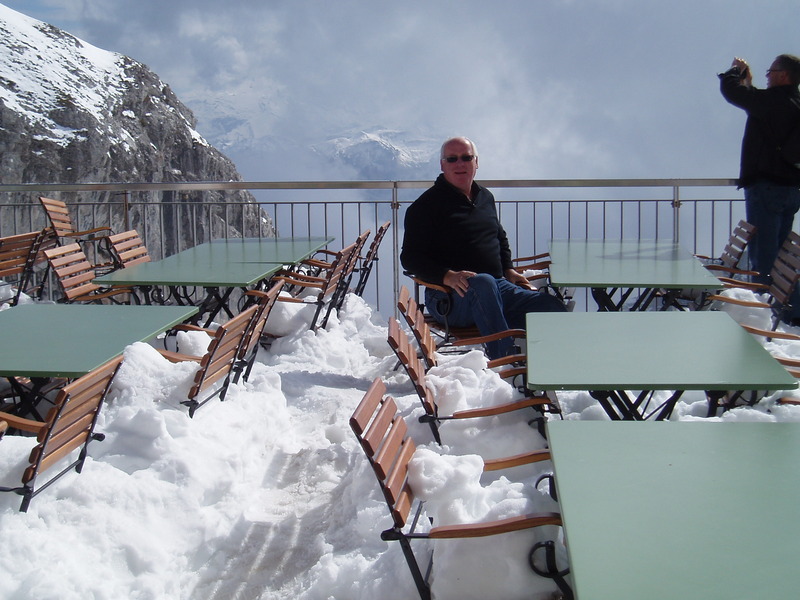 What an amazing experience – the views the food……….. Then………………………….GULP! 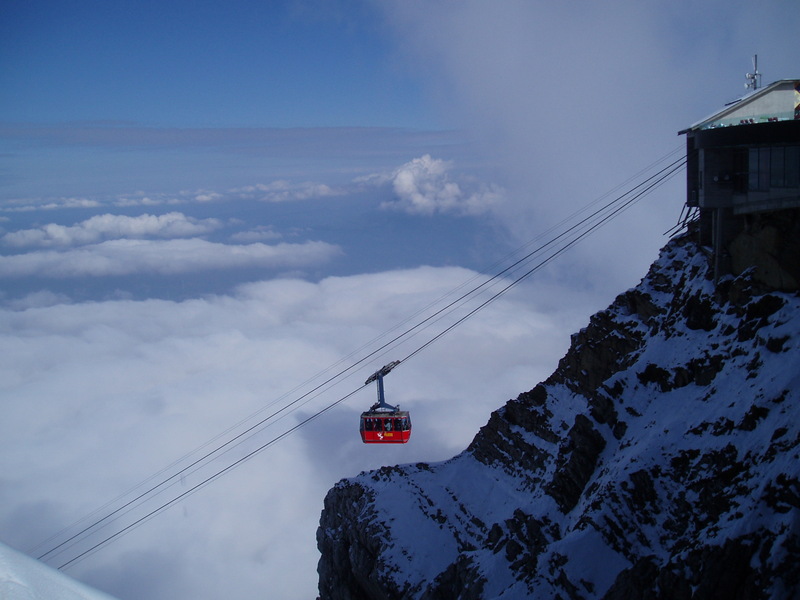 Time to come down – on the cable car – not like one we’ve ever seen! But I did well…….. and Peter was great talking me down. Can you imagine yourself on this one…………. 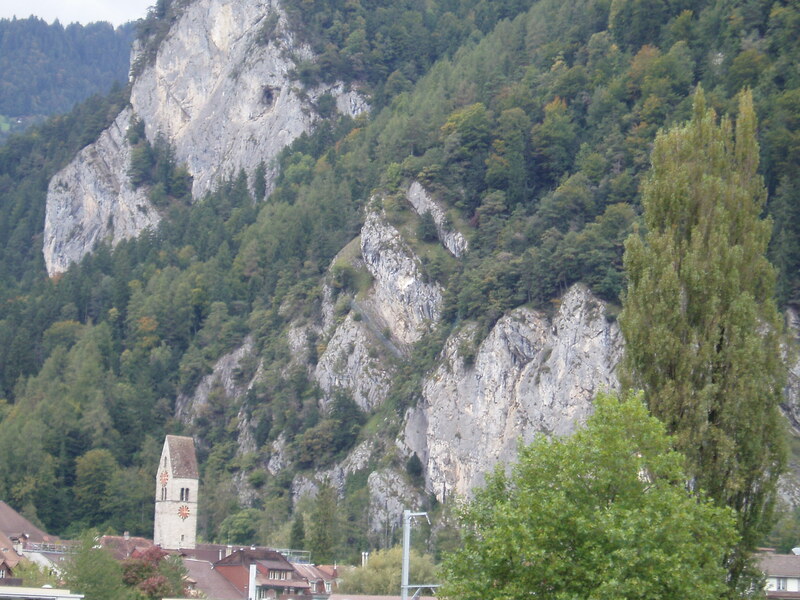 Switzerland was so beautiful. Also had amazing linen – I couldn’t quite help myself especially with the Christmas pieces………. 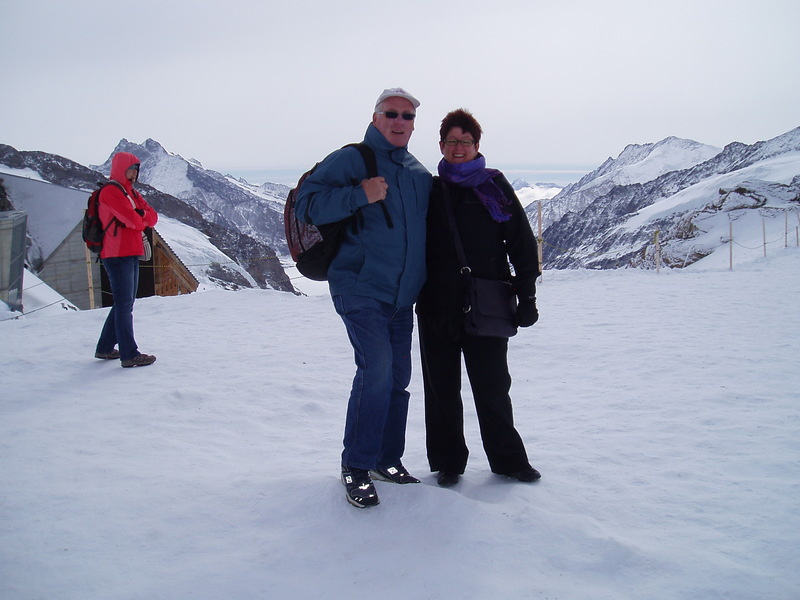 Hard to explain the difference of the country and exactly why it affected us so much ………… maybe the change in seasons to smell the autumn, maybe the colours, the snow, maybe the reminder of Queenstown / Fiordland…………….. who knows but by golly, we have LOVED it! Yes,,, it is minus 8 plus wind chill here. Hope all is well with you all in NZ. It was so exciting (well for me anyway!) 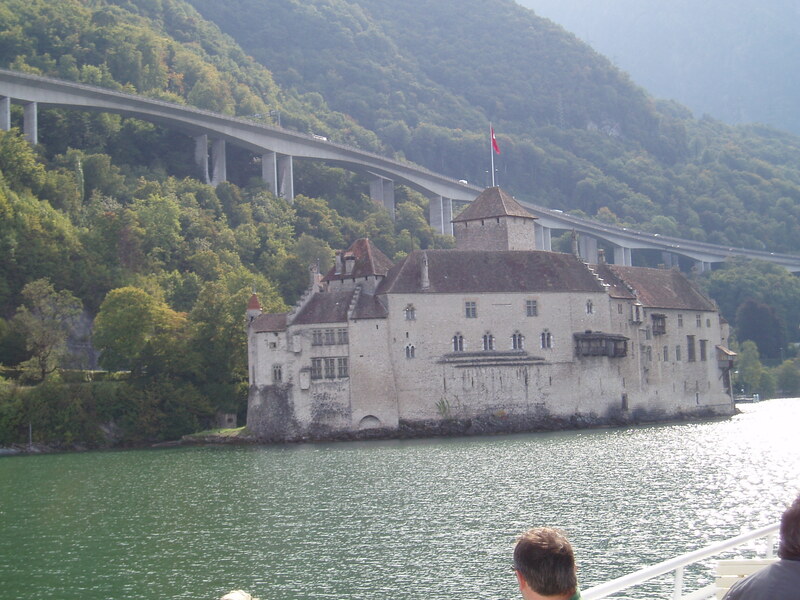 arriving in to Switzerland. 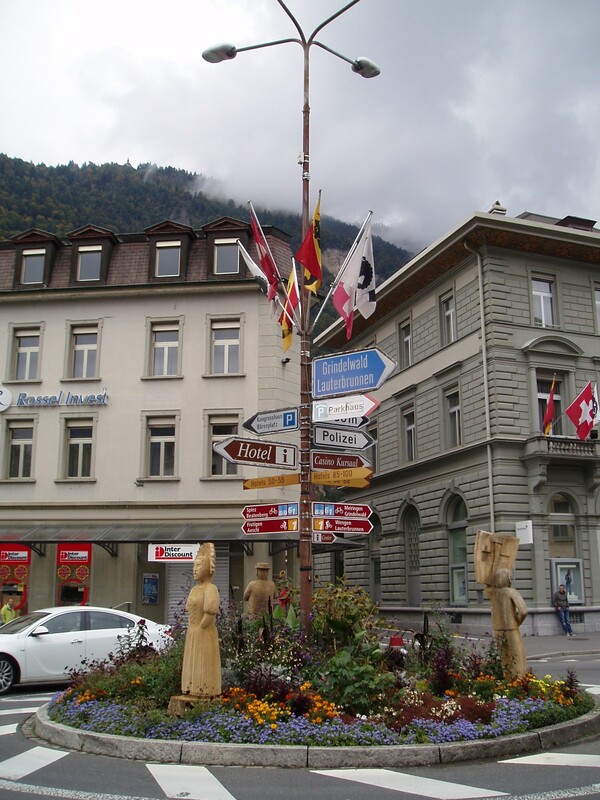 We stopped at the border to exchange money as although Switzerland is part of the EU they still use Swiss Francs – very pretty money I must say. 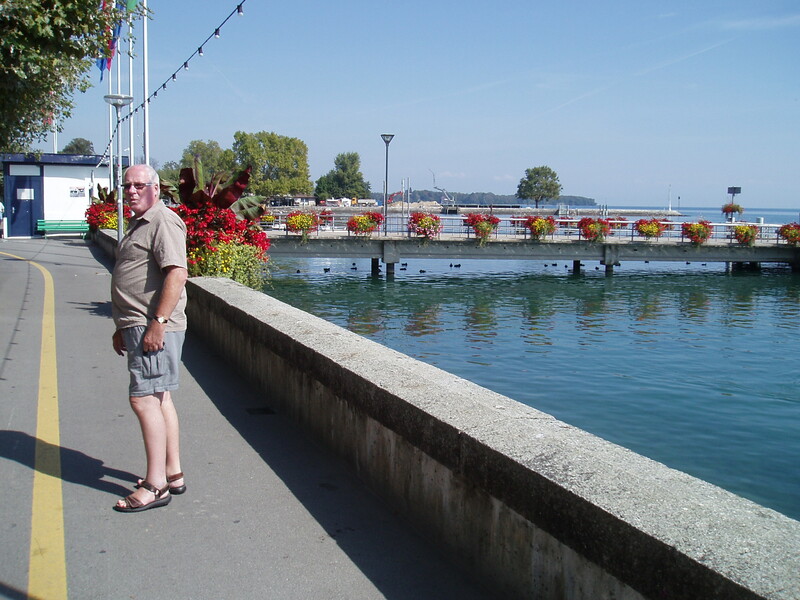 Then up the side of lake Geenva where we stopped off for lunch at a small town called Nyon. We had tried to get accommodation there but all was booked out. We had lunch on the shores of the lake at a Mexican café. So, our first meal in Switzerland was Mexican! We thought that was very funny – and it was also very good too! We were of course still getting used to the new money and Peter bought a day’s parking for 7 Franc instead of an hour. Made us laugh. 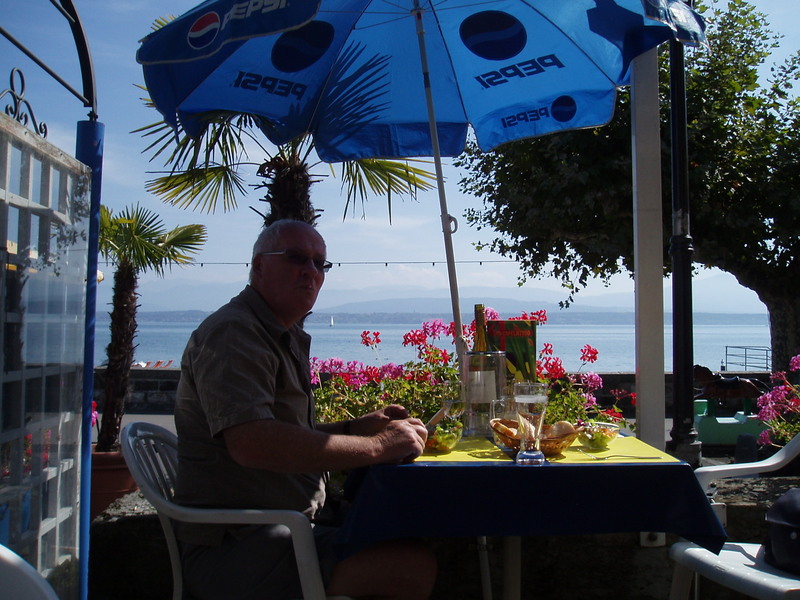 Peter having Mexian lunch in Switzerland! 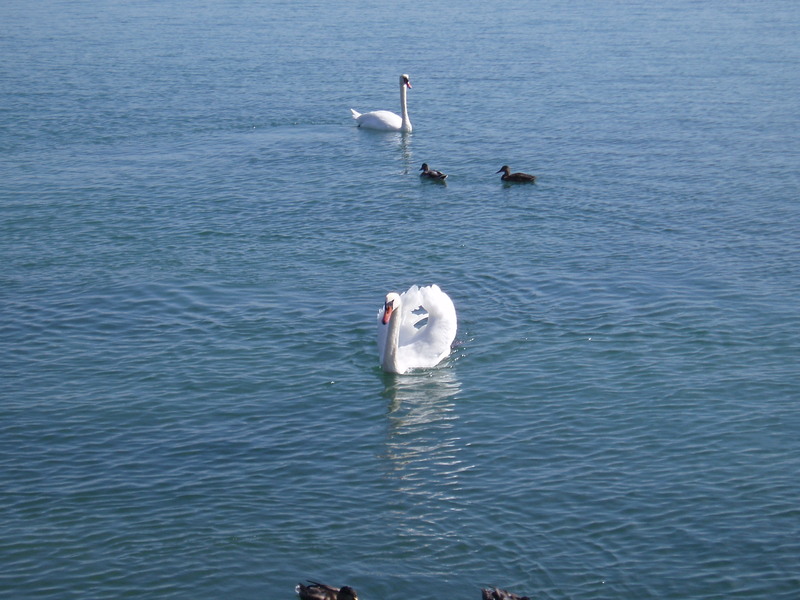 The swans were so pretty – and so many of them. Swan with wings up - he was flirting with a girlfriend swan! 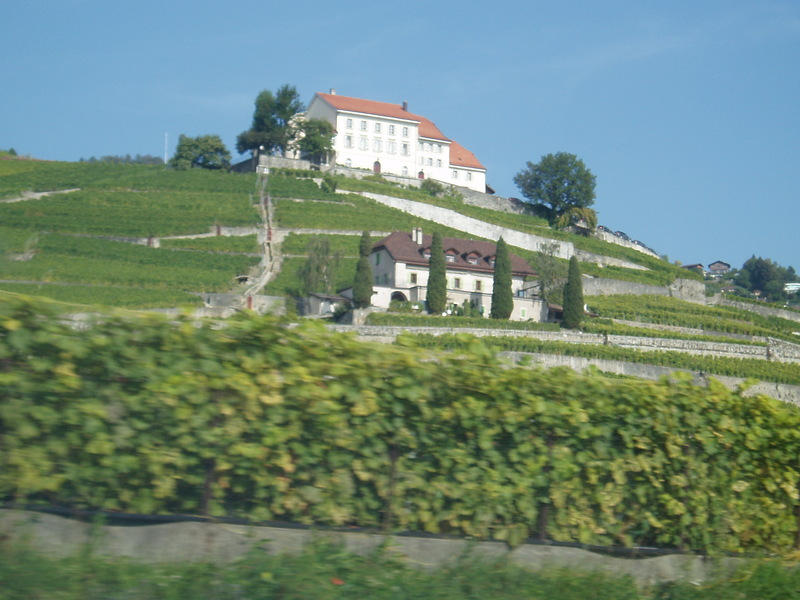 Then drove up via many beautiful vineyards and lake views to our hotel in Vevey. WOW. We had had so much trouble getting some where to stay we landed this one – a bit more than we’d usually pay but it did have lake views. And what a pure treat. From the service, which was amazing and informative, to the views, linen, the building itself (built in the 1800’s and still a private family hotel) to the food (of course!). 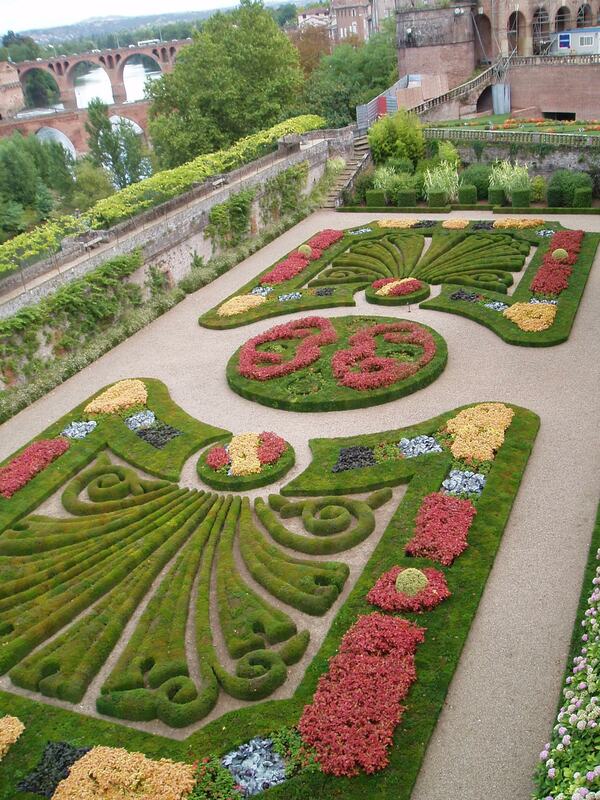 And the decoration, the flowers, the carpets……… A pleasure for all the senses. 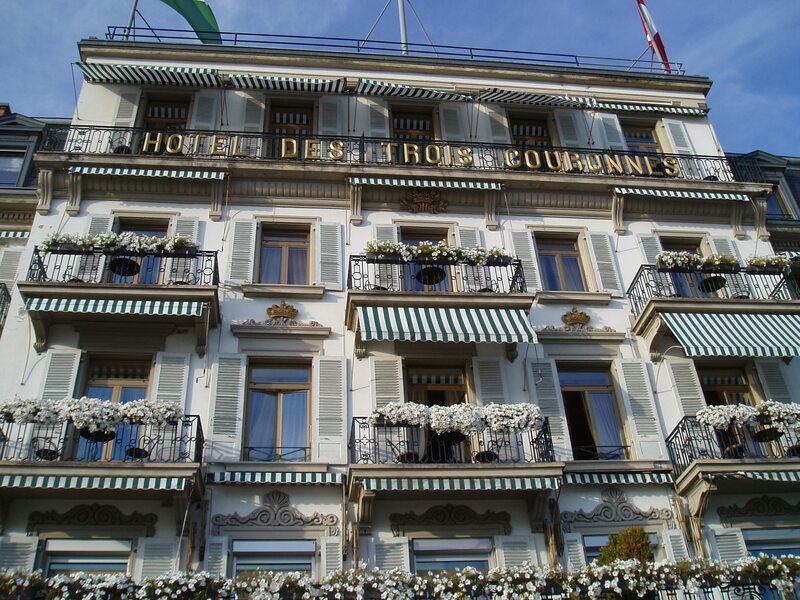 Vevey is where Charlie Chaplin lived for the last 25 years of his life. 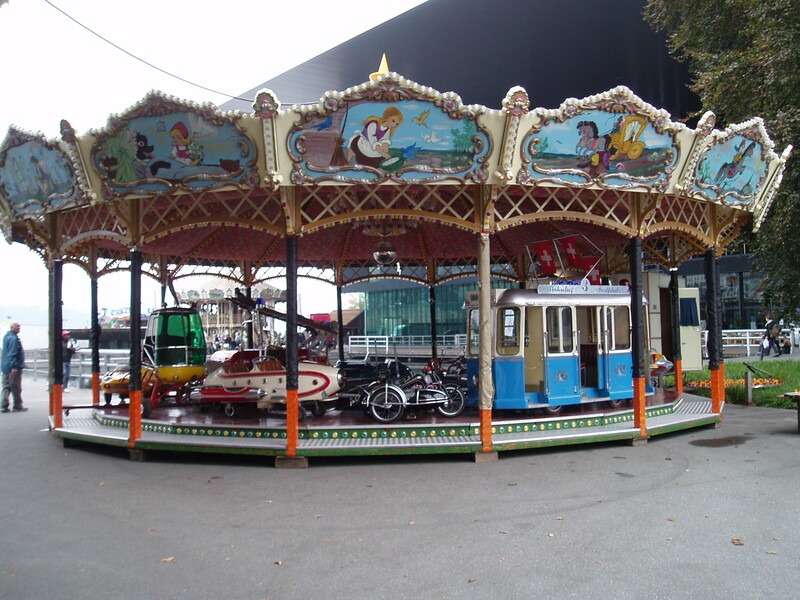 They also have a food museum hosted by Nestle. The first night we ate at the hotel restaurant, after having a drink out on the terrace overlooking the lake. Food was amazing – Peter had fish three fish courses! 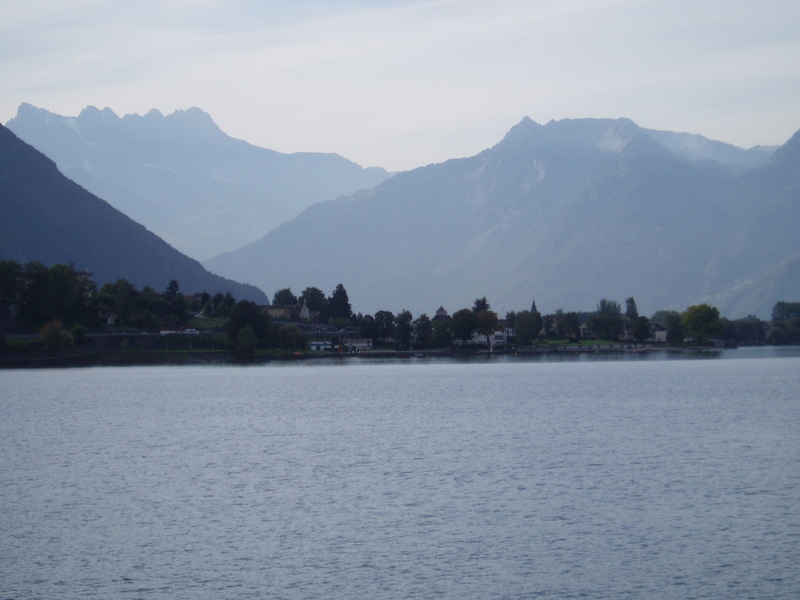 The next day we went on a boat trip up the lake – it was lovely to see the villages and towns from the lake side. By now it is truly autumn – and the colours are starting and the light is autumnal. So very pretty. But a little cooler so for the first time we are wearing a jersey or wrap at nights. After the boat trip we walked the promenade and ate lunch. I had my first crepe over here – I meant to try one in France but hadn’t and it was lovely – filled with parma ham, potato, cheese and local herbs. 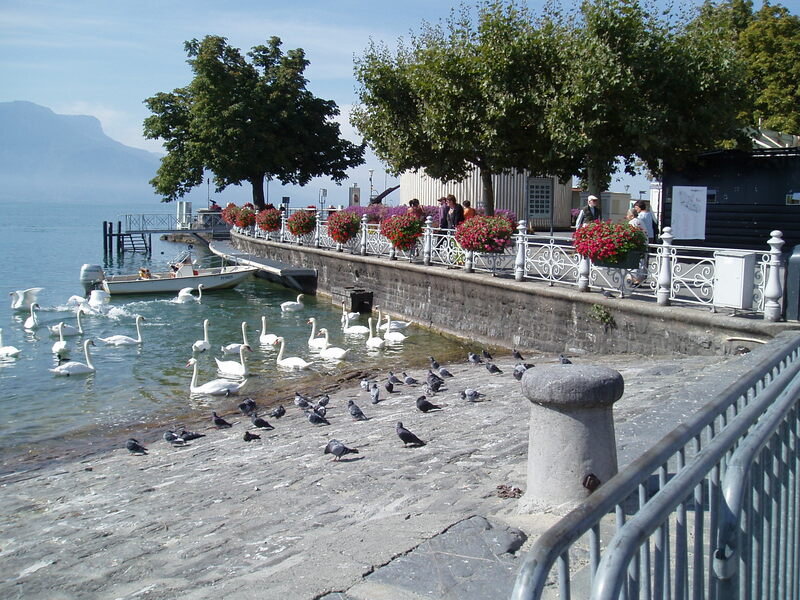 We sat watching the lake, local buskers and enjoying the sun. 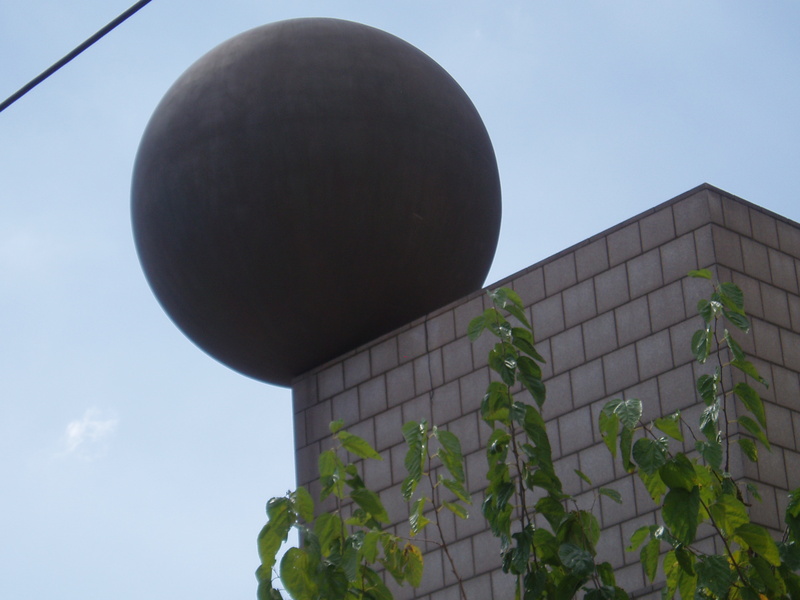 That afternoon we looked at a few local sights including an international art exhibition – unusual photo and film images. Very striking – for example subjects like the damage the mafia does to oil and money in Africa…… child workers in India and all in between. I then went to have my hair cut and colored. Well, that was interesting in a foreign language. 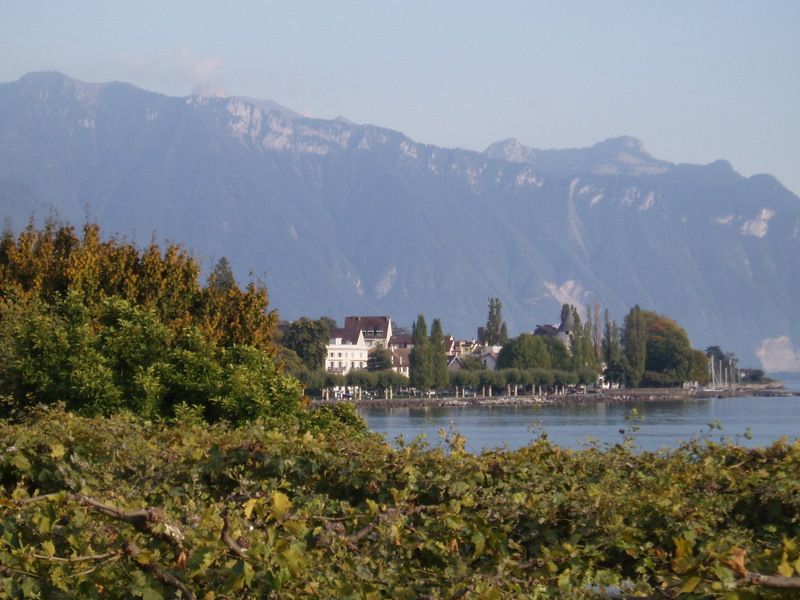 In Vevey French is spoken so at least I could say hello and thank you! The hairdresser and I had some time “liaising” about what color and in the end she asked another client who spoke English to help translate. What an experience overall – I received no less than FOUR head massages as part of the visit, the last being a Zen one – which was so slow and gentle I nearly went to sleep at the basin. At the end I am thrilled to say I love the “hair do”. That night we decided to eat on the terrace at the hotel – and watch the moon come up. It was a little cool but so pretty. 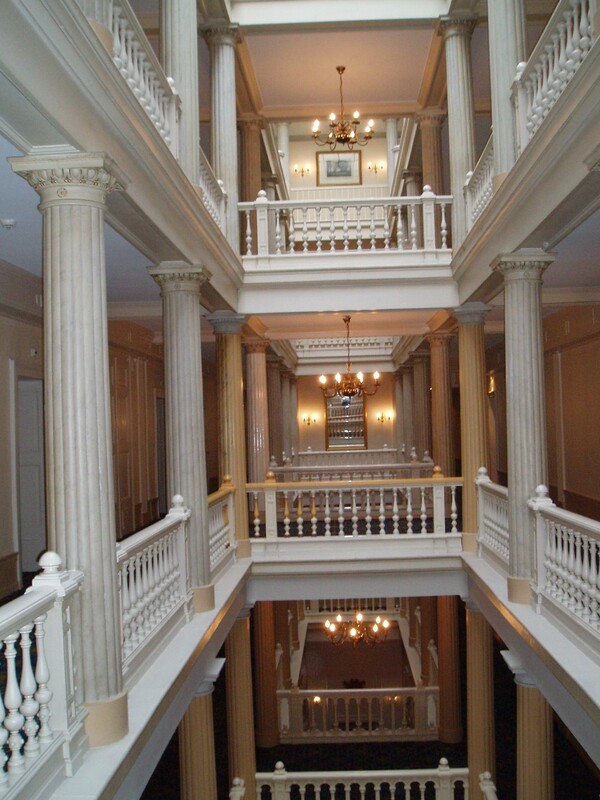 The hotel was so amazing it seemed a shame to leave there. We both had Asian food, which reminded us how much we miss the amount of Asian cuisine we have in NZ. 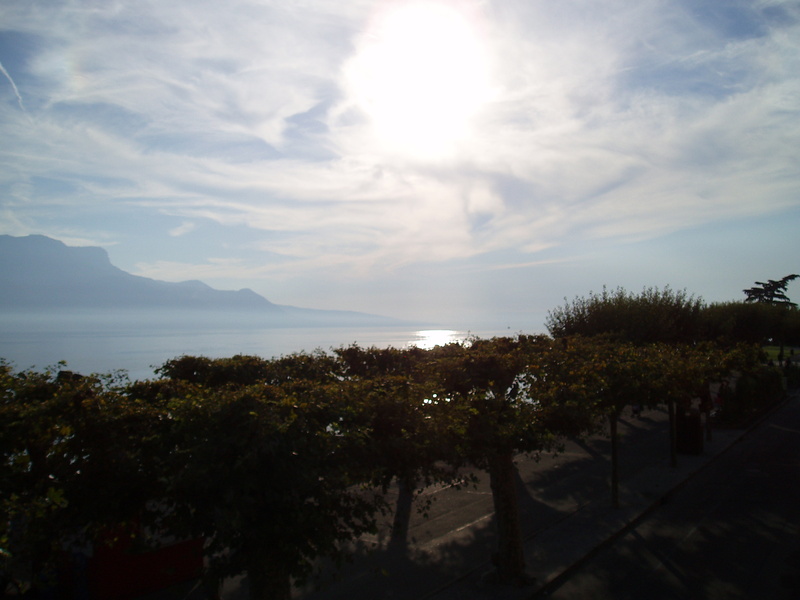 The next morning up early for a walk along the promenade………. It is such a pretty spot. Lots of locals fishing and walking too. We had to say good bye to the lovely staff and off on our way to Zurich. It has poured with rain ever since we arrived. The first time we have seen such heavy rain since we left NZ! 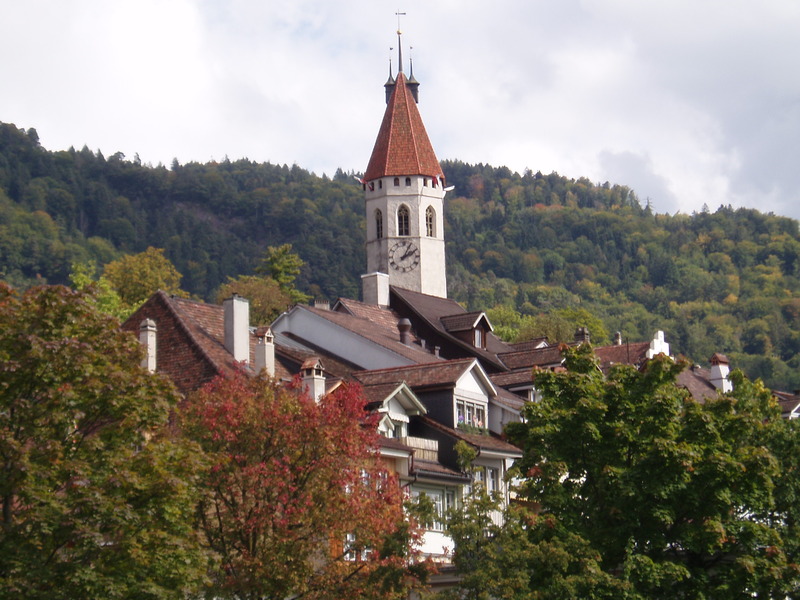 The first thing we did after checking in was go to the train station to sort our tickets for the “tops of Switzerland” tour which starts tomorrow. 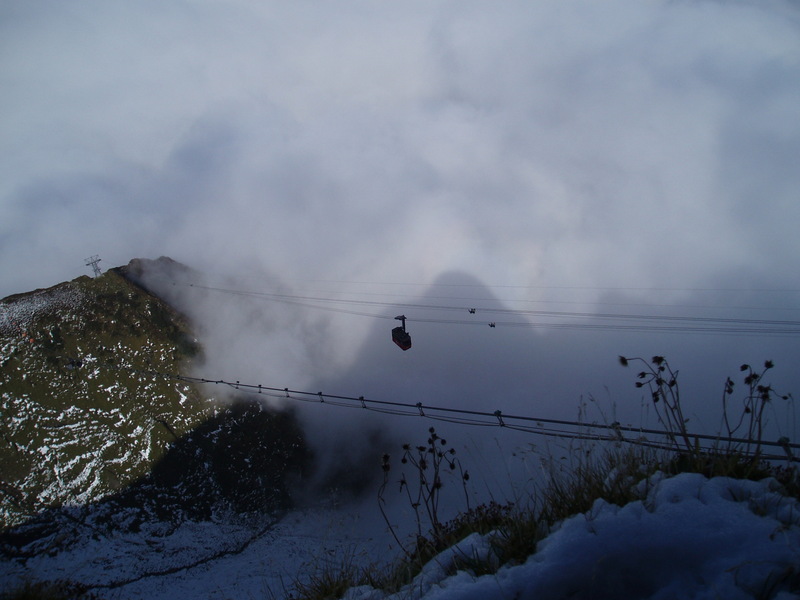 We have every finger and toe crossed that the weather forecast for more rain and mist to be wrong – or we will see nothing from the top of the Alps. 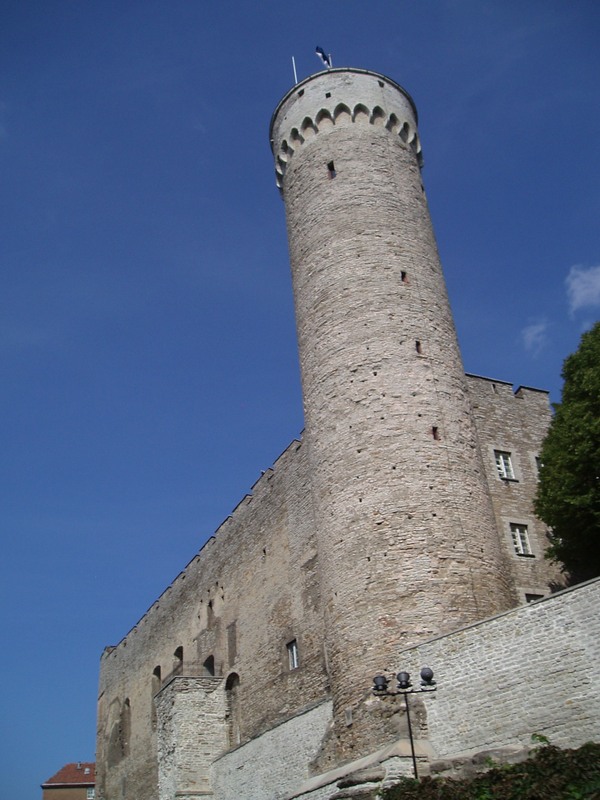 Today has been a catch up day and sorting travel in to Germany and Luxemburg for the next month of travel. 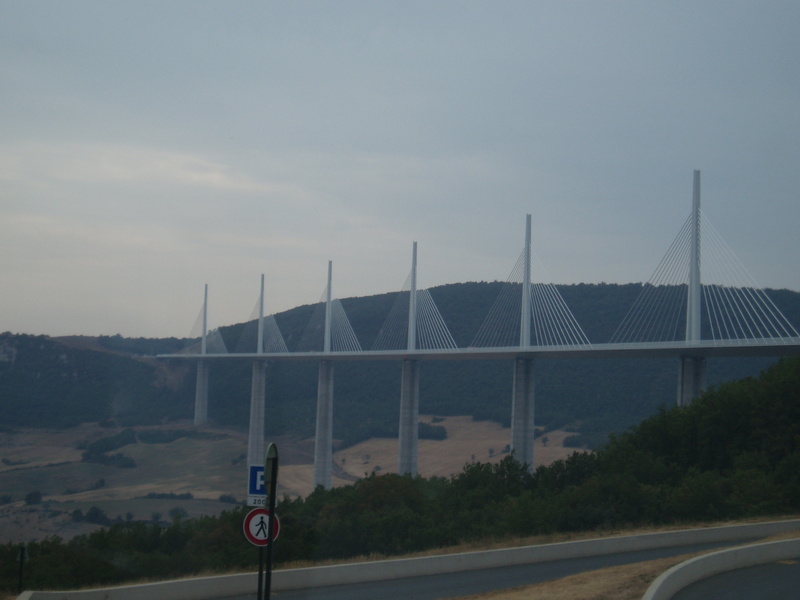 And more of the last of France………….. the very last! 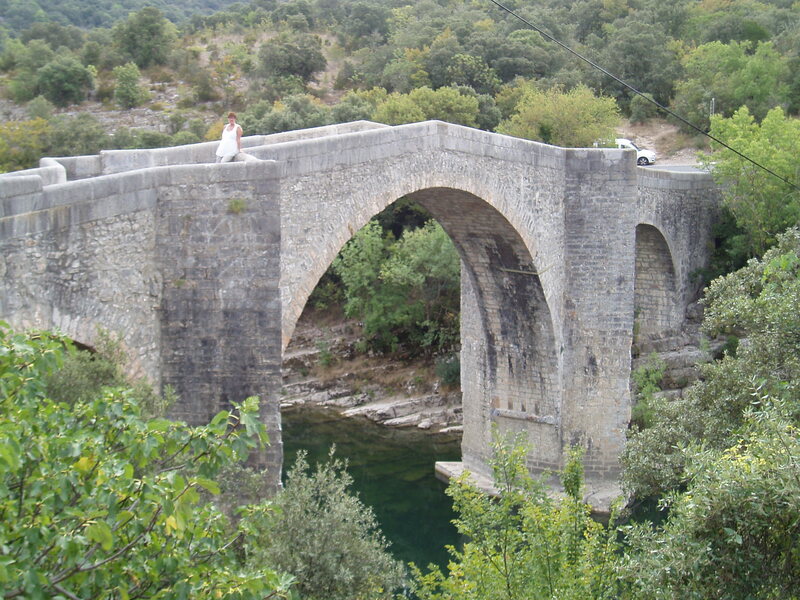 As we were leaving Saissac we bumped in to Catherine – “Bon Journey” she says. “See you in Dublin” we say. What laughter! As Catehrine will be in Dublin teh same weekend we will be for the ALL Black game………. 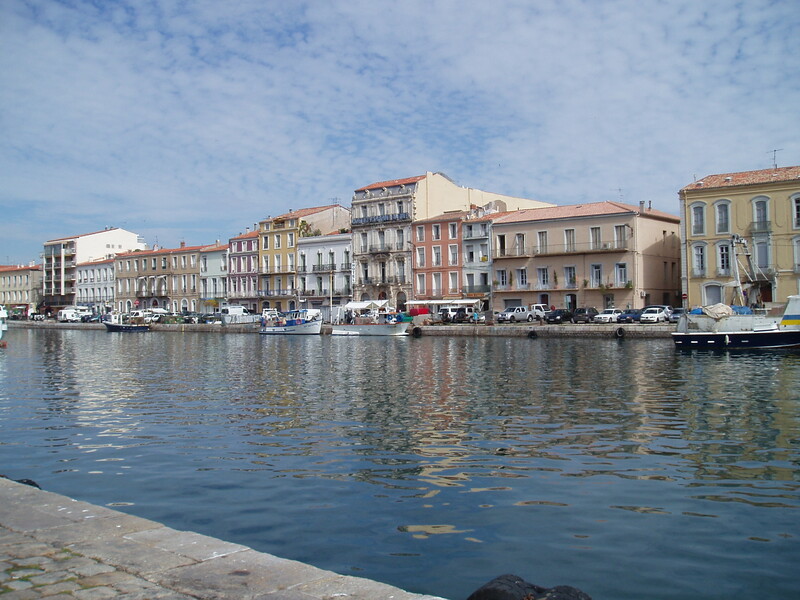 We drove from Saissac to Sete (pronounced Set – 3 hours drive) for lunch. It is on the coast and it was pretty – huge sandy beaches. 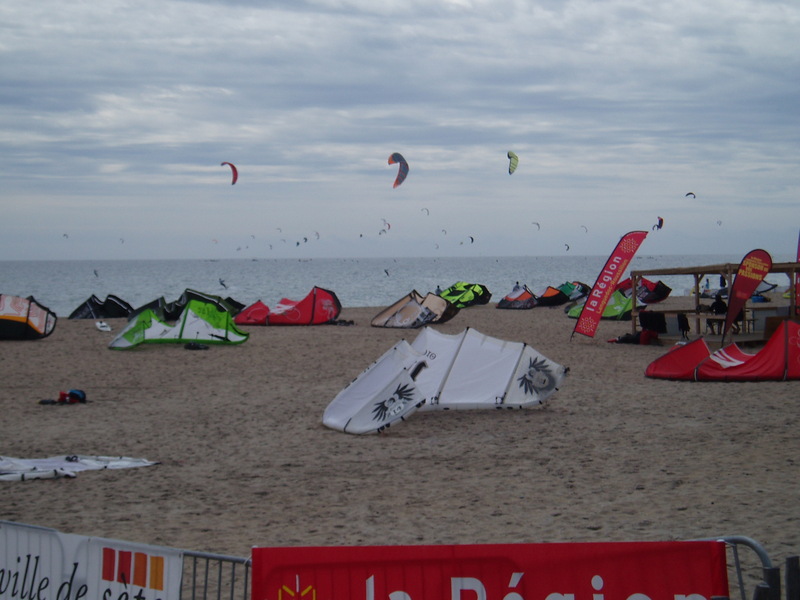 We came across a wind surfing competition and it looked amazing – so many kites. Yes, all those little balck dots in the background are kites too! For lunch Peter had a whole fish and I had pizzas – the pizzas are great here – different than at home with the tiny bases and interesting toppings. At lunch we had an interesting conversation with a French woman whose sister is the Perfumeries for the Queen in England! I never knew such a job existed! 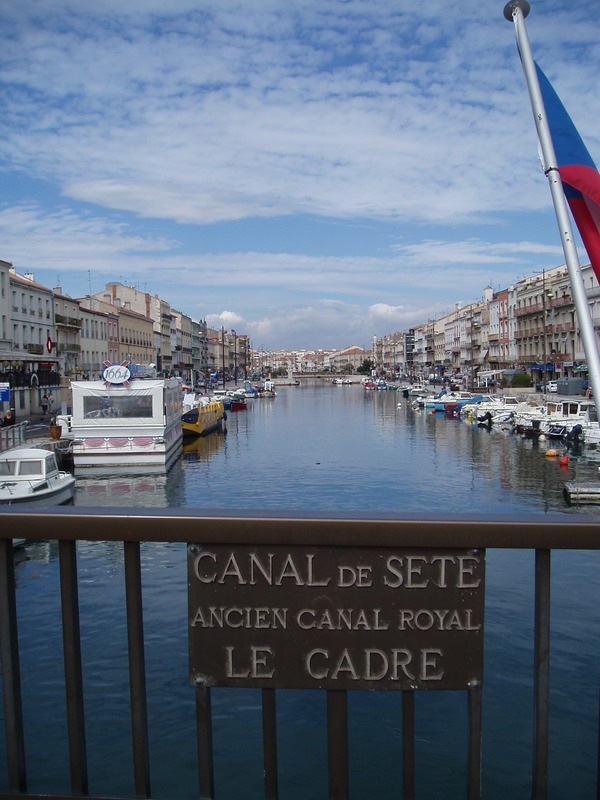 From Sete to Arles (pronounced Are-ll) for the night. 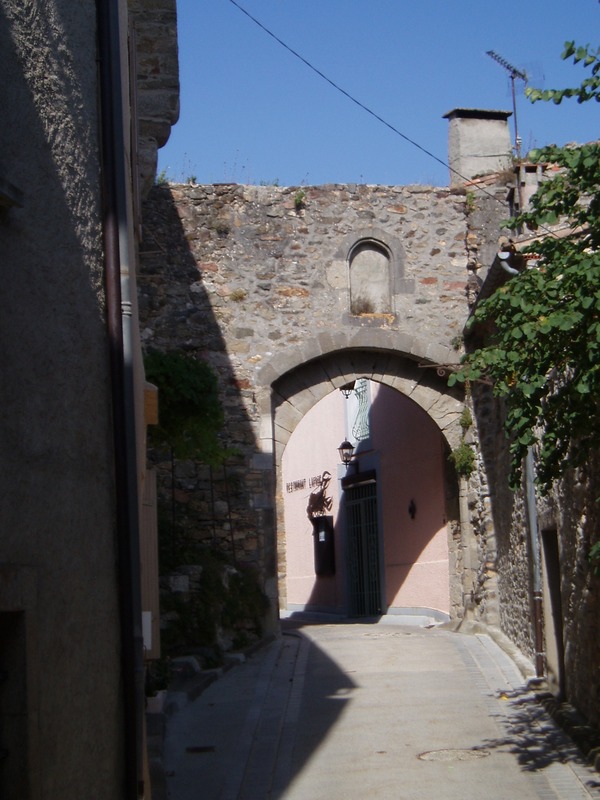 Oh dear – it is one of those towns that has the old city centre with TINY NARROW streets (narrower than most of our footpaths!) and the new city (which looks VERY old to us from NZ!) The GPS tried and tried to get us there but many of the old town streets are closed for us and open only for residents. They have large metal poles in the middle of the streets that residents scan a card or something and the poles disappear for a minute while they drive through. 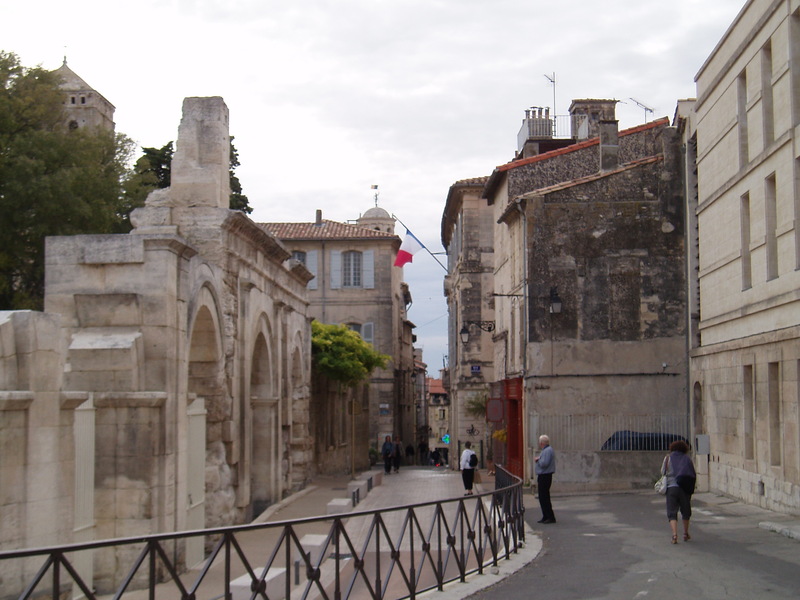 Arles street view - we drove twice before walking it to find hotel! Sooooooooooo, after an hour of trying to find the hotel we parked and found it by foot. Luckily we were quite close as we had to carry our bags from there. 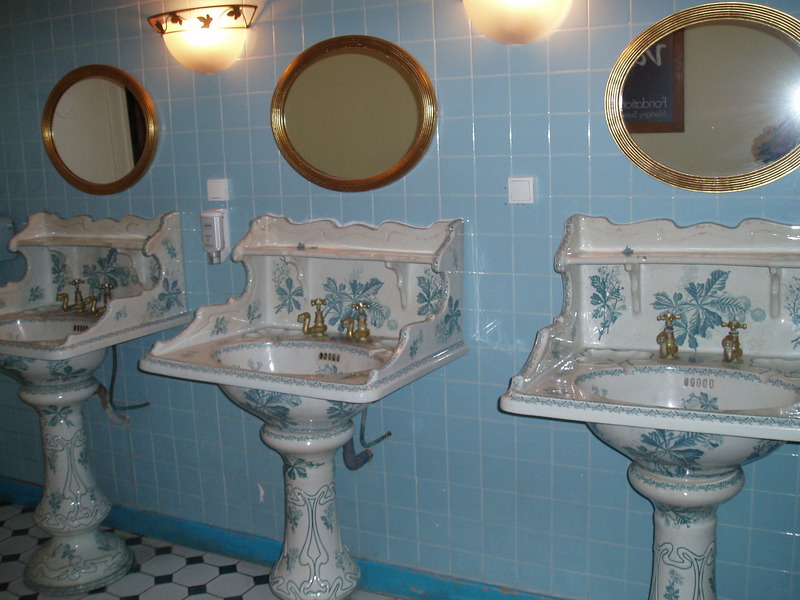 The hotel was very old but check out these hand basins in the toilets at the bar! And the security system we weren’t so sure about. When we arrived back after dinner there was no one at reception so I leaned over and picked up our key…… now anyone could have done that I am sure! We had asked at reception re a restaurant recommendation. 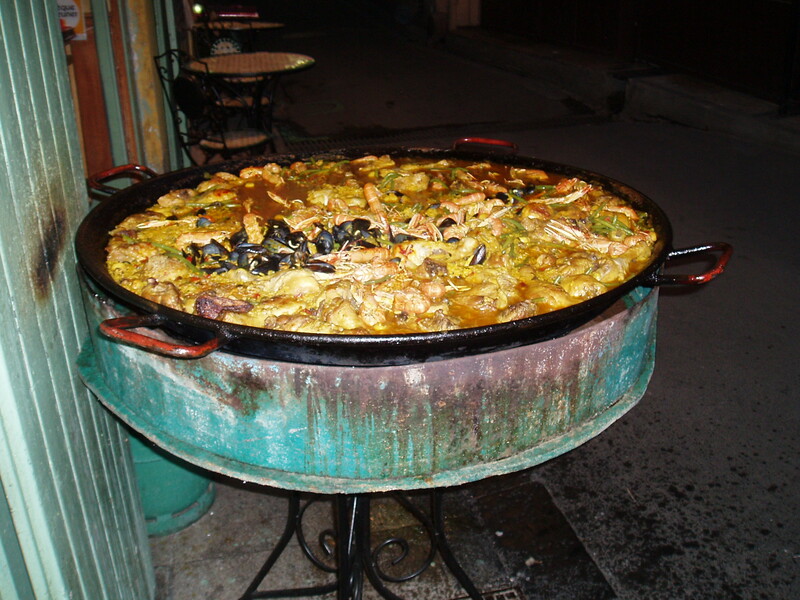 On our way we passed a street seller of paella – check out the photo and make sure you look at the back of the photo to see the size of the chairs and table in the back in relation to the paella dish! It was HUGE! 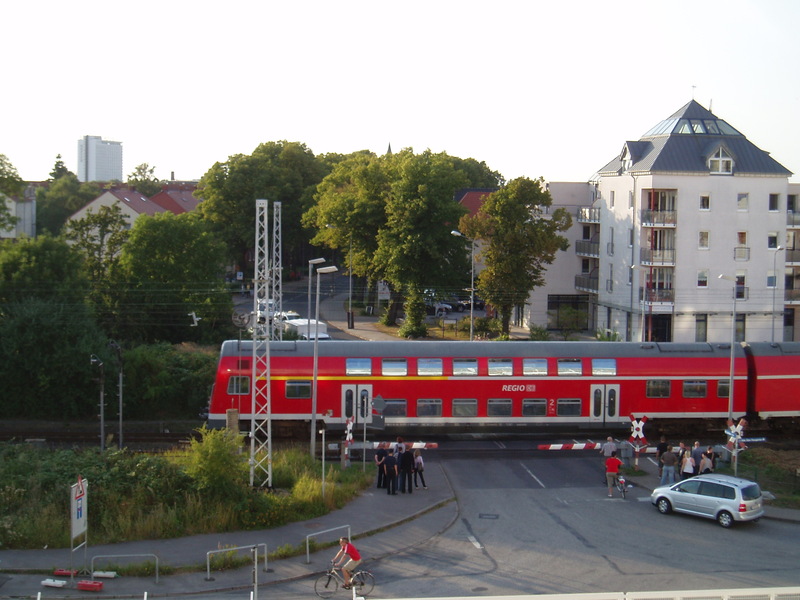 We were lining up to take photos of it! So off we go to the recommended restaurant to be told no tables till 9pm. So we agree to come back. Had a drink in the meantime and then went back. What a stroke of luck- we got seated next to a young French couple who were celebrating their Civil Union that day. She is a mid wife (they told us a “middle” wife but we got the meaning ) and he an artist. We had a wonderful night with them as they spoke relatively good English. Had many toasts, digestives, etc. and the food was great. Peter had guinea fowl and I beef with the most amazing morel sauce! 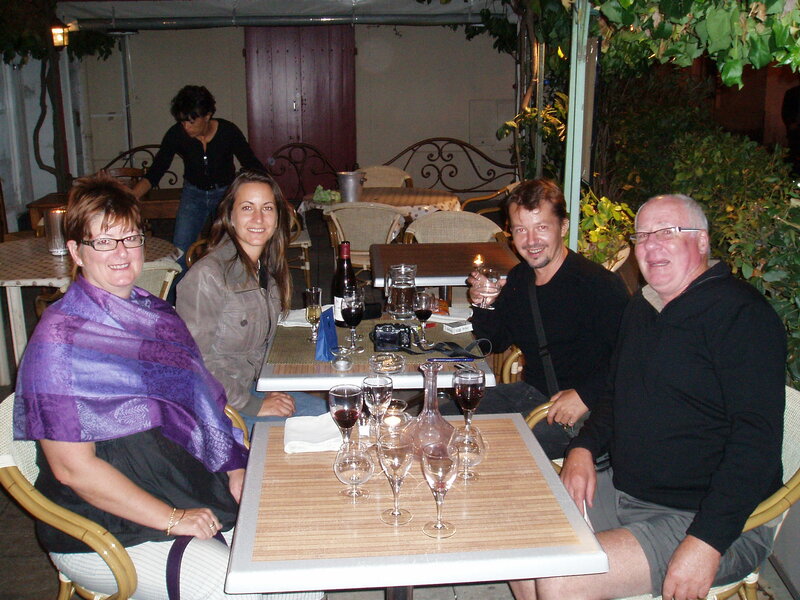 Friends at dinner - Arles! The next day it was the “biggest market in France” apparently on in Arles. 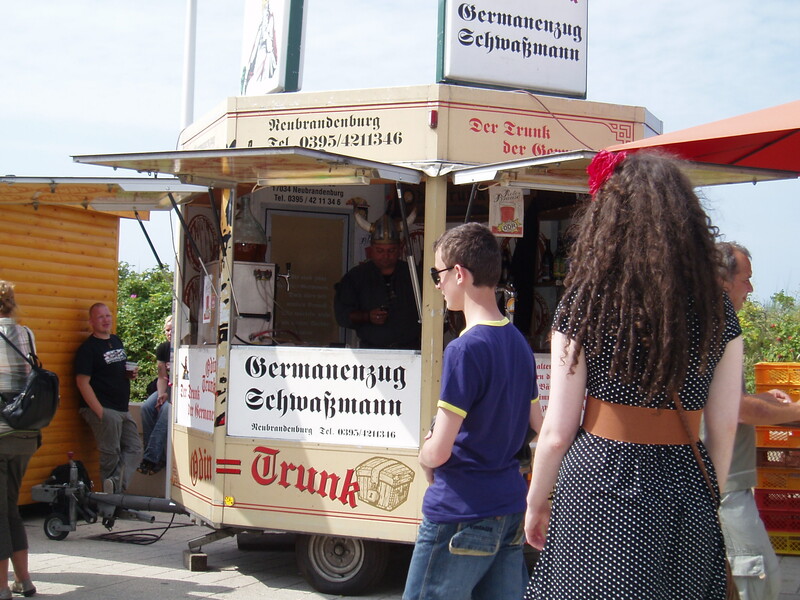 It was huge – the food side amazing but the clothes and such I am not so sure about – a bit “tacky”. I had “chocolate tomatoes” – they are black in skin and tasted just like ordinary tomatoes – the woman seller was highly amused all I wanted to buy were 4 tomatoes! Cost 50 cents you know! I didn’t like at all the cramped cages and cages of hens, coqs, baby ducks, rabbits, guinea fowls etc for sale. Exit, stage right, quickly! 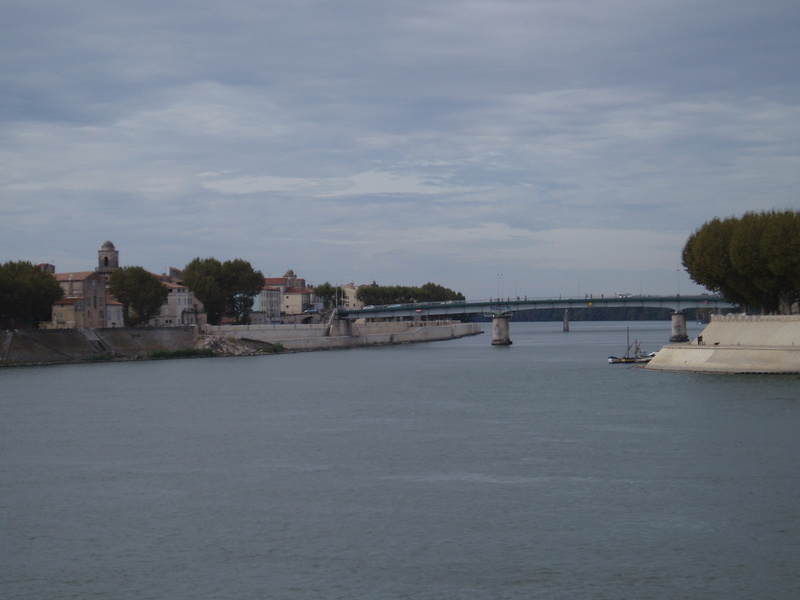 Then we left Arles and went to Orange for the night. For some reason I have always wanted to visit Orange – not sure why – probably something I learnt about in school girl French classes. 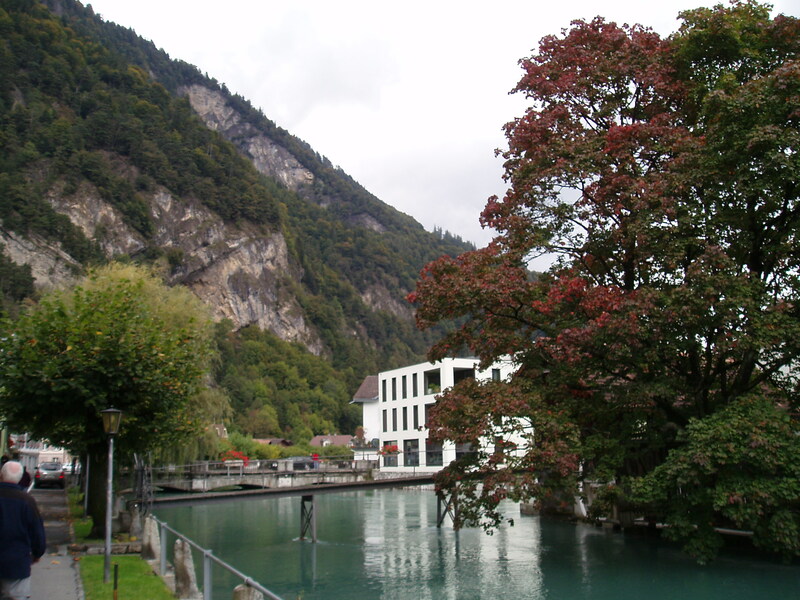 It was a pretty but not much happening town – probably explains why all but one of the hotels there are 2 star. We stayed in the 2 star hotel which was adequate but again the room keys were actually hanging in the foyer for anyone to take! The town has an amphitheater which has amazing concerts apparently. We ate at a lovely restaurant recommended by the hotel. Peter had foie gras hot and cold for his entrée and I, fava bean soup. 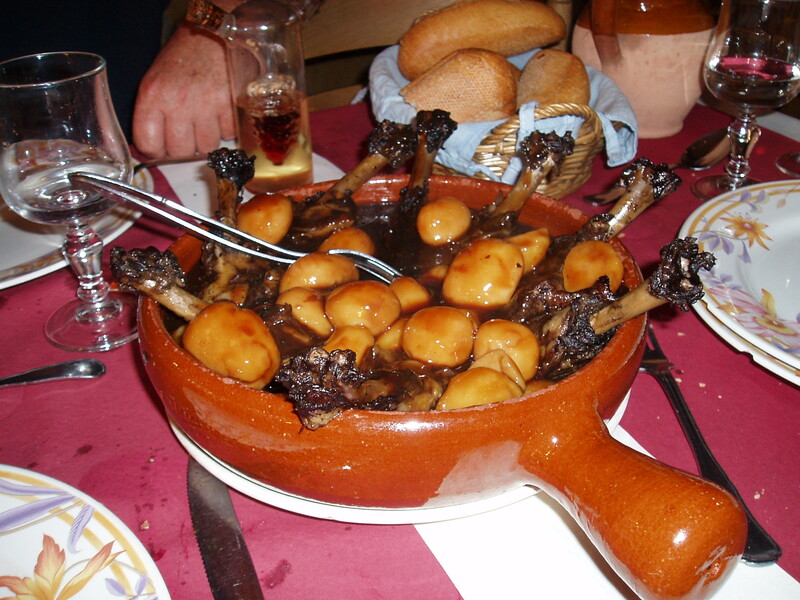 Then for main Peter had duck with mushroom sauce (he said very lovely) and I rabbit served with quenelles of quinoa and sauce. Mmmmmmmm. 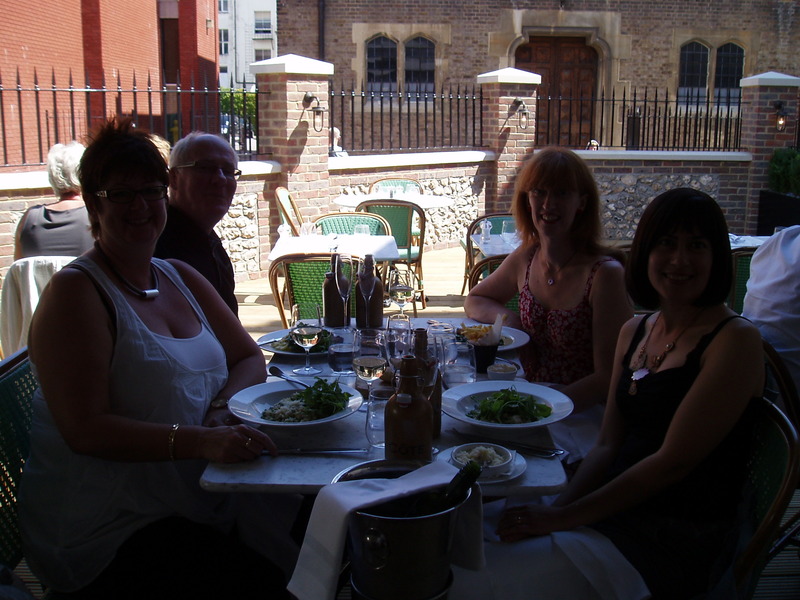 The waiter was excellent and beside us was a table of 10 women from Sweden – on a cycle tour of France. They were having a great time and we enjoyed their laughter and antics! 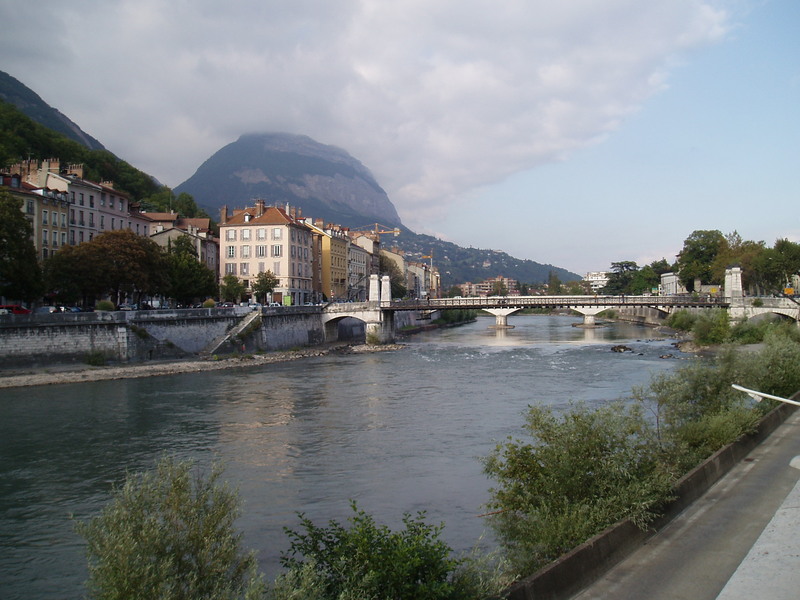 The next day from Orange via the Pont Du Gard to Grenoble. 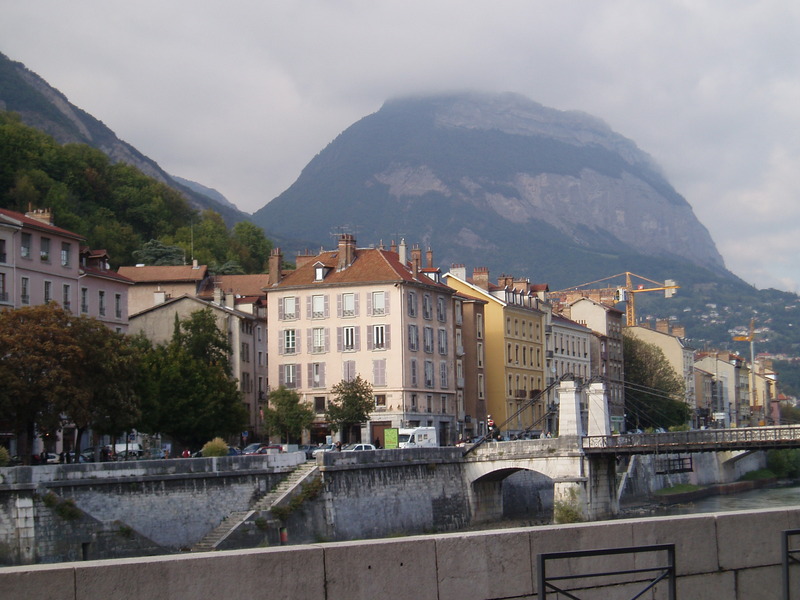 It is such a beautiful little city and we loved it – thought we could live there. 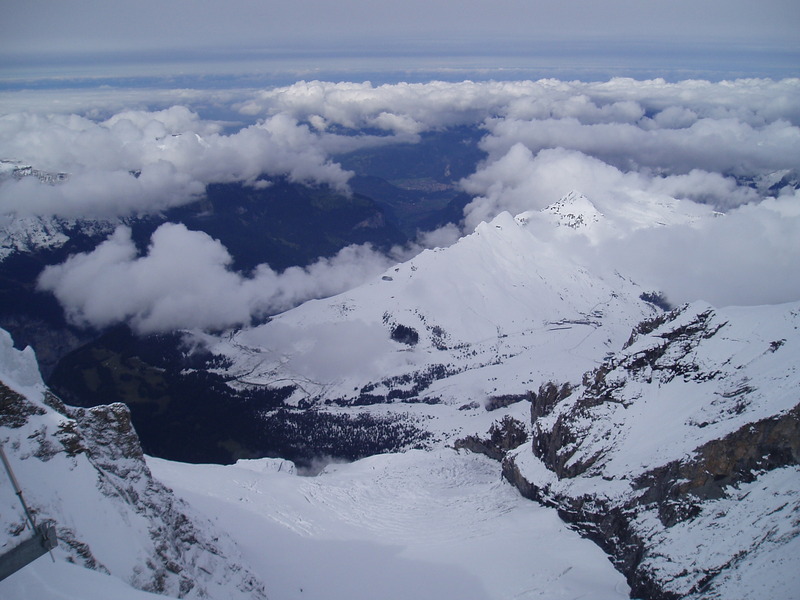 In the heart of the French Alps – summer is hot winter is skiing and snow. 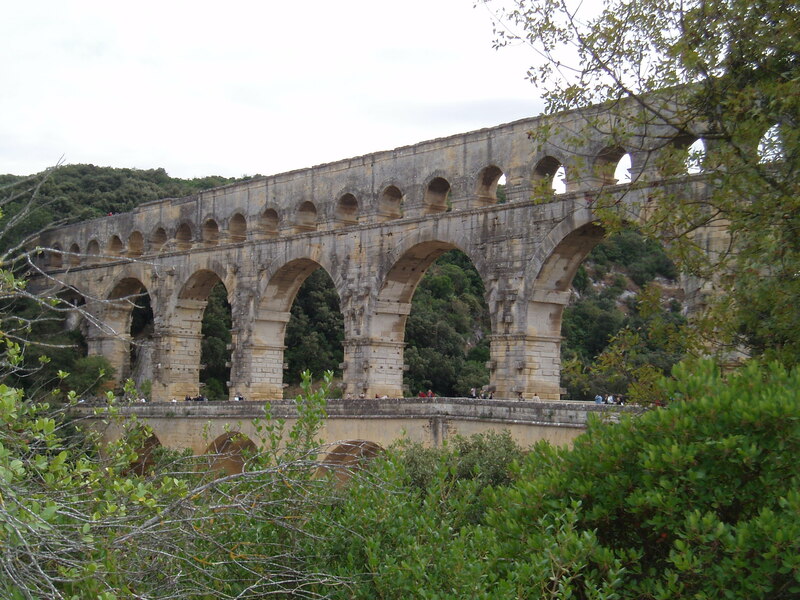 Anyway, Pont Du Gard. 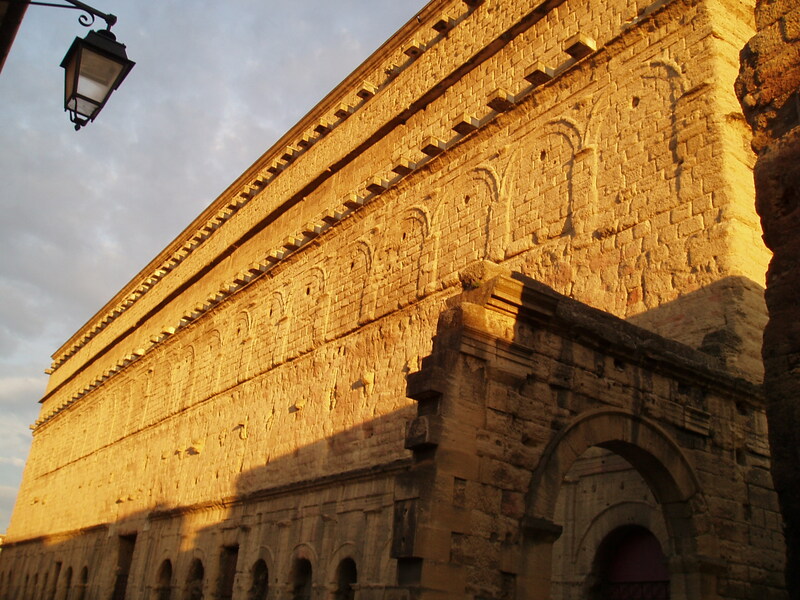 Built in 50 AD and an amazing size. We were awed! And that is saying something with all the ruins and Roman sights we have seen in the last 5 months. Pont Du Gard - see size of people in relativity! 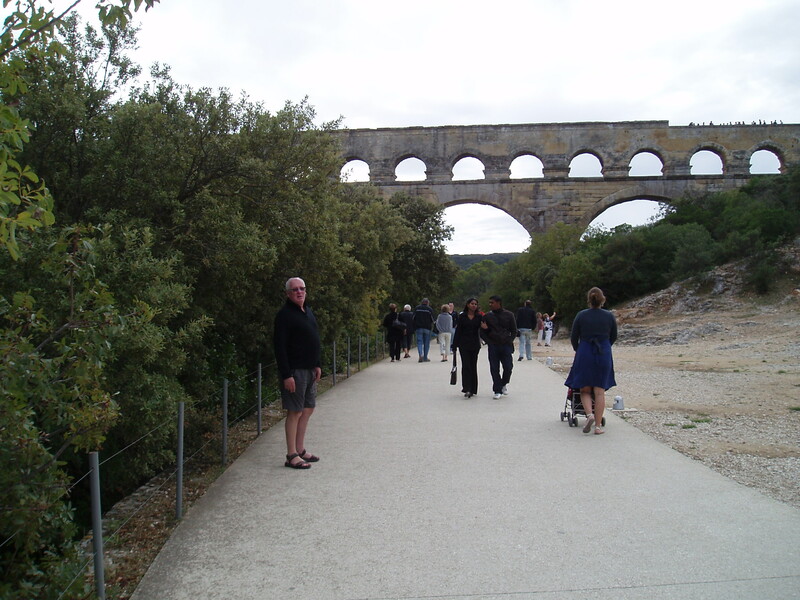 Peter at Pont du Gard - notice people on top right of the pont - tiny figures! 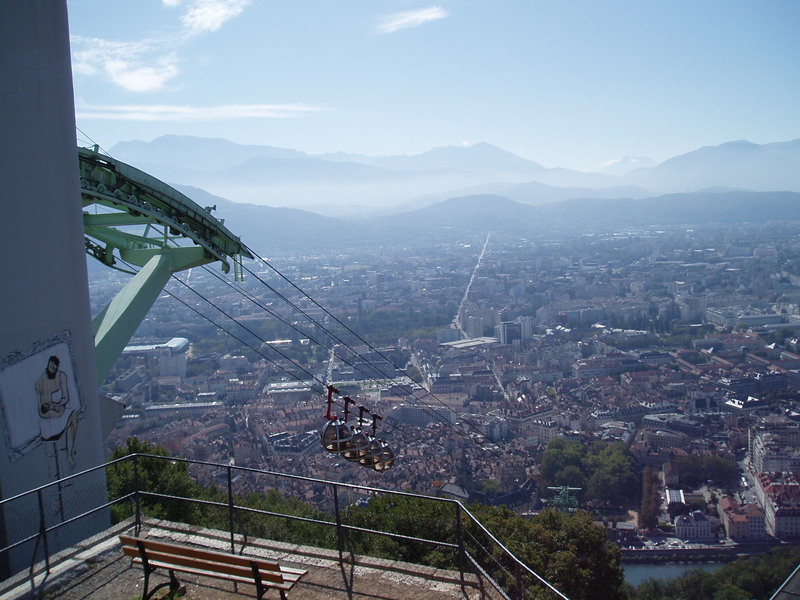 From there to Grenoble. 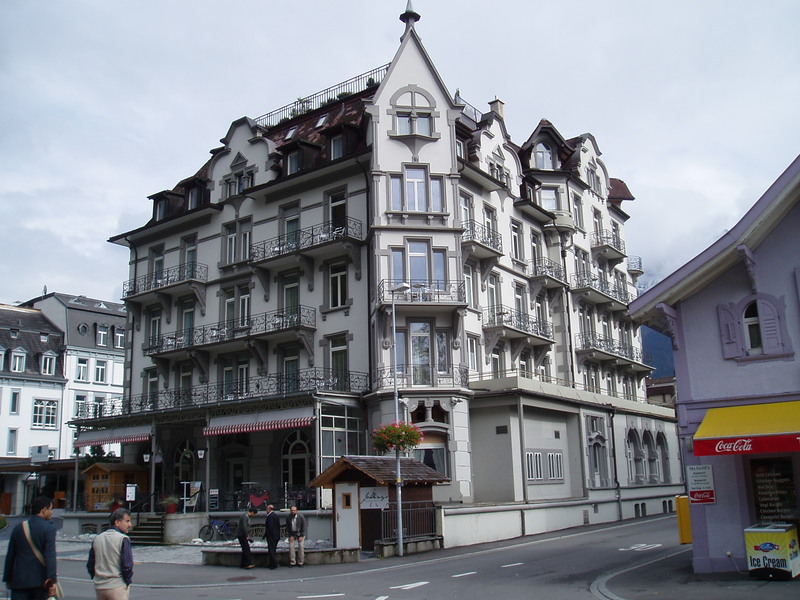 And happens I had booked a new hotel – so from ancient old things to brand new – it was a new experience for us! The smell of new paint! Plasma TV! Clean carpet! Oh la la! And the other new thing for us was that the car parking was under the hotel and you had to use a car lift to get in to it. So, drive in to a lift, doors close, (like you are in a capsule) and slowly you are lowered in to the basement. Very odd sensation in a car. Peter with glass of beer! and a burger and I got what they told me is the local specialist – ravioli! But not like I have ever had before – it was tiny tiny tiny – like the size of your small fingernail. And it was delicious!!!!!!!!!!!!!! The next day we walked along the beautiful river walk to the cable car station, to go up to the old fortress on the hill. What a view! What history! 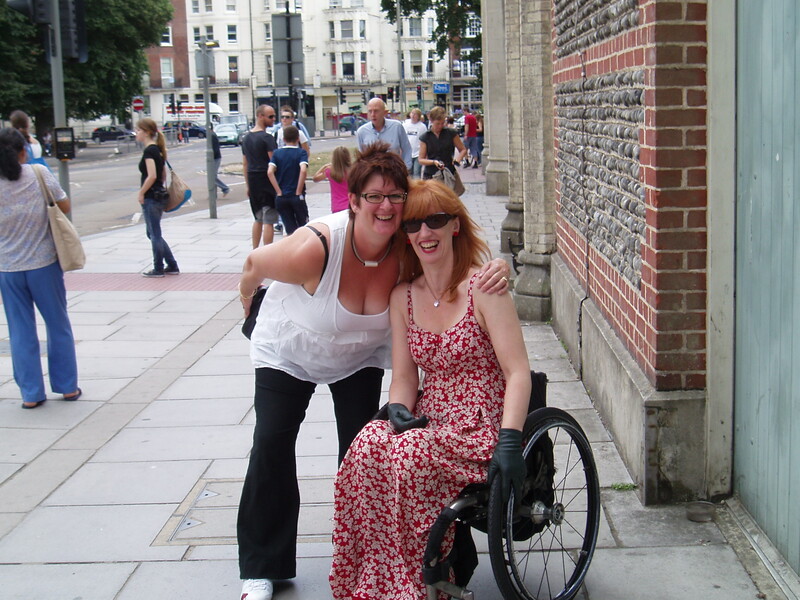 Not much to say other than these photos………… Oh well, yes, we did tramp up 30 minutes of steep hill to a memorial site in the heat of the day…….. Phew!! the four wee cable catr bubbles......... yikes! 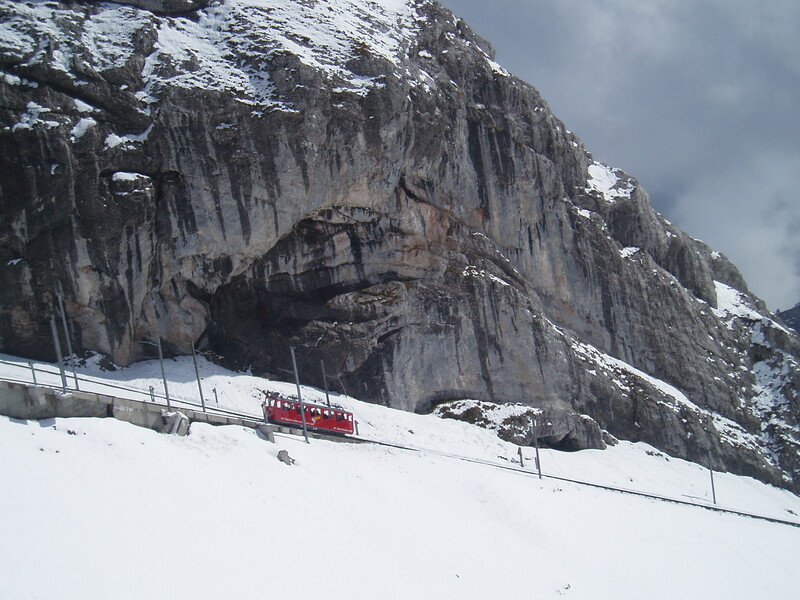 Oh yes – these are the wee cable car bubbles we went in! 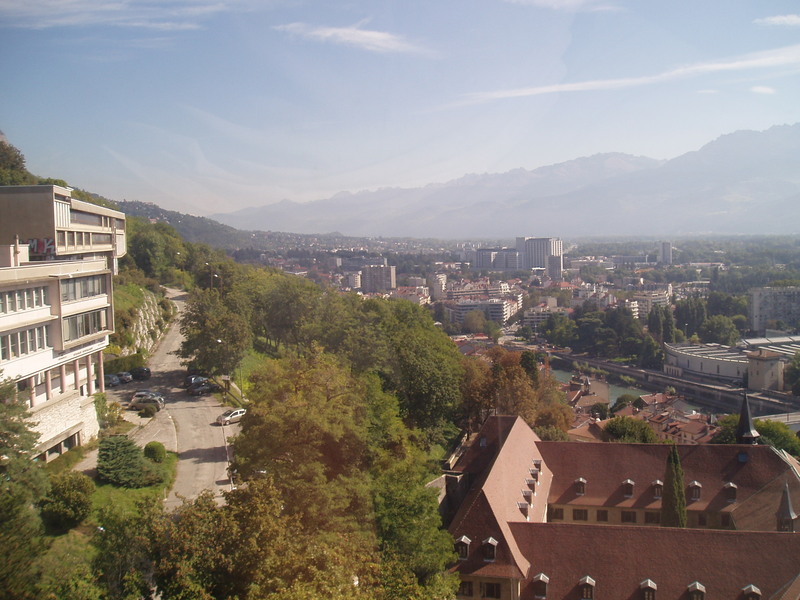 Today we left and went via Chambery town (not much to mention there – we had filled rolls in the park for lunch which were nice) then to Annecy. 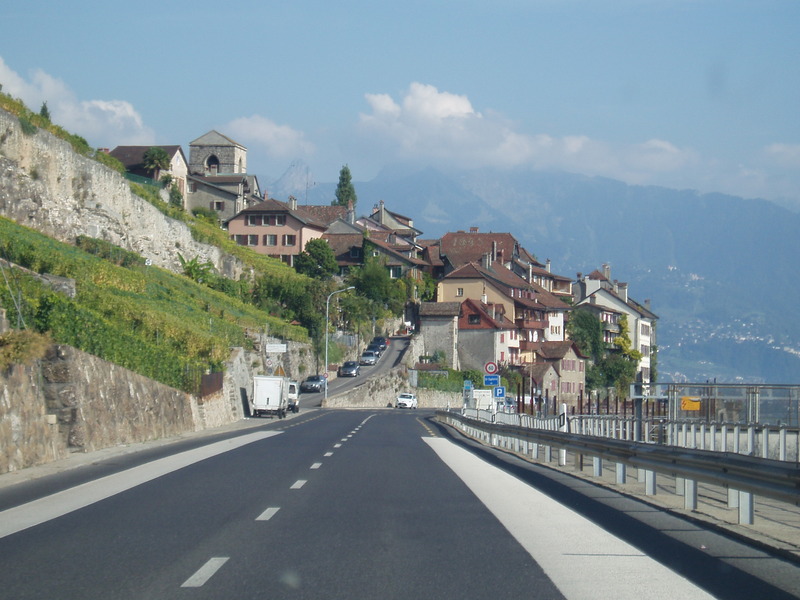 We are now very close to Geneva and Switzerland. 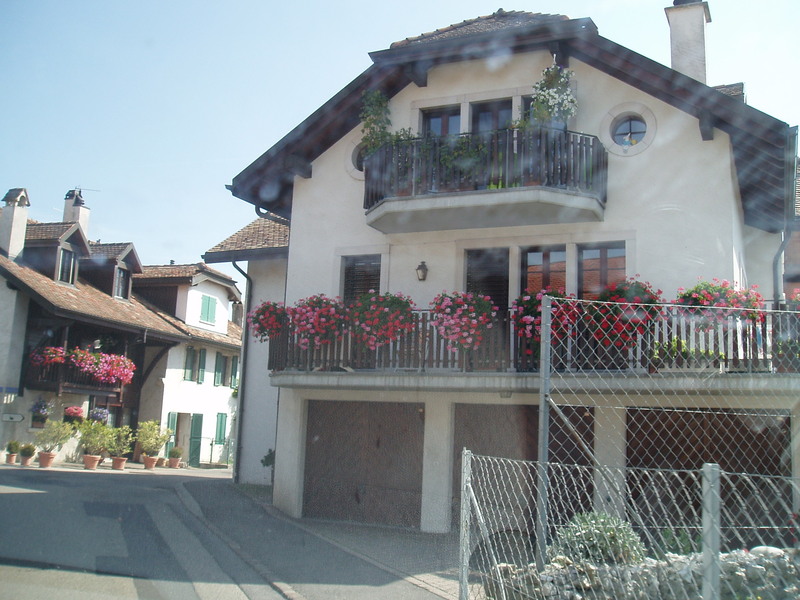 We have noticed the change in housing to have steep roofs to allow the snow to slide and the mountains – which are so beautiful. The place we are staying tonight is more like a B&B than a hotel and is a wee bit out of town. But look at this view!!!!!!!!!!! It is a lot like Queenstown we think. 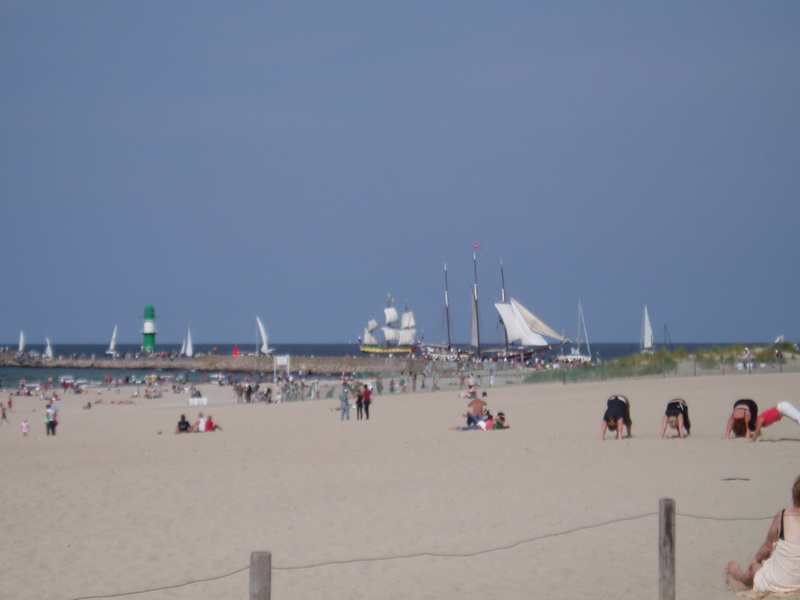 Good for the soul and very relaxing watching the boats come and go and all the sailing yachts. 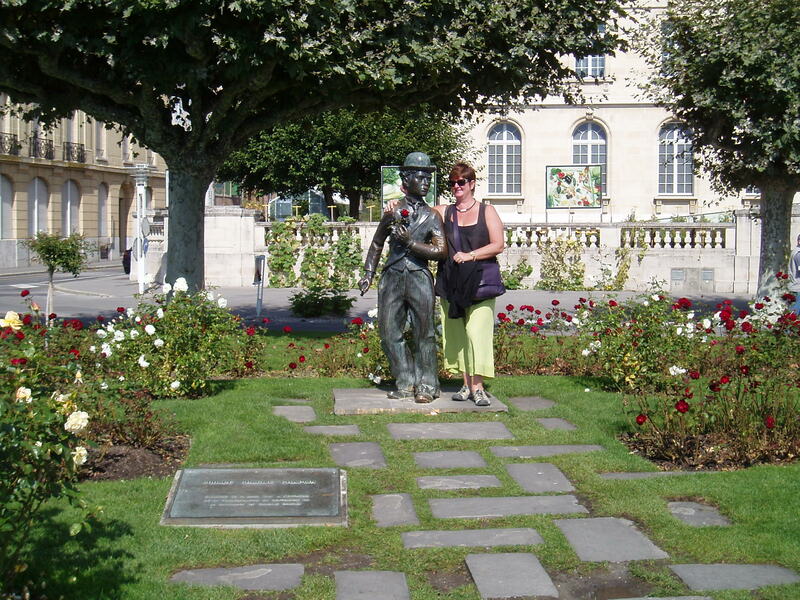 And the Last of France……….. 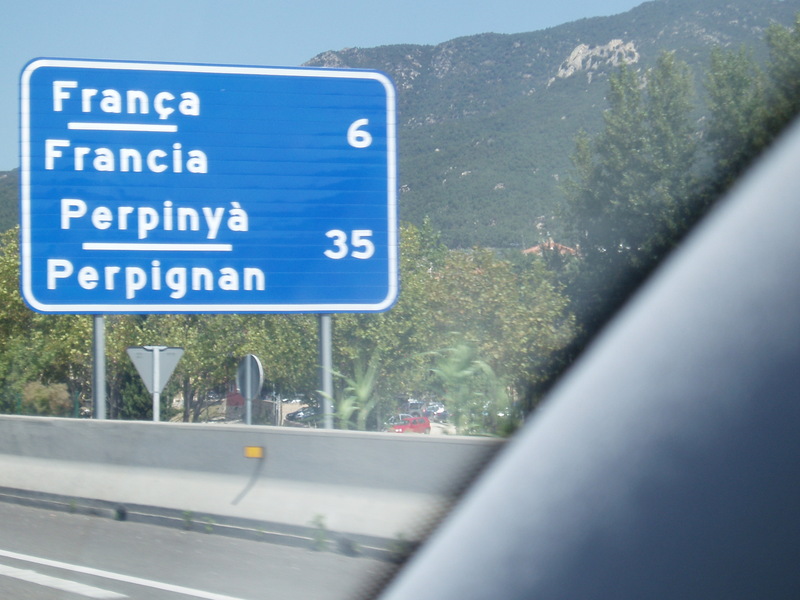 So we returned from Barcelona to our wee village of Saissac. 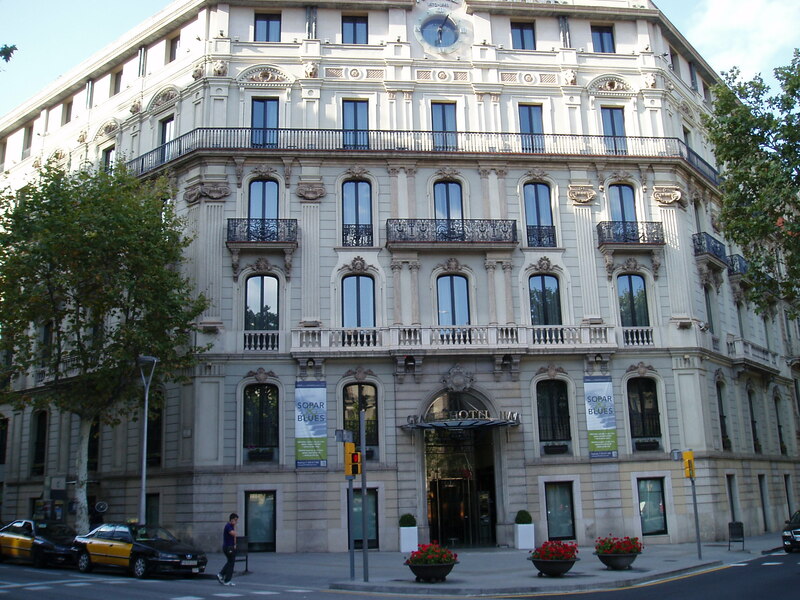 Unfortunately the power cuts in the hotel in Barcelona had caused our computer to crash. Oh dear, what to do in a foreign country! Luckily there is a woman in the village (Catherine) who is Irish, been here 20 years and so speaks both English (or should I say Irish…….) and French. We called her and she told us where to take the computer to be fixed. We felt very confident when the sign said “PC Clinique”. 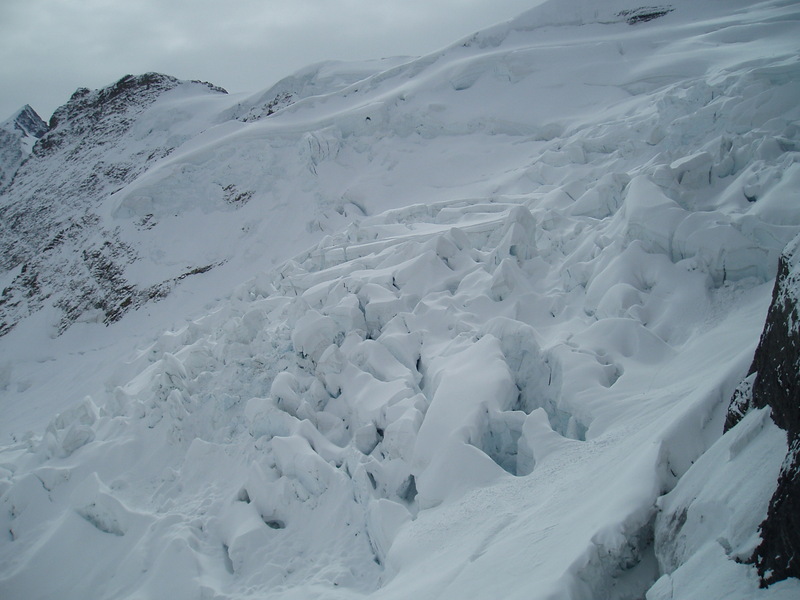 But we had to leave it there for a week……….. we felt like we had our hand cut off, not being able to communicate. Anyway we invited Catherine for lunch. Well…………. She brought a jar of wild boar pate her husband had made (from killing the boar to making the far of pate) and some amazing tomatoes from her garden. We talked, drank wine and had much frivolarity and she went home at 5.30pm! What an afternoon. Hic! We walked Catherine home and I enjoyed patting those cute little pig dogs at her house. On the way back (oh, yes, all of a 4 minute walk) we called in to the local pub. Marie is the owner with her husband and she was on the bar. We were the only customers and of course after all that “lunch” Peter especially was having a long and meaningful chat with Marie. Now let’s be clear- She speaks no English and Peter speaks no French………. 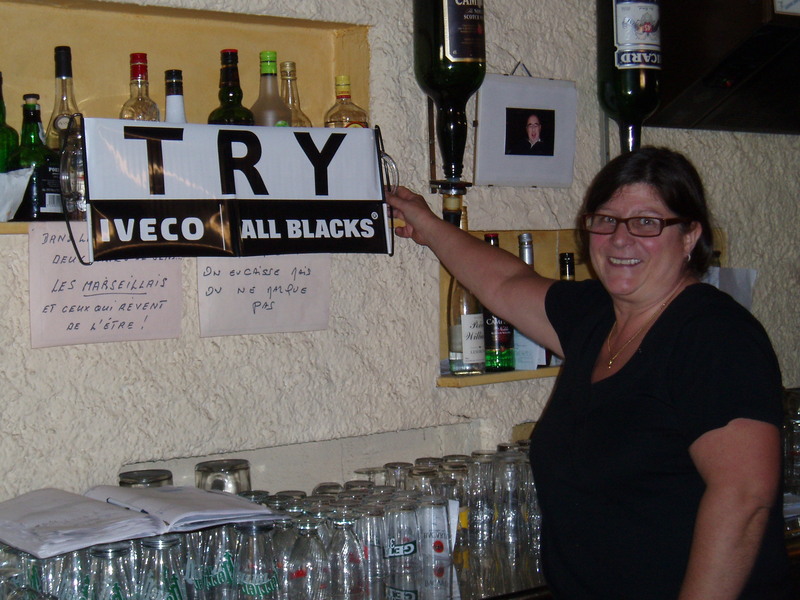 But somehow the All Blacks came up so he raced home to get an all black TRY sign he had and she hung it up on the bar! What a lot of laughs across languages we had. 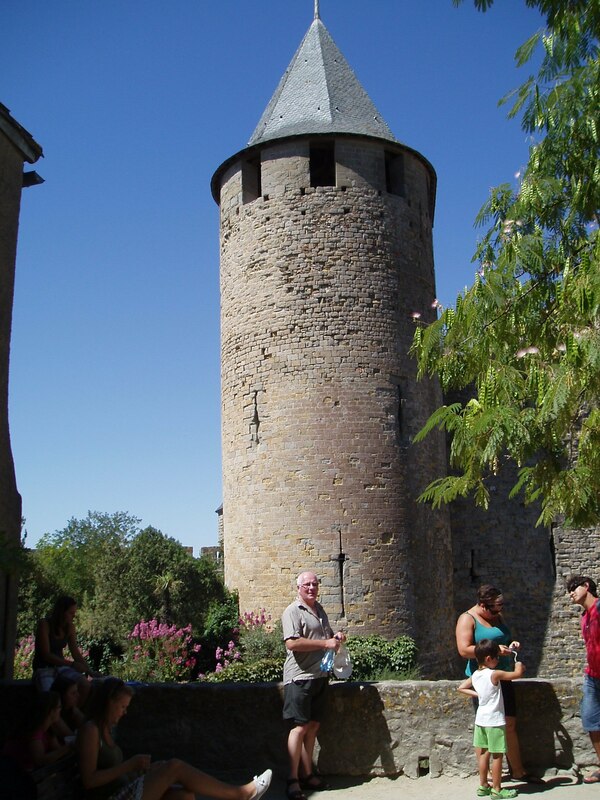 While we were in Carcassonne, the closest big town / city to take our computer in, Peter sourced getting a blood test. What a fantastic system. We walked into a laboratory (spied it from our car park) within 5 minutes the blood was taken and in two hours we had the result. All for a mere 12.50 euros. So efficient. That day we also sourced a bar for Peter and Cherie, (friend from NZ who lives in Istanbul who was coming to visit for a long weekend in Saissac) to watch the NZ All Blacks play Australia the next weekend. We found the Celt – IRISH bar – which screens all the games. Oh yes – were Peter and Cherie happy! And by coincidence we also found this public toilet (see how public it is!!!!!!!!!!) and the Otago Rugby clothing shop. OF COURSE – an Otago and Maori rugby clothing shop here in South of France. Crazy! I am not telling you what Peter said about the relative size of the rugby player and my thighs! Then it was my birthday. 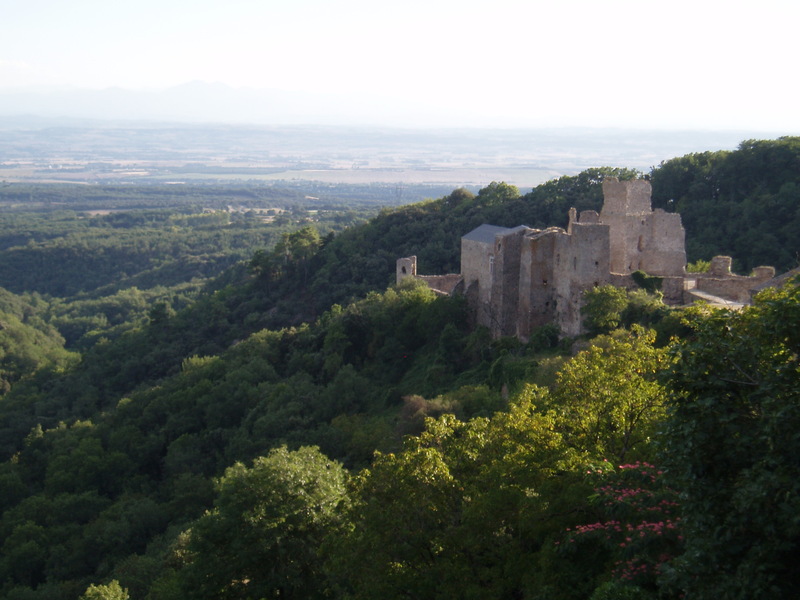 Here in the South of France – very special. And I received some mail in our tiny little letterbox here……. What a surprise. It was very nice. We walked to the local baker for pain au chocolate for our breakfast, fresh peaches, coffee and champagne. All on the terrace overlooking the Pyrenees. Oh, so how hard is that! Alison, Peter’s sister, had sent the latest NZ Cuisine magazine so I spent most of the day reading that on the terrace. 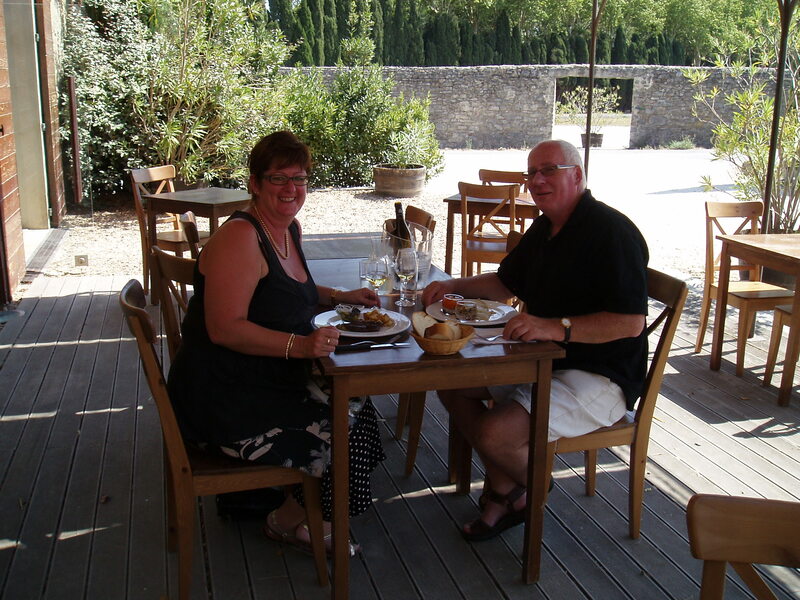 Peter took me to lunch at a local vin yard – it was lovely but not the views and ambiance of NZ vin yards. 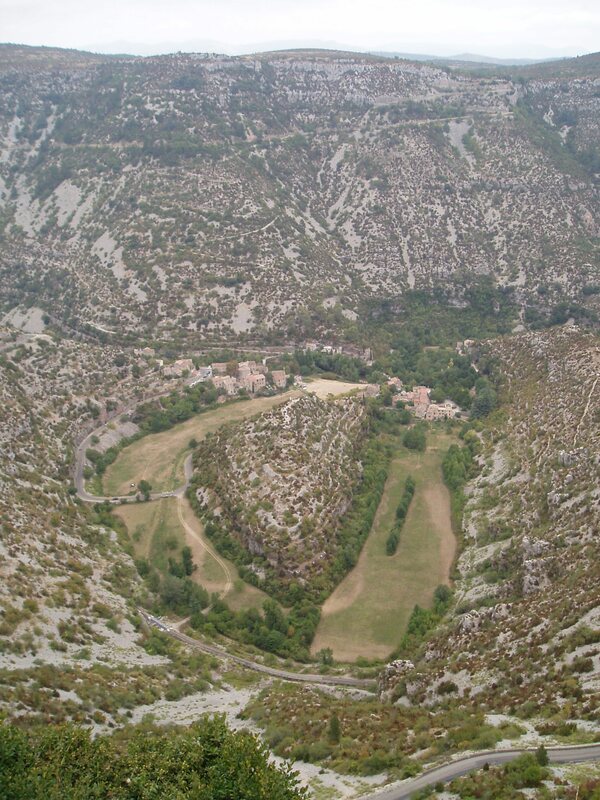 The next day we got up early to do a day trip to Cirque de Narvacelles. 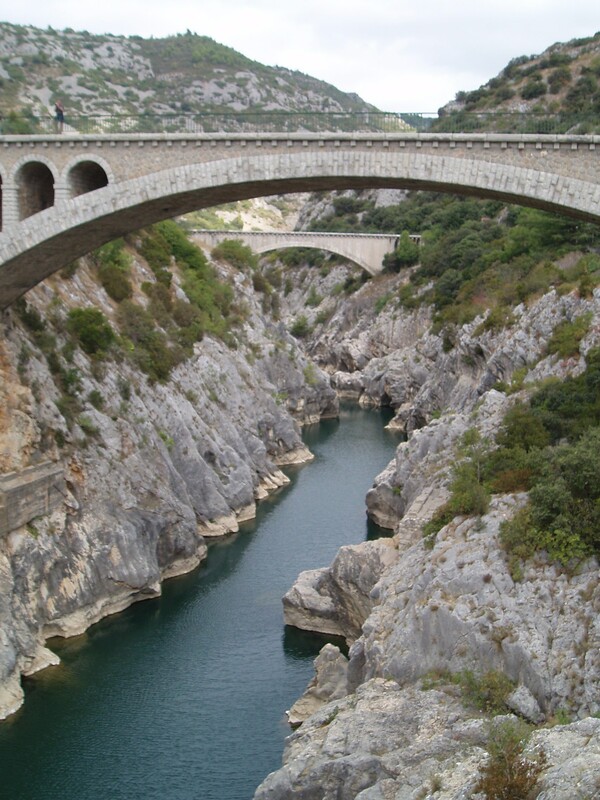 To get there we went through the gorge Herault. 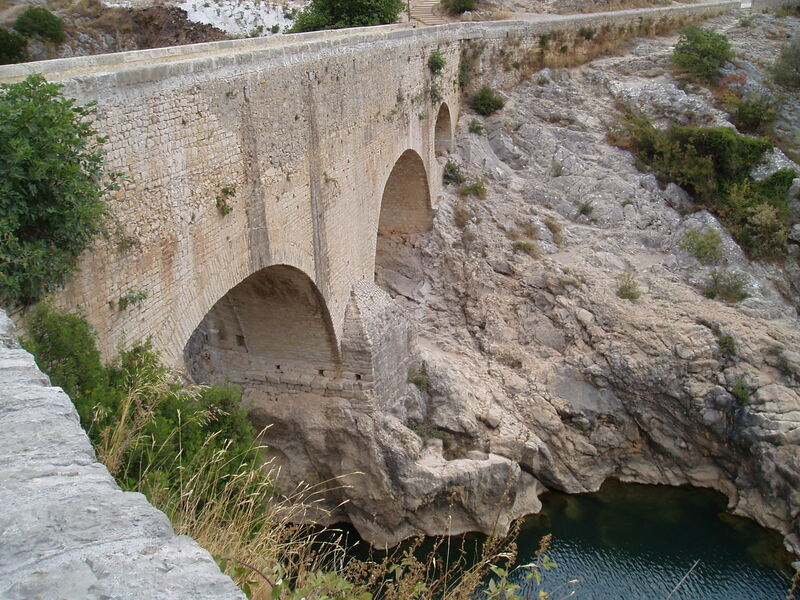 Stunning views and lovely ancient bridges, …………. 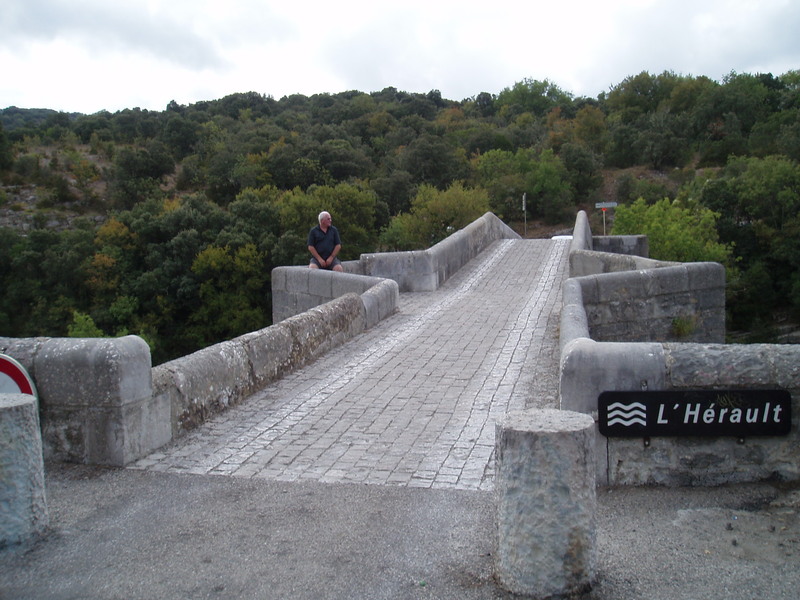 It was a windy road to get there………. 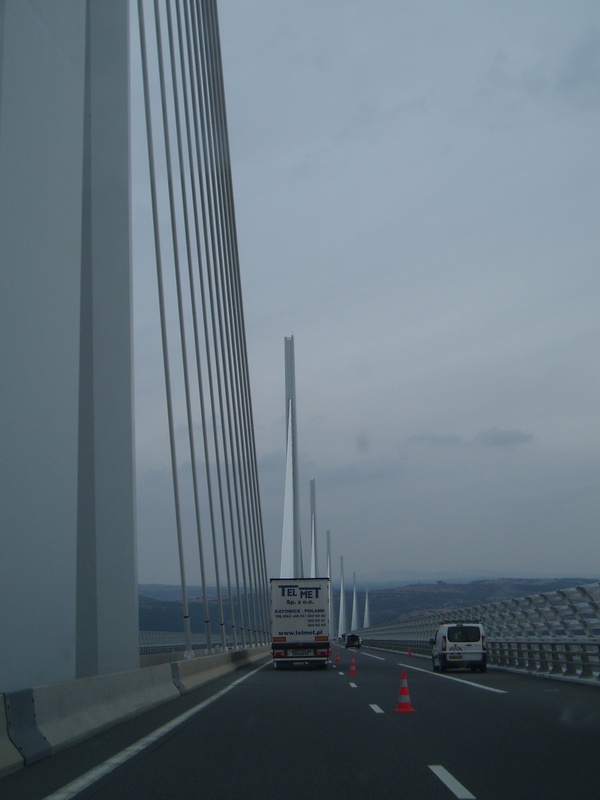 After that we went to see and drive over the Millau Viaduct. An amazing piece of engineering!! 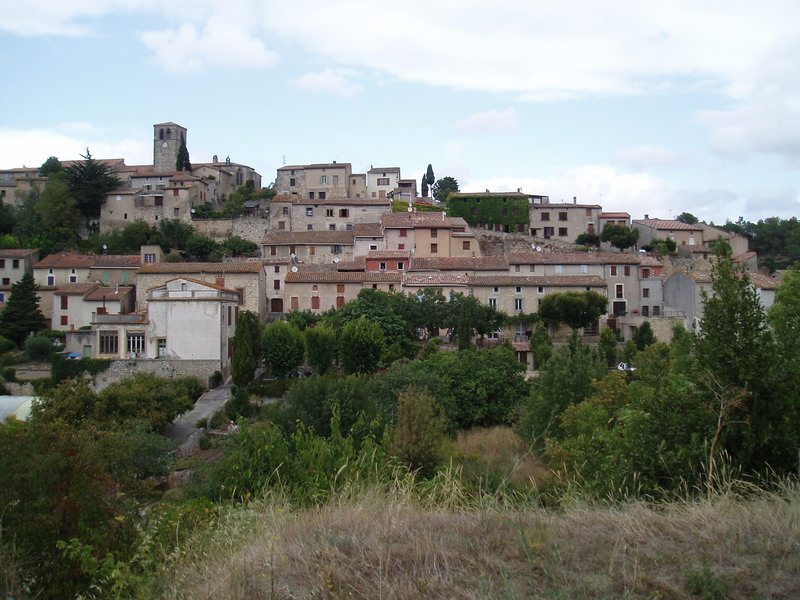 Of course cute French villages on the way (it always looks like no one is home though, as they are so quiet). The viaduct is amazing! I had seen on a documentary in NZ this viaduct but never thought I’d get to see it. A real treat. Now here is something interesting. We arrived here the last two weeks of summer and on the 1st Sept – suddenly it is autumn. From 30 degrees at 9pm to 20 or so at 9pm. Oh wonderful for sleeping! And suddenly the sunflowers are being harvested, the trees are starting to turn golden and we have had a couple of foggy cool days. We don’t see that dramatic change at home – even in Central Otago. Every day (except Wednesdays when he is closed) we walk to the local bakery to buy our pastries and bread. One day Peter wanted the spiral pastry with raisins and custard in it. We asked in our pigeon French what it was called. He said “escargot” – which is snail in French. So that made sense………. Only next time we went a lady was serving and when I asked for “un pain au escargot” she burst out laughing. Ah ha, the locals having a joke with the tourists! It is called “pain au raisin”. It was very funny. 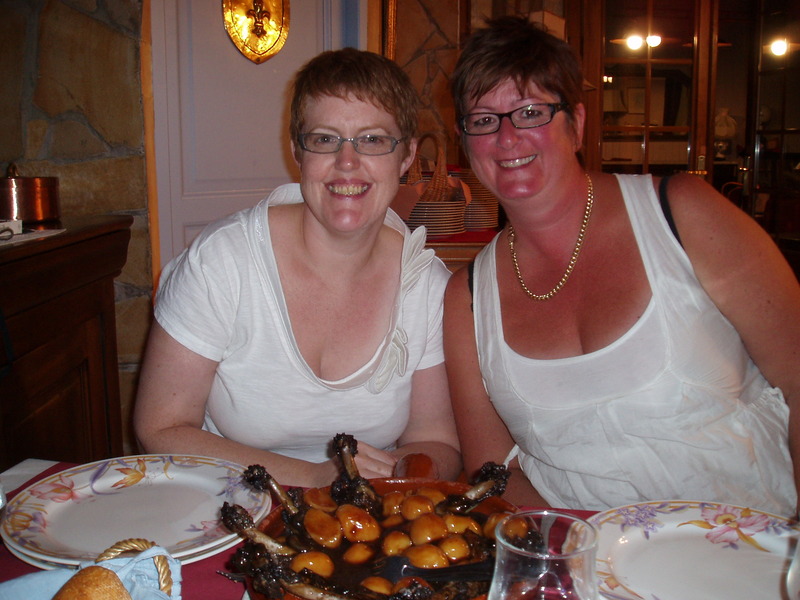 On Thursday Cherie from Istanbul was arriving at Toulouse airport to stay with us for a long weekend. 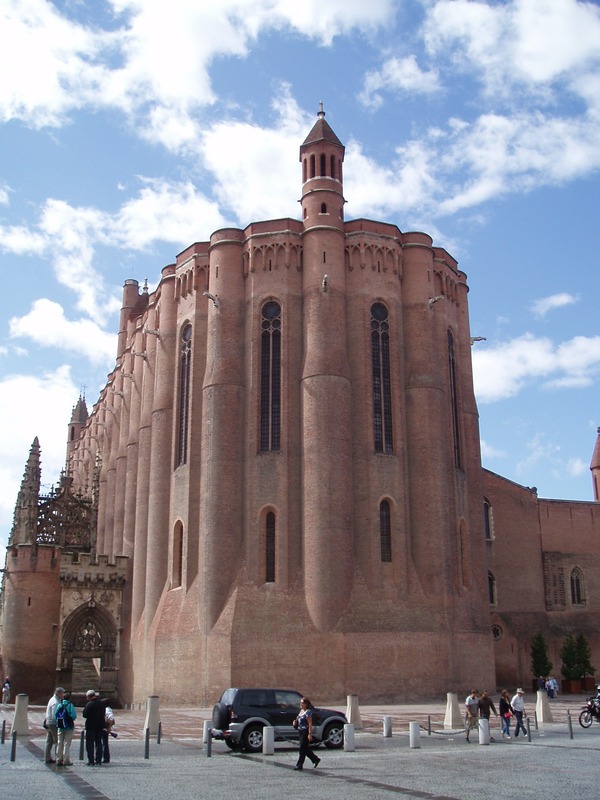 So on the way to pick her up we went to Albi – a beautiful town on the river. 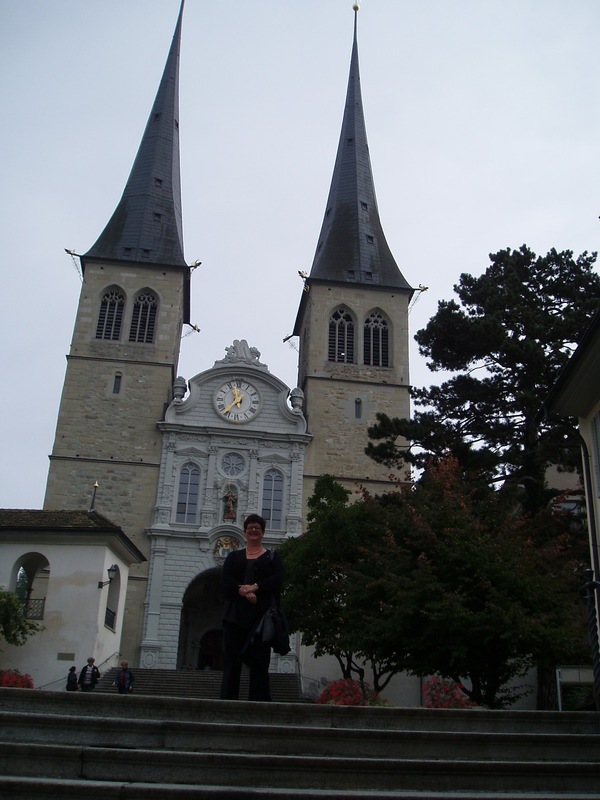 The cathedral dominates the town and we loved to look through it. 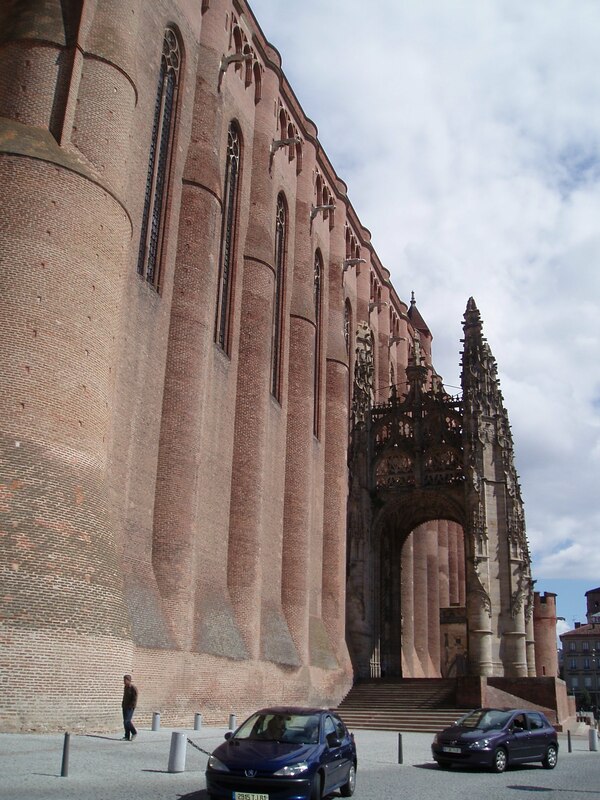 Albi Cathedrial from end-look at all those bricks!! 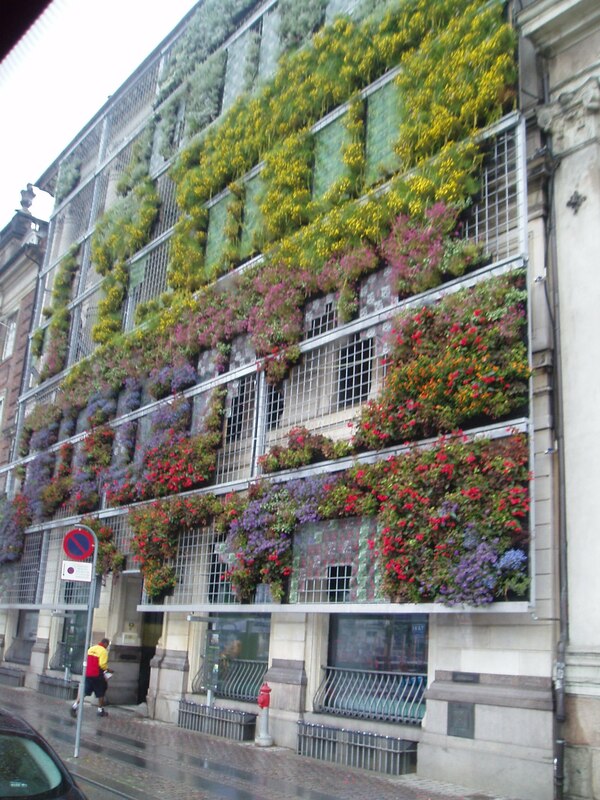 Side of building to give dimension!! Cherie’s plane was on time and it was so good to see her. 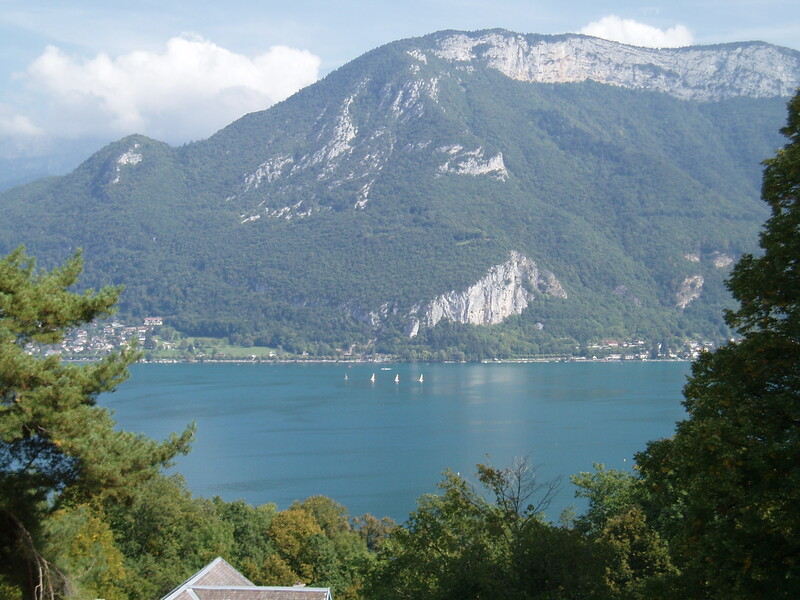 So off we go to Saissac…… and cooked up a local NZ dish – lamb chops. Everyone was in heaven! 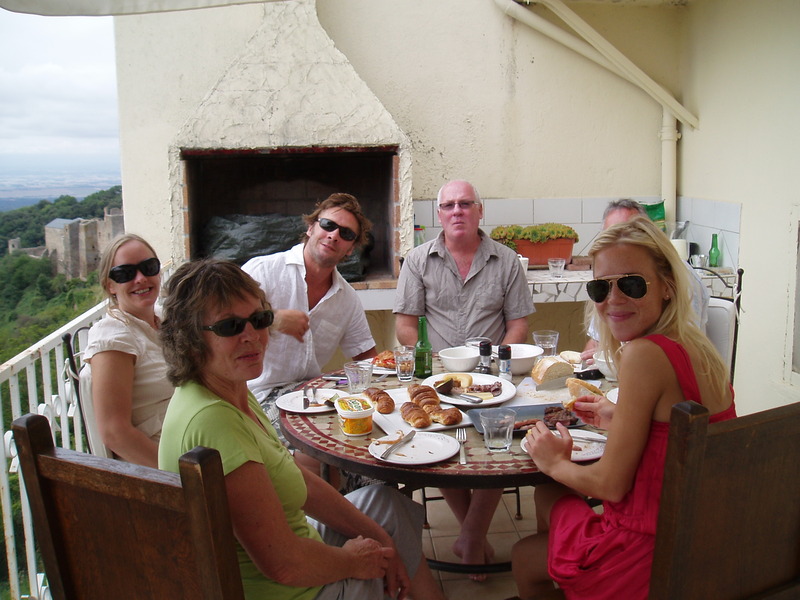 The next day we drank champagne on the terrace, ate good food, local bakery goods and had a good old catch up. 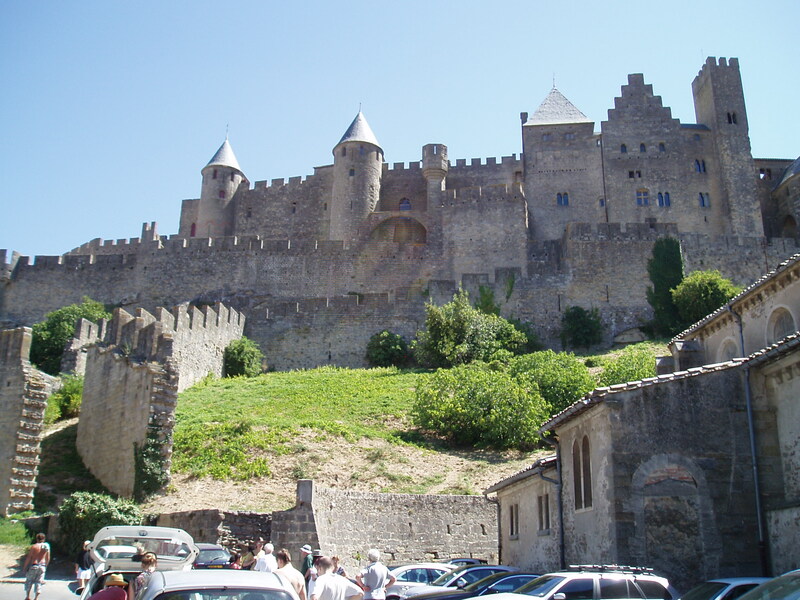 The next day was Saturday – the day of the All Black test – so we went into Carcassonne. Oh yes, we’d checked on the web and the bar that plays rugby was to be open at 8am……. 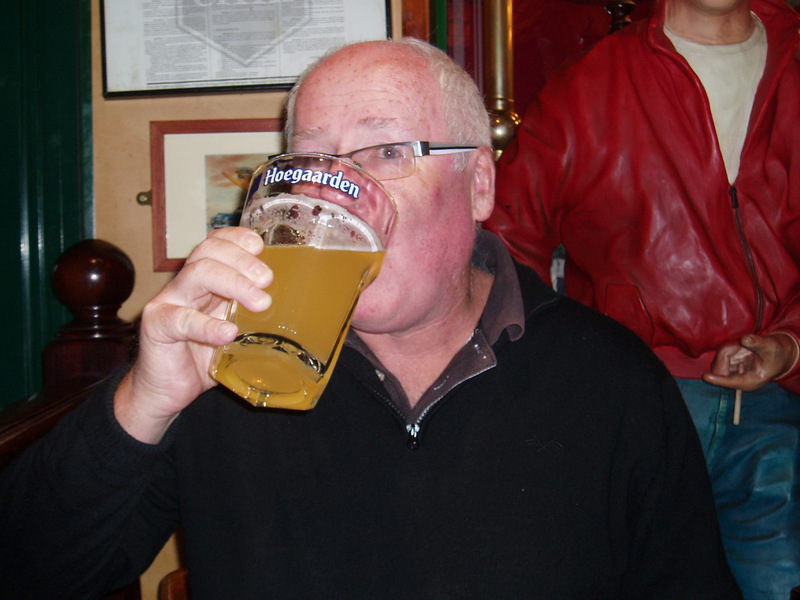 The game was to be 12 noon local time here……….. we got there and the bar was not opening till 2pm! As the game ended! I had two very sad / annoyed people on my hands J But to make the best of it we went for a lovely lunch, watching the local people, the fountain etc. Sigh! That night we went to the restaurant next door here in the village – what a night – food enough for 10 people……… lots of laughs. We could not eat it all! 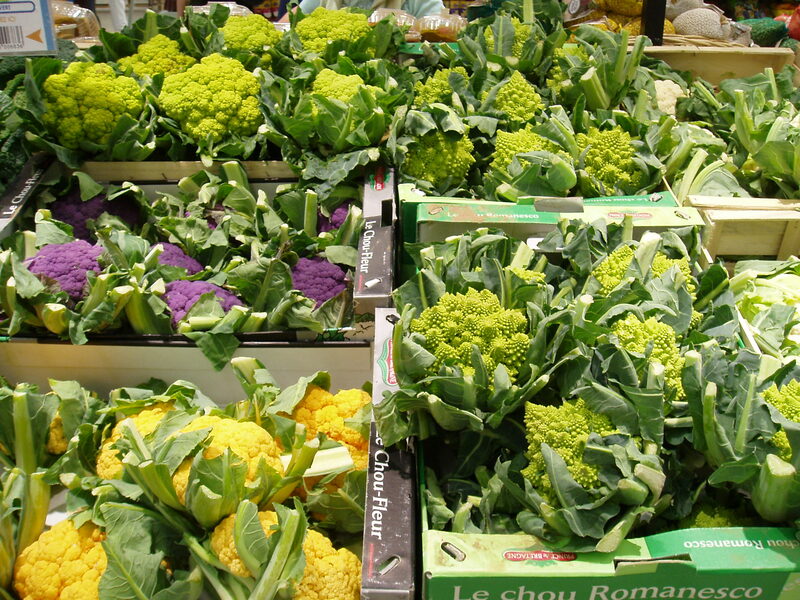 actually not related to the restaurant - but get these caulis in the supermarket!! Monday we got organized and then took Cherie in to town for the plane. 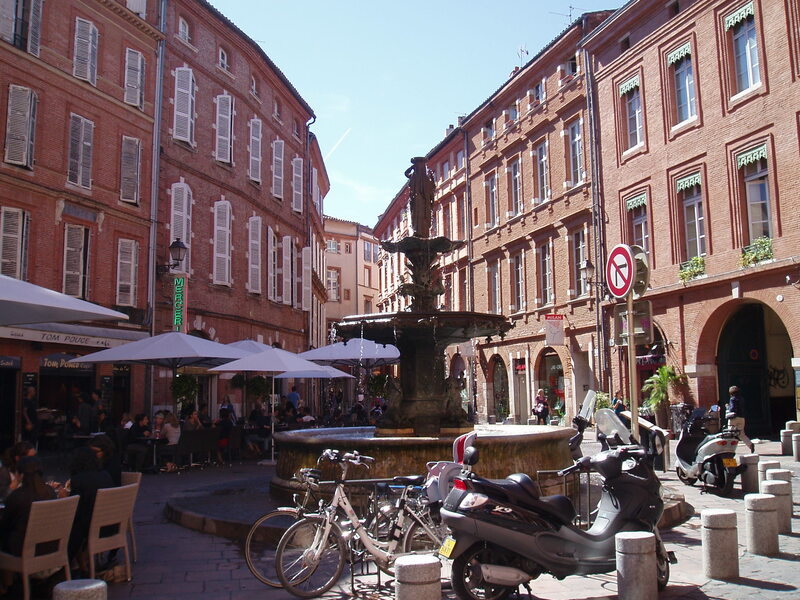 We all had a lovely lunch in Toulouse in the main square and then out to the supermarket to buy food for Cherie to take home. 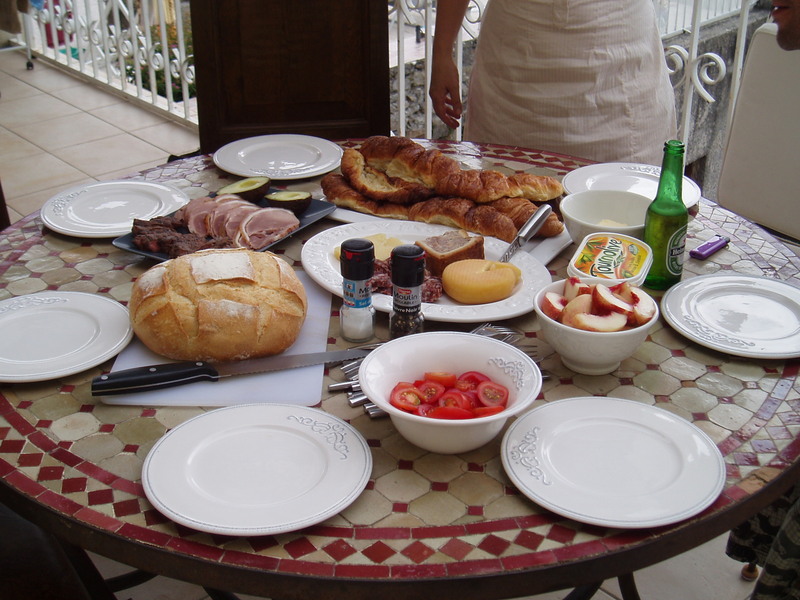 Not like NZ – where you cant bring in any food – but in to Turkey Cherie took raw Toulouse sausage, cheese etc. Quite different for us. So our last days here now – sad in a way and also time to move on. We could live here though! 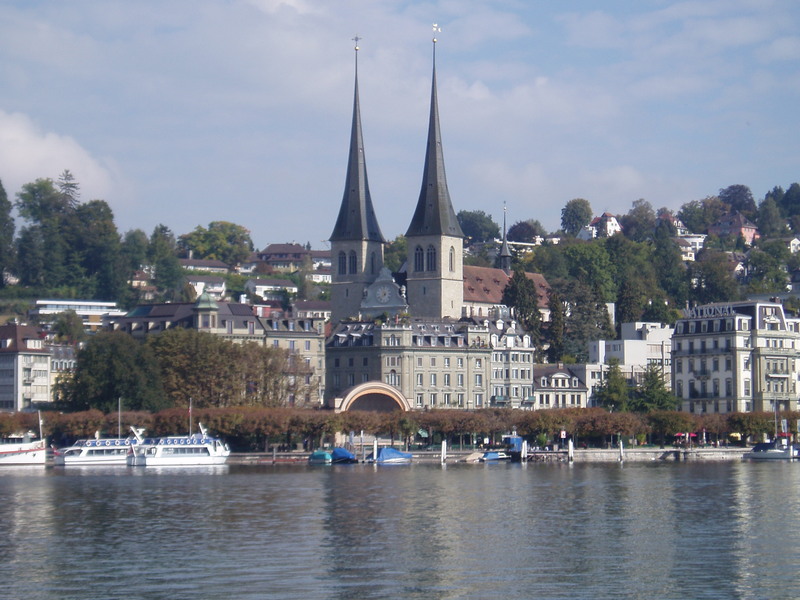 The people great, the views, ……… Our next move is 7 days travelling up to Zurich. It is not 7 days driving but tiki touring, stopping off to see etc. Hope all is well and love to those of you who are in Canterbury with the earthquake. Oh ……. My …….. Goodness! 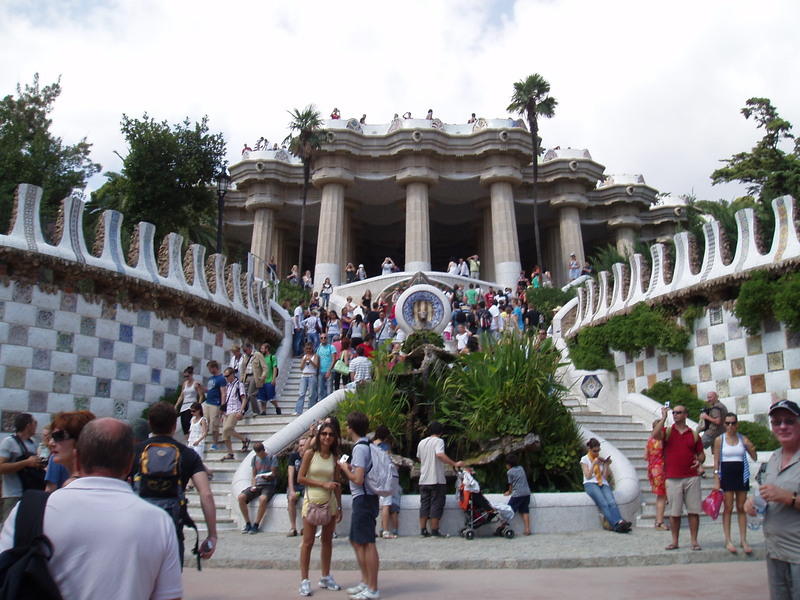 Did we LOVE Barcelona!!!!!!! 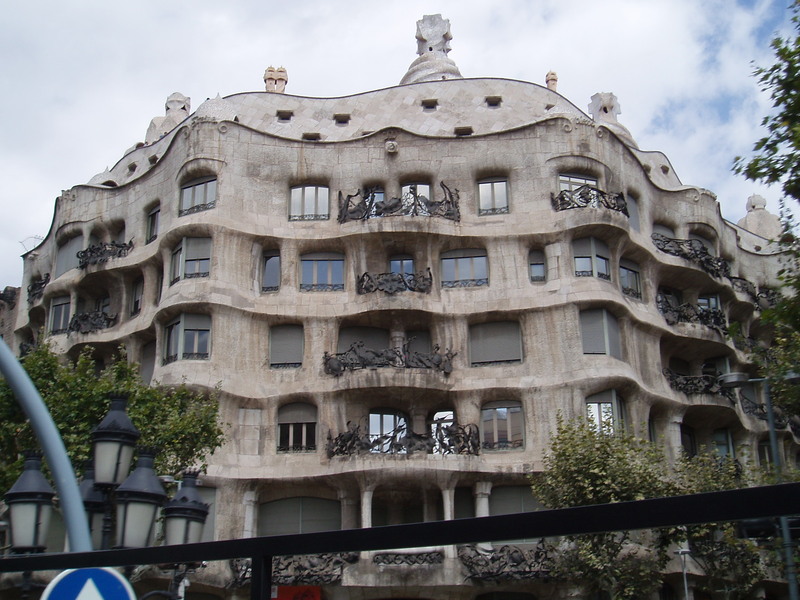 It is hard to put your finger on the “X” factor but take fantastic weather, food, people, architecture, culture, and arts plus trees, views, mosaics, ……….. and maybe there’s a start. Also it was so easy to get around. 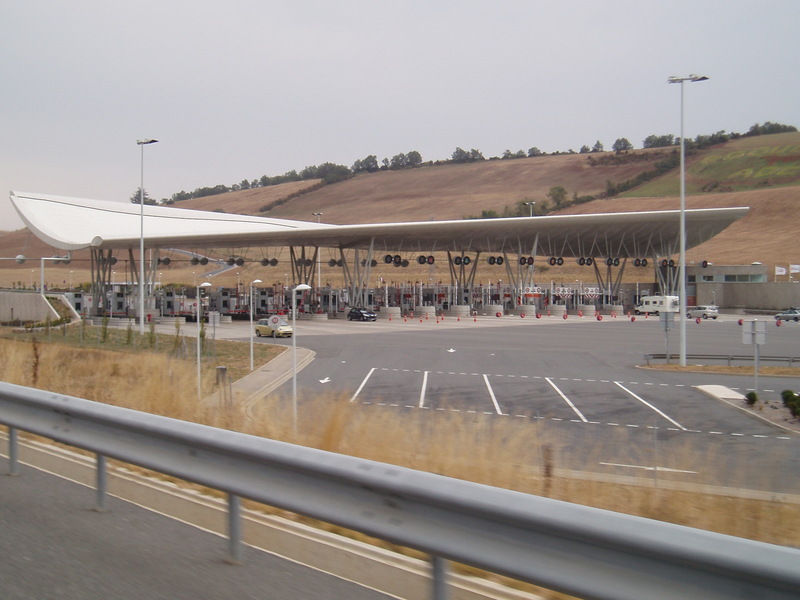 We were to meet Cameron and Anna in Barcelona, but they were coming from Saissac, not Toulouse. We hadn’t made a meeting time just booked in to the same hotel and had text numbers to keep in touch. Imagine both our surprise and amusement to find when we got there and had driven round the block a couple of times looking for the car park, to pull up behind Cameron and Anna at the red lights! Kiwis, eh! 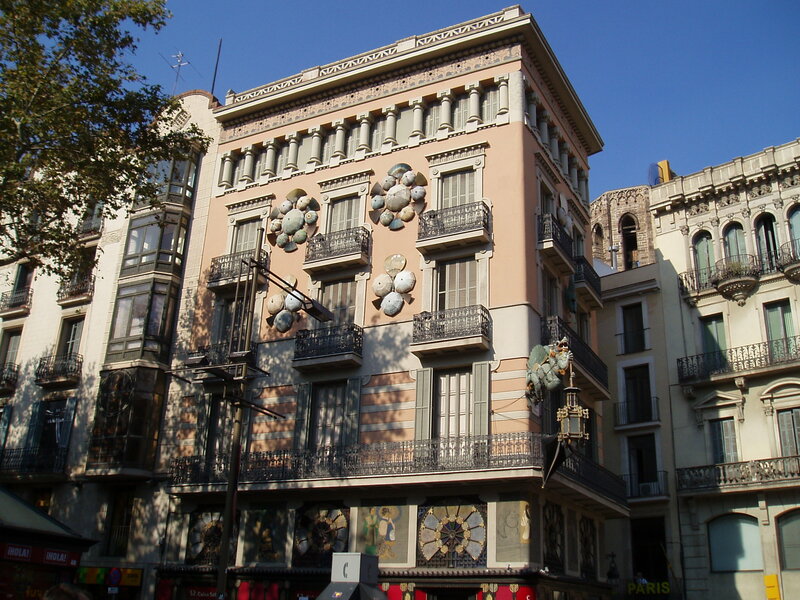 The hotel was very nice and very close to old Barcelona and La Rambles – the street with all the ,markets, stalls, performers etc. 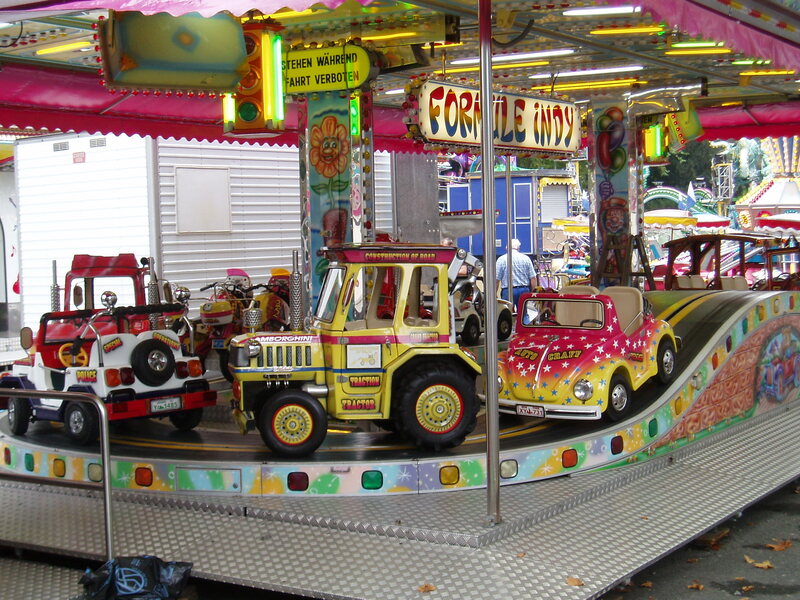 Stalls also include animal stalls of birds and turtles, flower stalls etc. It is so BUSY with people but a lot of fun to see also. Held on to my handbag very tightly! 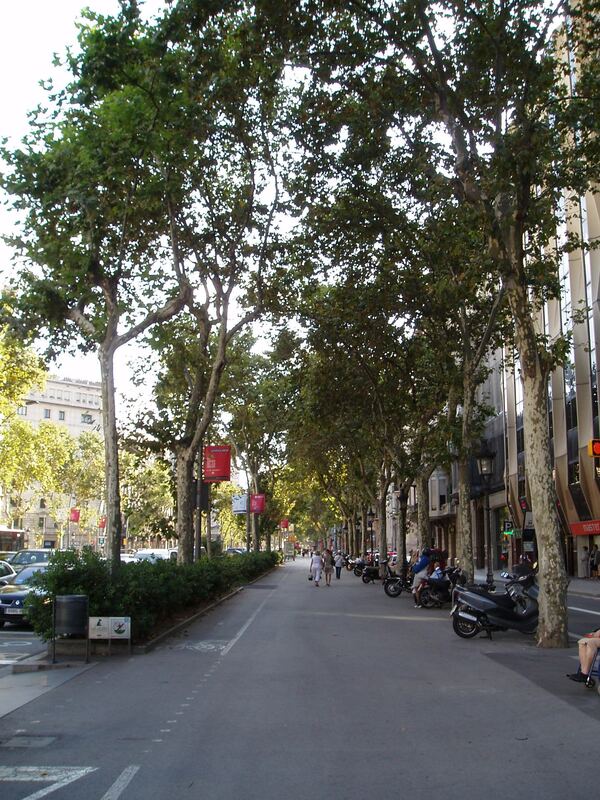 The street out hotel was on - such beautiful trees! 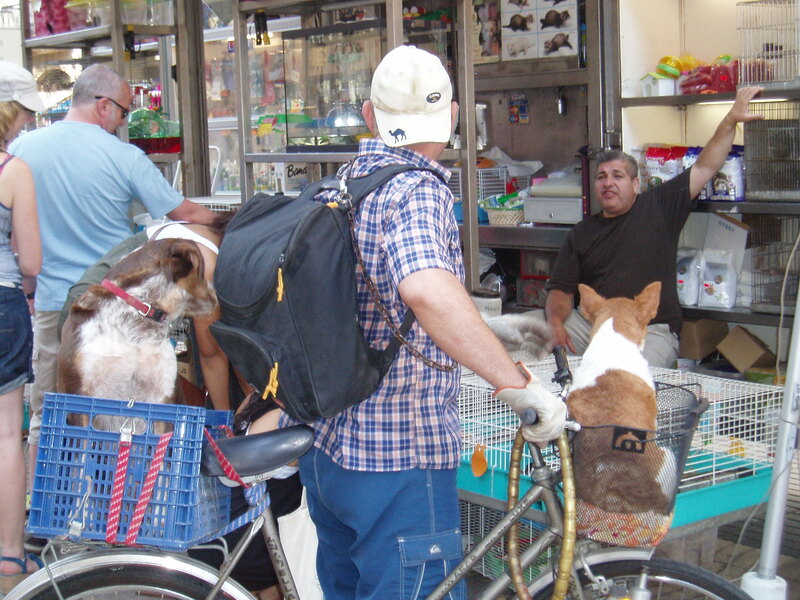 Dogs looking at Pet Market at La Rambles - transport arranged! So during the days each couple did our own things then at night we got together for dinner. With Cameron being a chef it was so amazing – for both of us to share the love of food and for me to share the enjoyment of food so much and to also learn from him. When we arrived Peter and I hadn’t eaten so we went to the pool bar on top of the hotel and had a sandwich. A lovely view but oh so hot! 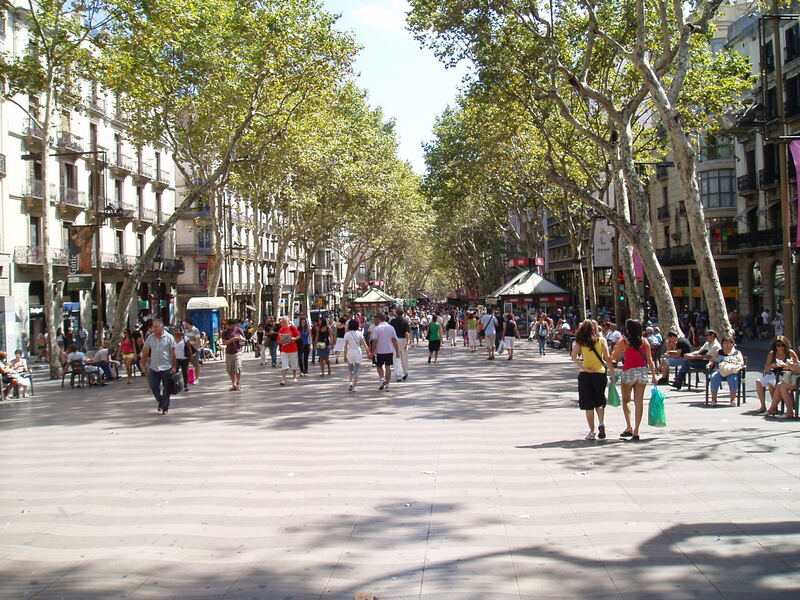 After that we meandered down the La Ramblas and across the La Ramblas le Mer bridge to the new part. There we saw so many people (it was a Sunday) and sat watching them in a cool breeze but still in the sun. Ahhhhhhhhhh. In front of la Ramblas le Mer Bridge - phew it is HOT! The first night the hotel gave us a recommendation for tapas dinner – and it was on the same street as our hotel. 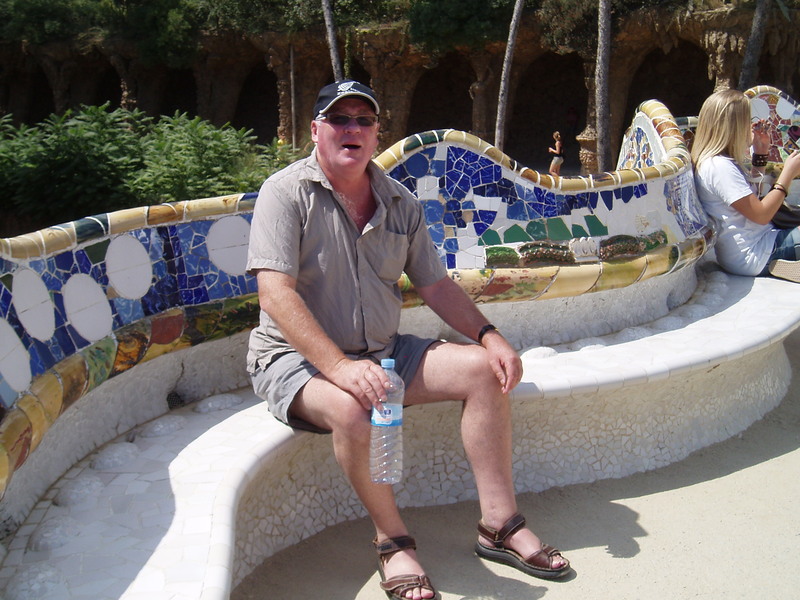 Just had to walk past some amazing buildings, fountains, etc……… such hard work – not! The restaurant was buzzing and packed so we had two seats at the bar and two standing. The waiter was from the Philippines so spoke good English (and Spanish) and so we could order well and we ate very well. The jamon (cured ham) was the best and so different than any I have tasted before and then the “surprise” chilies. There was a plate of fried medium sized chilies, so called surprise as some are very mild but have that wonderful chili taste, and a few are so hot……. “Surprise”. I loved them. We had some great local red wine to go with the meal. 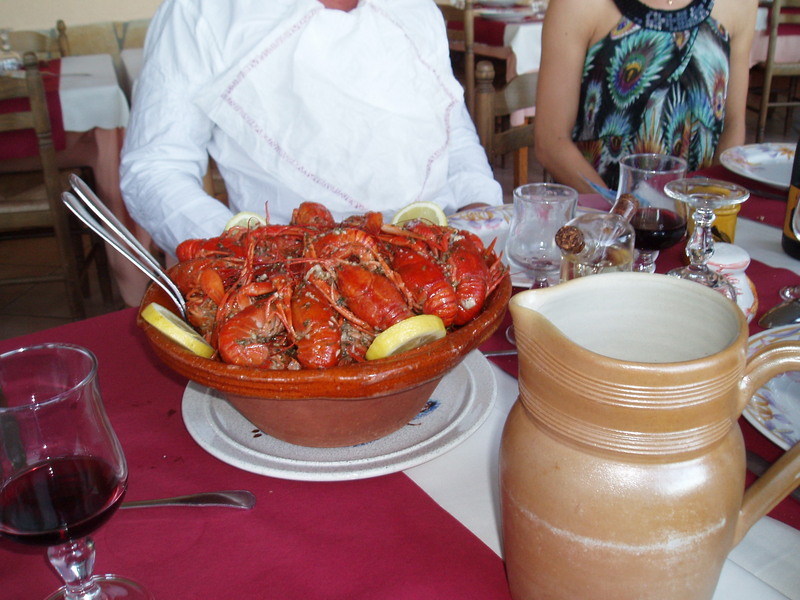 Those that ate fish enjoyed a variety of shellfish……. The next day Peter and I did the “hop on hop off” bus. We love those as you see so much and then can decide where to go back to when you have more time. The architecture and the beauty were incredible. There were two, two hour trips to do but after the first one we were so hot we decided we needed a drink in the shade. As most places over here close between 1 and 3pm we had a little trouble finding something that was not touristy – but eventually we did. A tiny “garden” bar in the back of a shop in a courtyard of apartments………. Not flash, but cool and full of trees. 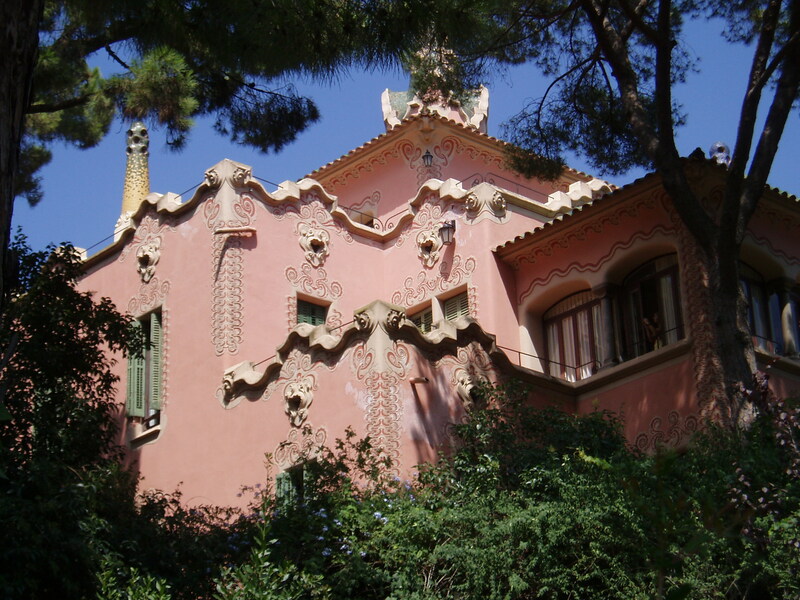 Over a drink we met the owner – a man in his 60’s who has been very involved in the film industry in Spain. He was so interesting we decided to wait till tomorrow to do the next 2 hour hop on hop off. We then went back to the hotel to freshen up and met Cameron and Anna. Cameron had sorted where to go for dinner but first we went to an amazing market / restaurant / bar for a drink. 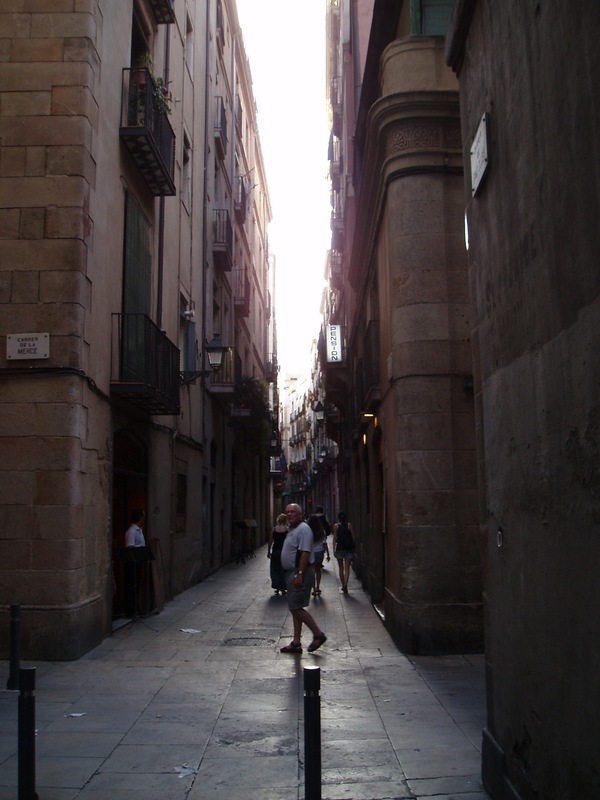 Then walked through the old back streets of Barcelona to the first tapas place. Oh my – we all loved it. They charge you by the number of tooth picks you have at the end – each tapas is on a tooth pick and you can go to the bar / counter to pick some up and / or they bring hot and new ones to your table. Then we went to another one we had heard of – it was certainly a local experience being in a suburb compared to centre of town but not quite as exciting in the food department as the first one. Even so we were pleased to be there. A walk home, a digestive in the bar, and an agreement to explore the local food market in the morning. The food market – what an experience!!!!!!!!!!!! The freshness, the variety, the stalls selling breakfast, juices freshly squeezed……….. after looking around for awhile and learning about some of the foods we had not seen we ate at a tiny stall in the market. The boys had a beer each (me a glass of cava and an espresso) and fried eggs with baby squid on top, we all shared a plate of the most amazing variety of mushrooms sautéed in brandy with fresh bread, and then a shared plate of an array of frittata. MMMMMMMMMMMMMM…….. We then said goodbye to Cameron and Anna who had to go back to work in Antibes, and we went off for another explore of this beautiful city. 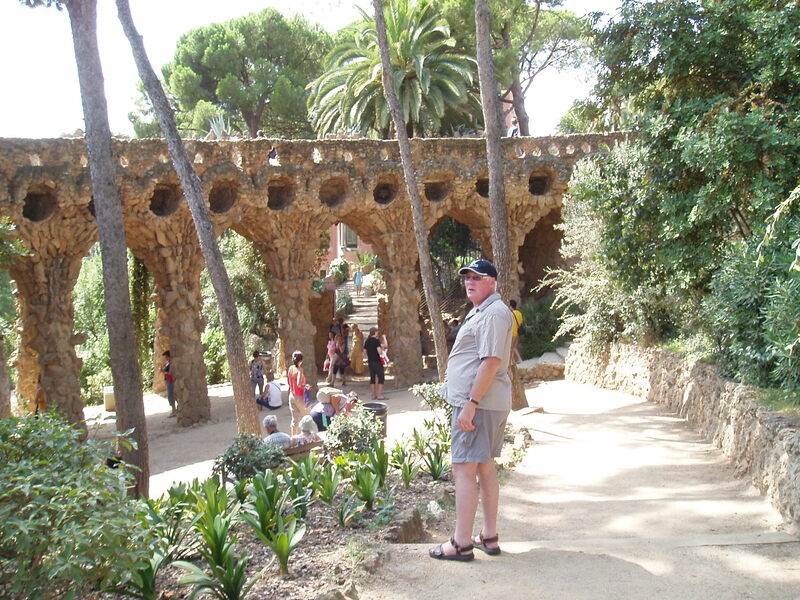 We so enjoyed the sights and loved the Guell Gardens “the Gaudi Gardens”………. what’s tp say but the photos! 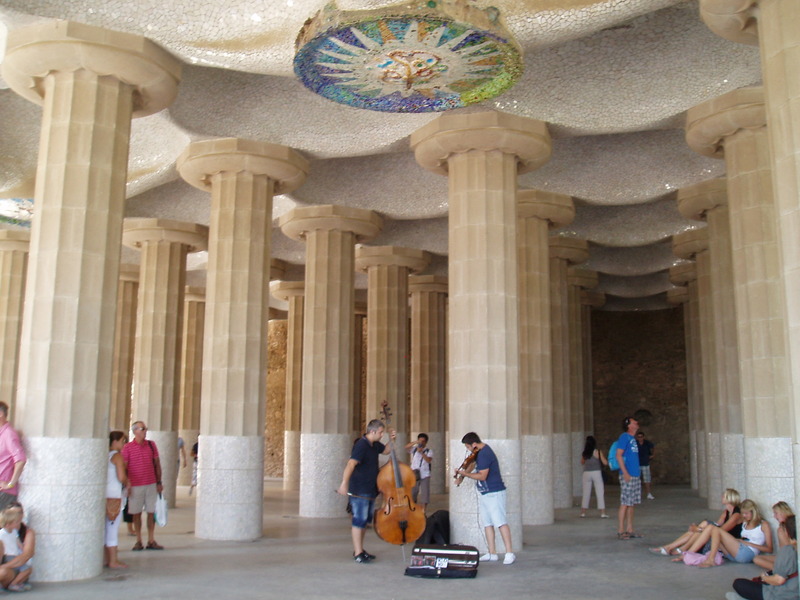 Amazing Column Building with three piece playing - very beautiful! It is hard to explain the city and as I said why it is so amazing. We hope the pictures help. 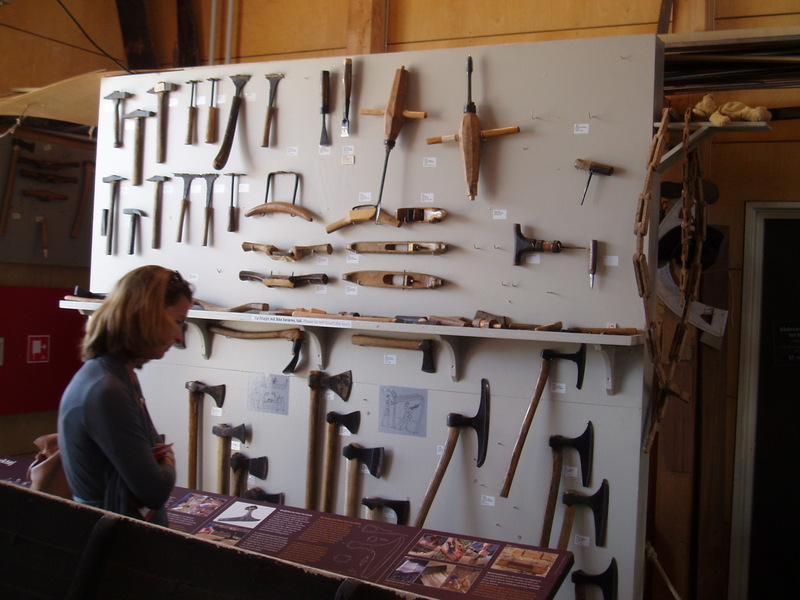 This is one blog where I think words should be less and pictures more. The Border Itself.............. Yup this is it! We both hope all of you are well and have survived well the earthquakes and long winter NZ has been experiencing. Wow! 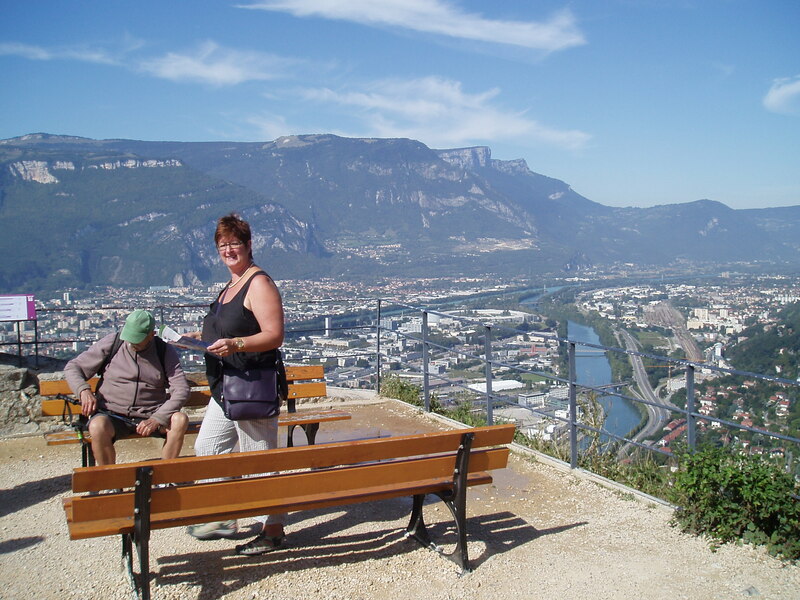 We can’t believe it is September already and our trip itinerary is up to the South of France. Maybe time on this side of the world goes double pace……. Here is where we are staying www.saissac.com in the little house which is hundreds of years old. 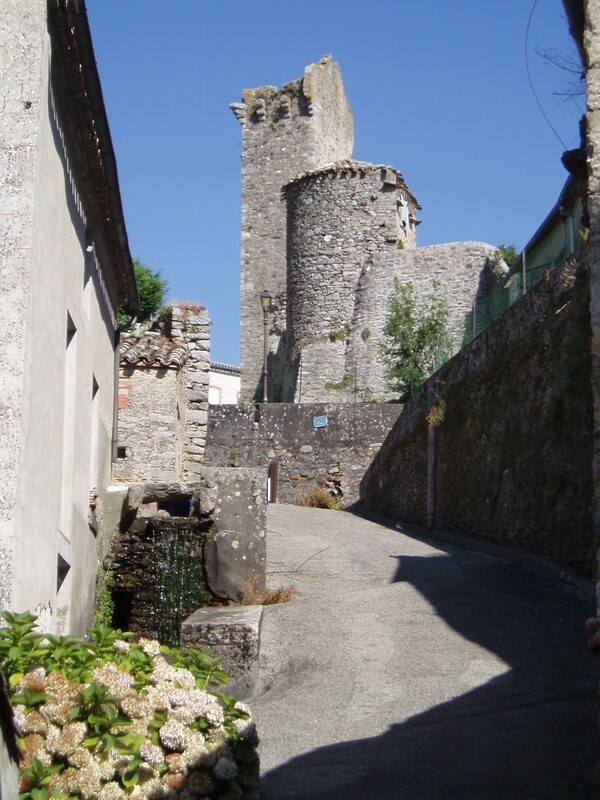 The village is so quaint and it has its own castle which we can see from our terrace. We arrived at Toulouse airport at 5.30pm and it was still 40 degrees! Hmmmmm – a spot of hot coming our way. 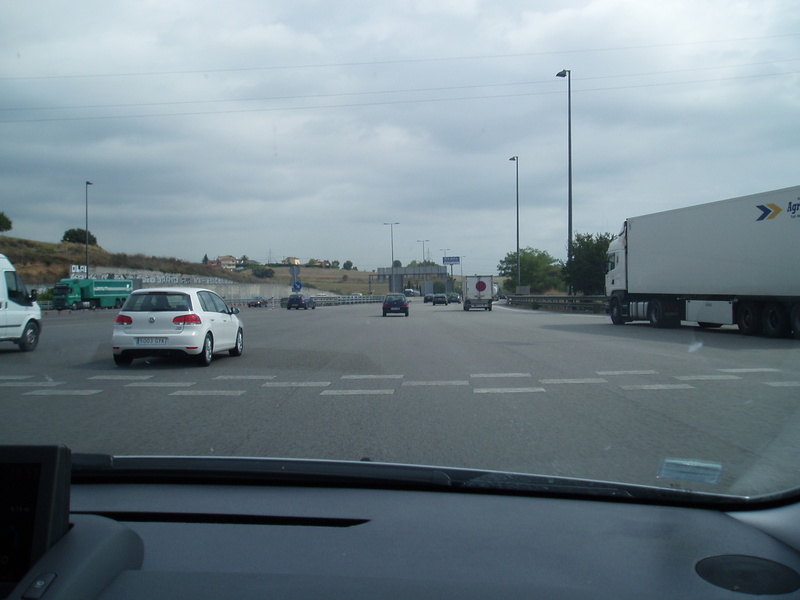 We picked up our lease car – a brand new Peugeot – and went off to get groceries and diesel. Yeah – the HUGE grocery store was air conditioned! 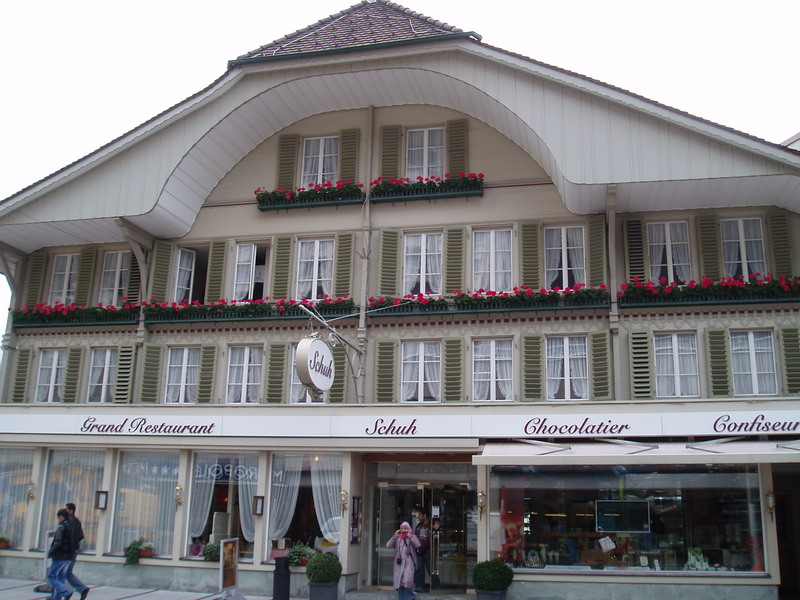 Had a lot of fun shopping here, and not knowing what was already at the house we are to rent………. 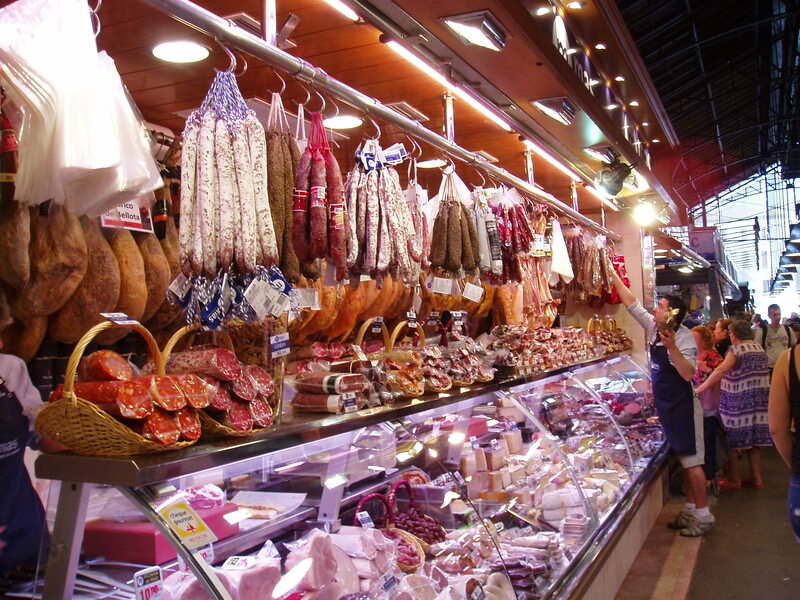 The sausage and dried sausage, the cheeses………… oh la la! 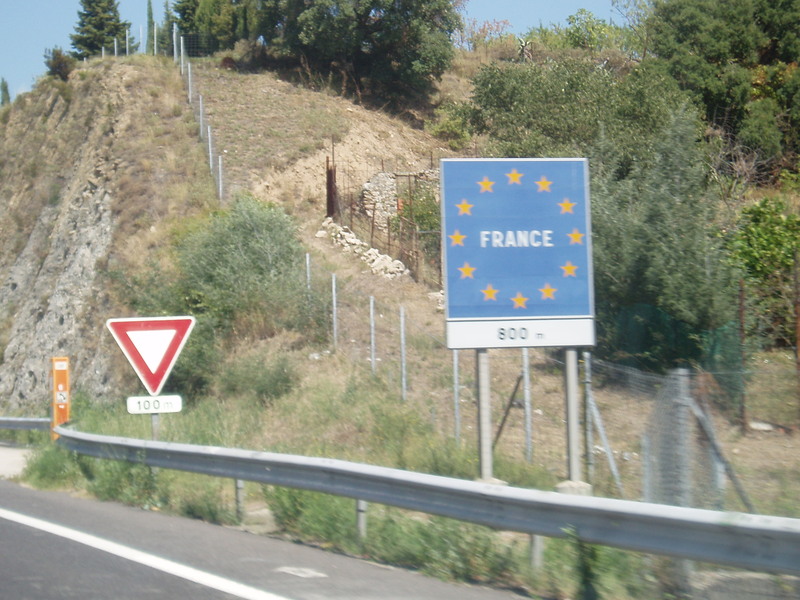 Then to drive to Saissac – a tiny village in the South of France. 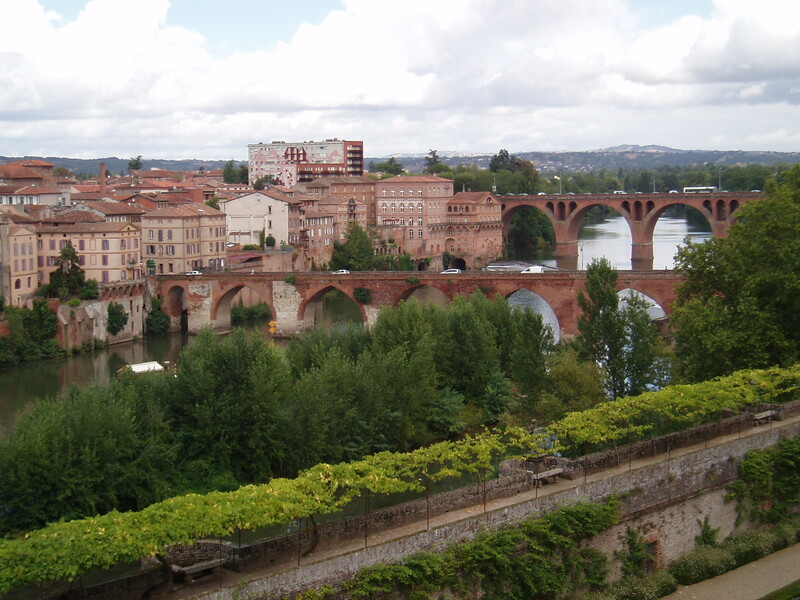 It is about 90 minutes from Toulouse and it was getting dark. 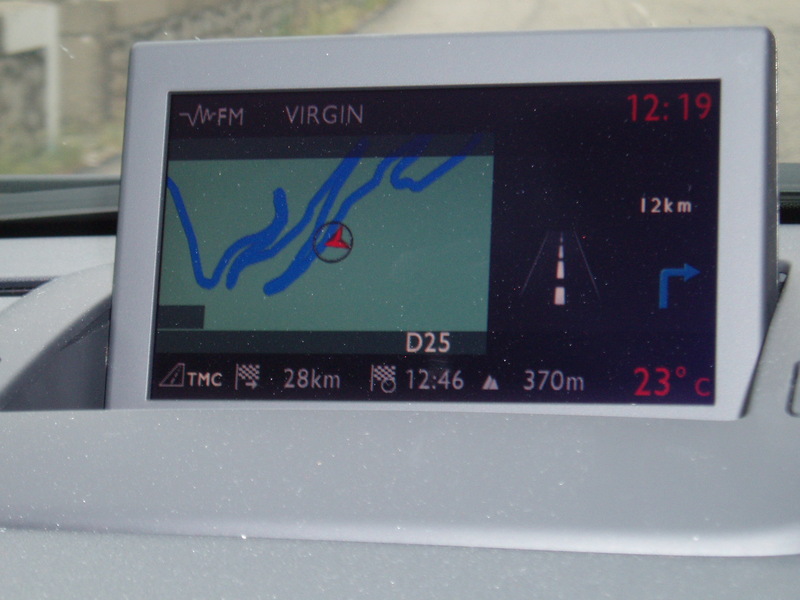 Once again thank heavens for the GPS – but poor Susie, she has been left to sleep, as the car has its own built GPS. And after all that loyal work Susie has done for us too……… So we came straight to the house, even though the streets are very narrow and windy. We arrived about 10pm and unpacked. 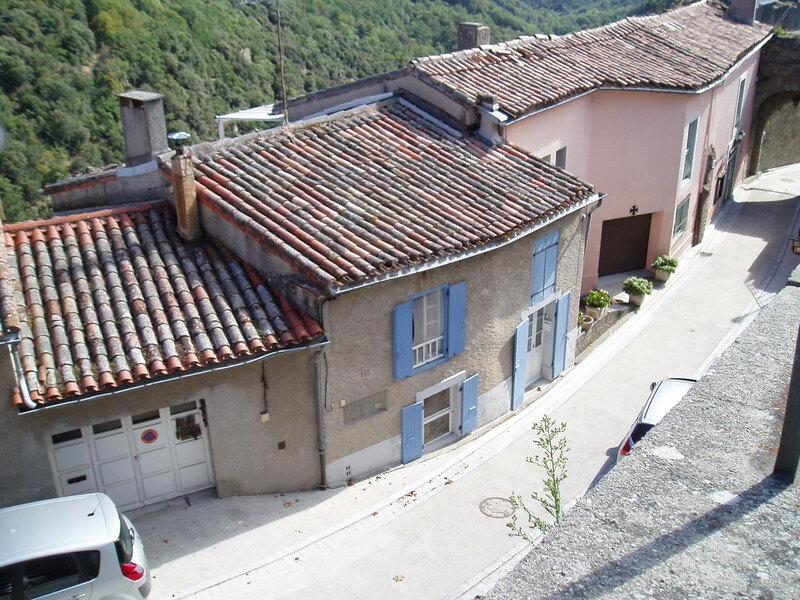 The house has two bedrooms two lounges and a grand terrace – looking out over the valley and up to the Pyrenees. The next morning John, Peter’s friend from NZ who is over here on holiday, rang to say him, Carol and his daughter, Robyn, were arriving that night at Toulouse airport, to come stay with us. We thought they had a car but they didn’t so Peter made the trip in to pick them up. Phew – it was HOT again. But before that we went for a stroll in the village to the bakery, where each day, we go to buy our bread and croissants. So the last 5 days have been full of catch ups, getting to know the local village and a bit of touring around. It is wonderful. And the whole village is beautiful. Yesterday we had two adventures. 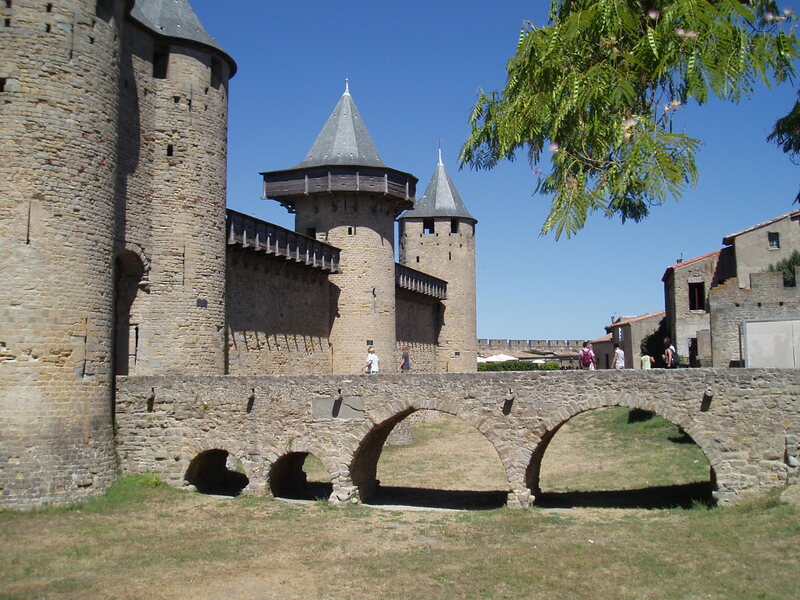 First we went to Carcassonne, the best preserved medieval town in Europe. Wow!! 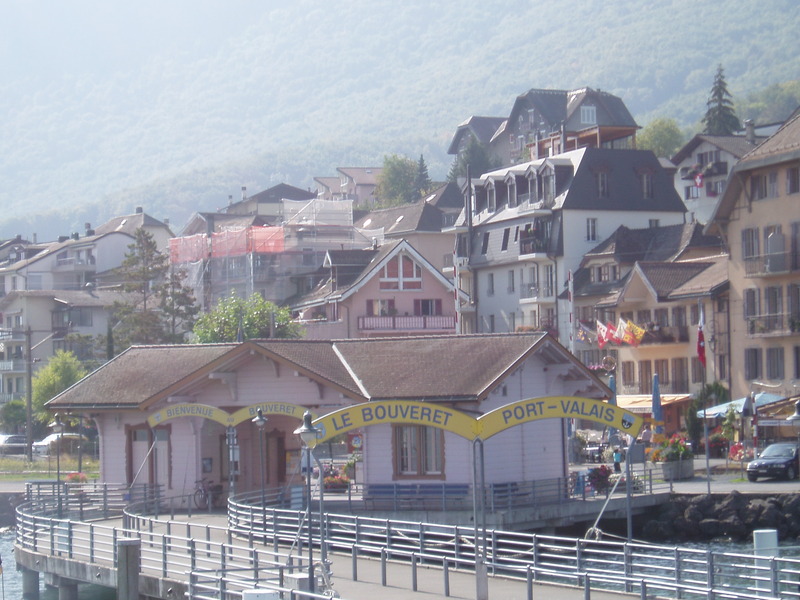 But what shocked us is that inside the village it is full of hotels, bars, accommodation and tourist shops! It looks so old and then this………. At least they are all in the same architecture as the old city. Then last night we all went to the next door restaurant – literally in the same building as our house. It is a 5 course set menu – he speaks no English and us no French. So the food and wine arrives at his choice and pace and we eat! Perfect! First a huge platter of hand made terrines and other meats. Then a huge platter of sliced foie gras (which I don’t eat on principle but the other loved!). Next arrived a large bowl of langoustine and then for the main, confit of duck. Excellent!! Best duck I have ever eaten. Dessert was ice cream…….. so we had a great time and lots of laughs! Today some of them have gone off for a day on the seas and beaches of the Mediterranean and others of us have stayed at home for a rest and catch up day. 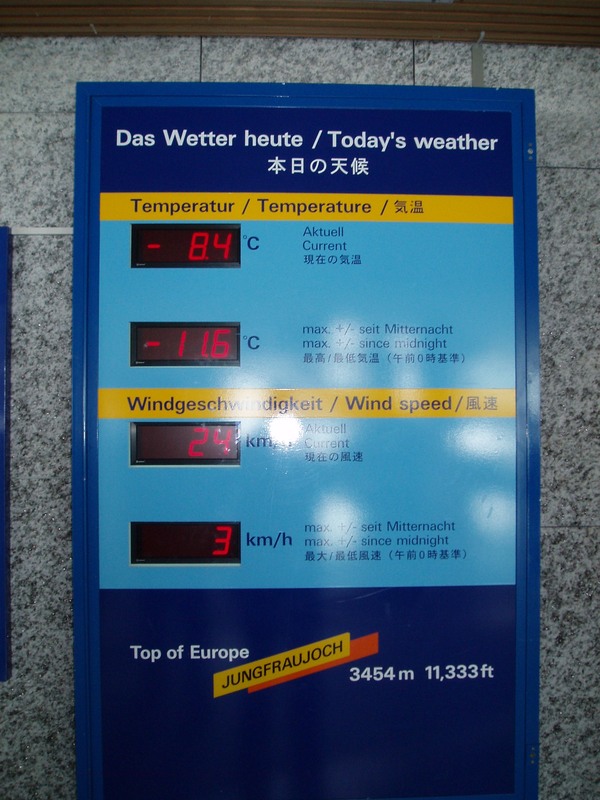 Phew – it is HOT! Woops, sorry, I hear winter is still inhabiting NZ! Anyway, lots of love to you all and thought you’d like a bit of France to warm you up. We are here for three more weeks. 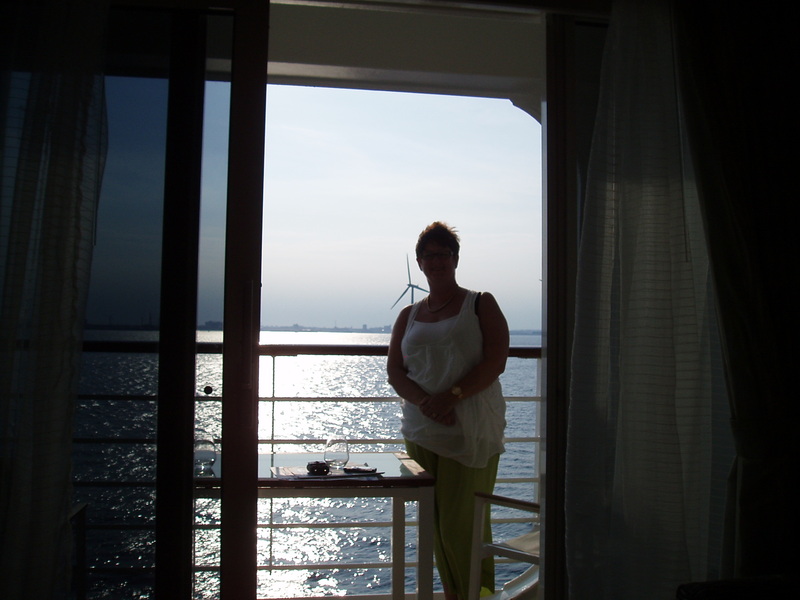 The experience of a wonderful cruise is a joy and a privilege in itself, let alone the holiday and the ports of call, so we thought we’d write a blog dedicated to describing our experience on “The Journey” as the staff and Captain fondly called her. 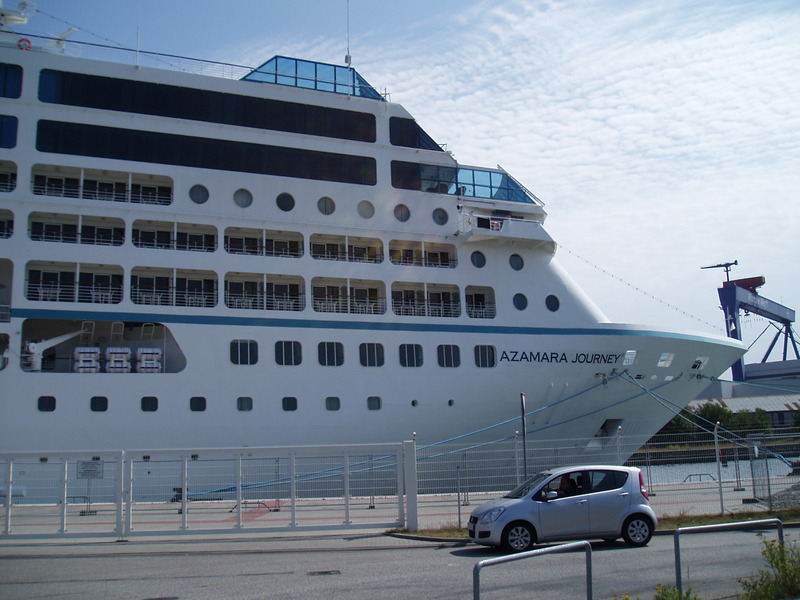 By relative standards the Journey is a small cruise ship taking only up to 700 guests. Others take 3,000 or 4,000 and one to be launched soon will take 6,000. Add to that the crew and you are looking at up to 9,000 people on one ship. No, thanks, not for us! 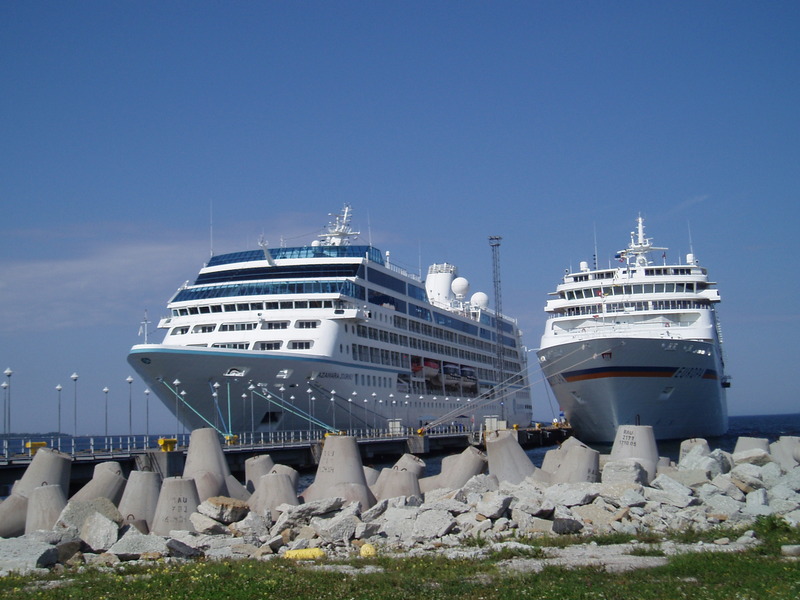 Here is a photo of the Journey in the Port of Tallin in Estonia (on the left). 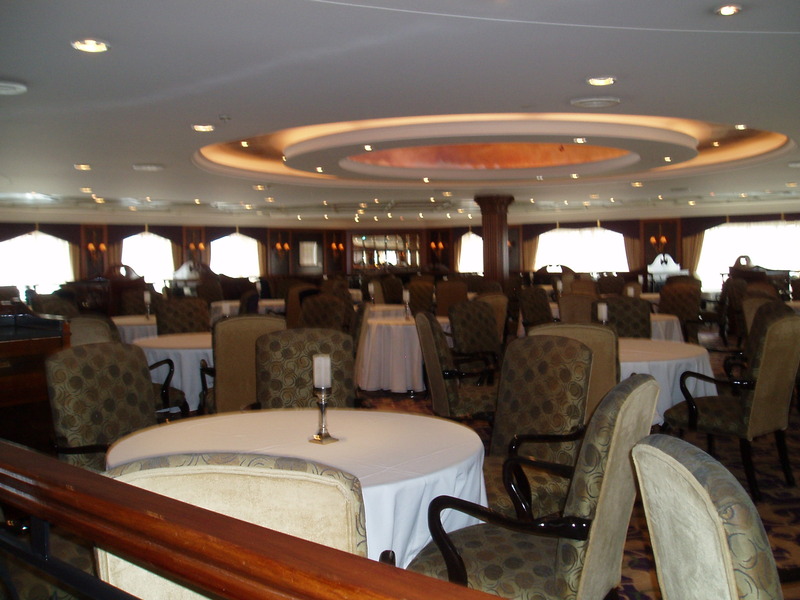 The Journey is a lovely older ship – full of grandeur. It has 1 (smallish) pool, 3 whirlpools, 4 restaurants, a grill by the pool, a casino, a café, 4 bars, 1 cabaret, 1 nightclub, a spa area, an internet room, a library, shops, a gym and a walking track up on deck 9 (it is 10 decks high). The self serve laundry was VERY busy on the at sea days! (Or so Peter tells me as he did our laundry ). Our room was called a stateroom, which the majority of guest rooms were. 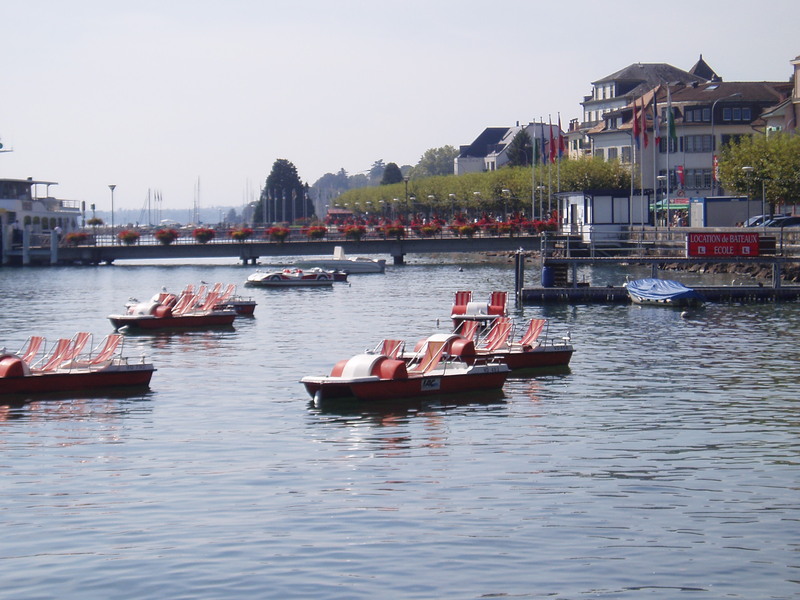 It was beautiful with a deck with two chairs and a table, a bed (funnily enough…………. ), desk, couch, ensuite etc. Each day when we went to breakfast by the time we got back the room was made up already. 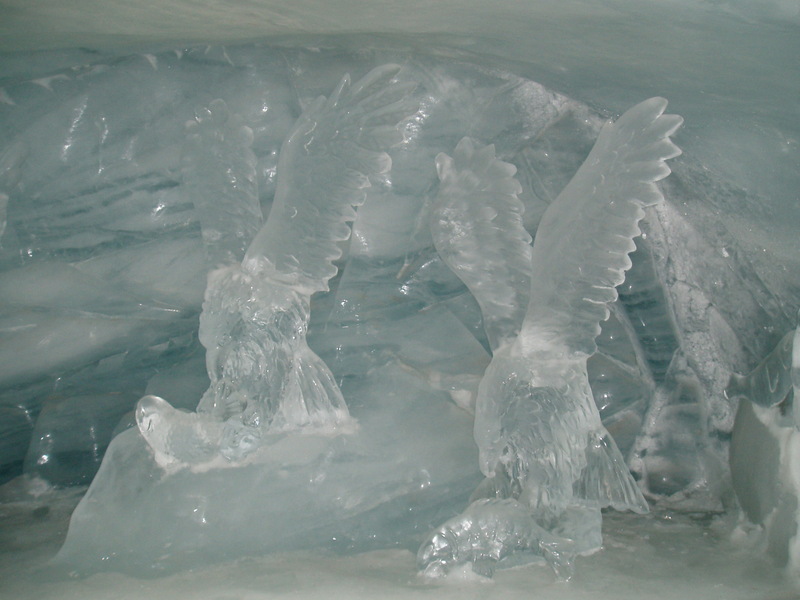 Each afternoon when we got back from shore there were soft drinks waiting and an ice bucket full of fresh ice. Nice touch! Of course we couldn’t let that ice go to waste so a drink on the deck watching shore life or islands sail by was in order. There were a few inside rooms and a few full suites as well. 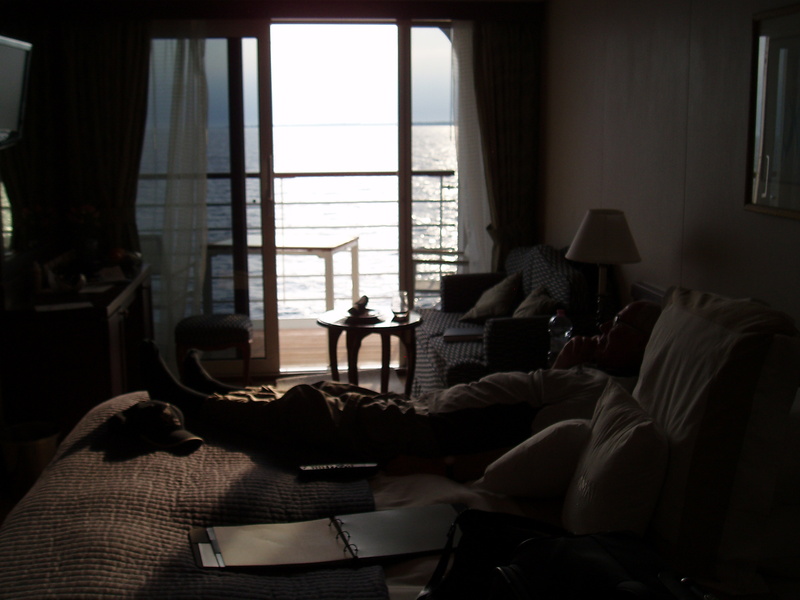 Our steward (the person who looked after our section of staterooms) kindly showed us through one of the suites that was empty. WOW!!! 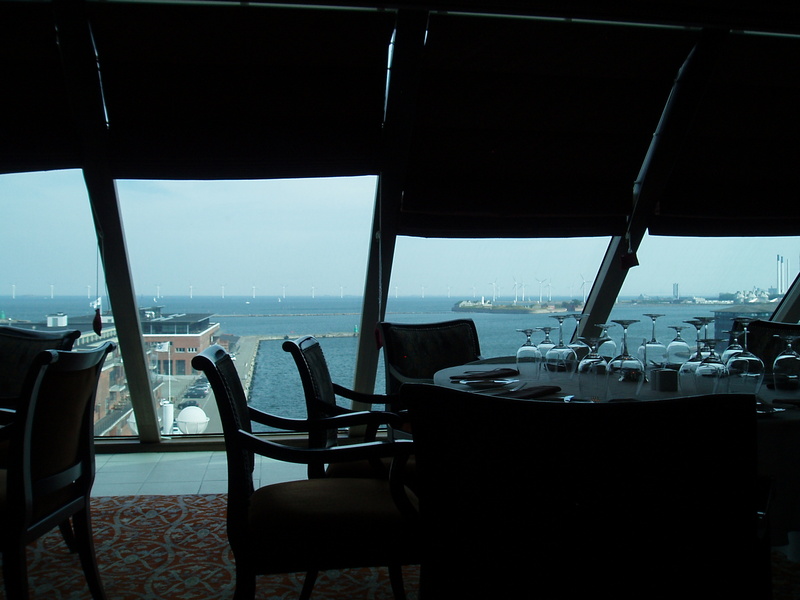 It had a lounge with double doors opening on to a largeish deck at the back of the ship so you had a 180 degree view. A large bedroom, desk and a large bathroom with a spa bath. Apparently if you take one of these rooms with it (and the price!) comes a full butler service, food, drinks etc. On the last day of the cruise they gave us a sheet of facts about how much food they typically take on board for a 12 night cruise, like ours. Phew! Even the logistics of getting on board, storing and moving around that much of anyone thing would be amazing. For example, 12,000 pounds of beef, (yes pound not KG as it is an American ship), 5,000 pounds of pork, 10,000 pound chicken, 10,000 pound potatoes, 8,000 gallons of milk, 700 gallons of ice cream, 1,500 dozen eggs, 20,000 tea bags, 10,000 pound flour, 900 bottles of champagne, 10,000 bottles of wine…………… it goes on. Amazing! Each day they make all their own bread and pastries, as well as cakes and desserts, hence the need for so much flour. They also gave figures on the ship itself like it can take 12.7 m2 of fuel, uses 300 metric ton of water a day, has 6 boilers etc. The emergency generator was a 400kw diesel – phew, good to know they had a big one of those! Getting on the ship on day one was a breeze. No queues. 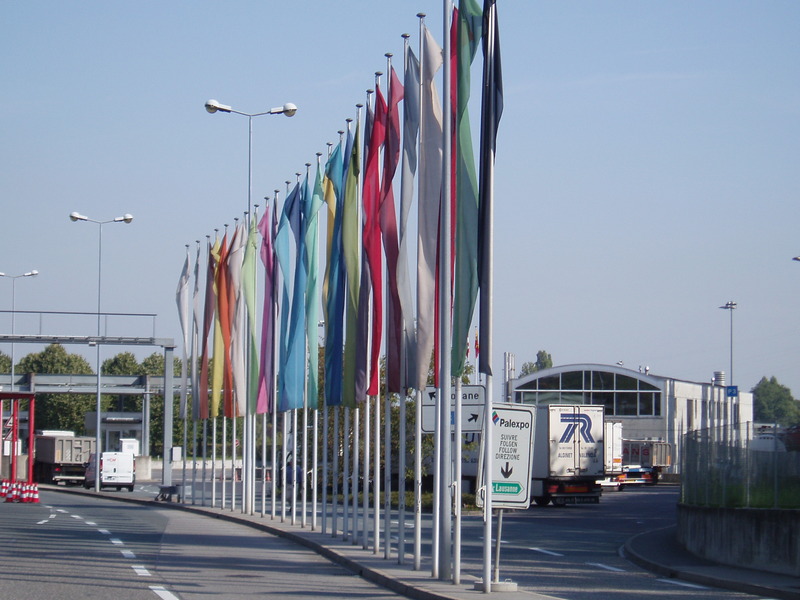 You dropped your bags at the beginning of a large marquee on the port, entered the marquee and went quickly and easily via all the tick boxes needed – health, immigration etc. You were given your room card (one each) and this acted as your key, your on board credit card (uh oh!) and the card to swipe to get you on and off the ship in each port. Also that way they know who is off the ship and when they are ALL back on again, before sailing! It was a great and easy system. Each night you could choose which restaurant to eat at and what time you liked – there was no pre seating which was great. Sometimes you ate by yourselves and other times you shared a table with others. That is where we met Liz and Wayne from Nova Scotia Canada – and have made very good friends with them. For breakfast we usually ate at the buffet on the deck where you could sit outside. The buffet was great – for example there was the cereals and fruit, yogurt and milk etc. Then the section with fresh fruit all sliced and presented beautifully. A section with pastries and breads, freshly made that day. Porridge, waffles etc. A fish section with usually about 4 types of fish, usually including salmon. A huge ham to have hot ham off the bone, egg Benedict, etc and also then two men cooking omelets and eggs to your order. Plus other changing items as well. Phew – it made us tired again just DECIDING what to eat! And then there were the freshly squeezed juices, a smoothie bar, tea and coffee……….. I have already mentioned the lunch buffet in another blog but on the next to last day there was a special brunch buffet where there were all sorts of food in a mixture of the breakfast and lunch plus, to Peter’s delight, a huge seafood bar with freshly cooked prawns with their shells already taken off, lobster etc. Due to the fact we liked wine and ordered from the sommelier we also got invited to the Connoisseur Dinner. Only 11 people were invited. It was a food and wine tasting and was amazing food. We also learnt heaps about the wines from the sommelier. 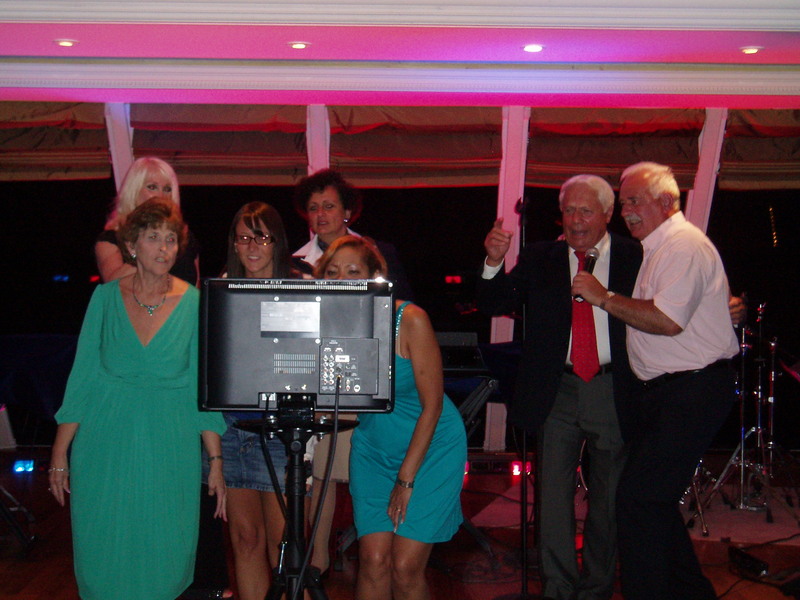 There were certainly a few fun nights we had on the ship – usually we were eating too late to get to the cabaret (did I mention a lot of older people on the ship………….. so early shows; well 9.30…..) but we did get to see an amazing singer from Canada. At that bar we got to meet a few of the staff and got to know them well – it was sad to say goodbye to them at the end. On our cruise there were 42 nationalities of staff. Serbia, Malaysia, Philippines, Croatia, India, etc. Each day (well the night before) you got a newsletter delivered to your room detailing sunrise time and sunset time. The expected temp, all the ship activities the next day etc. It was very useful and informative. We liked it a lot. But I have to say we did none of the ships activities like bingo, the two step dance lessons, playing cards or scrabble, movies, quiz afternoons etc. Oh, actually that is not quite true, we did do the vodka tasting! One thing we learnt was that when we saw the amazing fireworks as we sailed out of Werdumunde the Captain chose to sail very slowly so we could see the display. It went on for an hour or more and then he had to go “foot to the pedal” (his words) to get us to the next stop in time. Doing that used a lot more fuel and now he is having to justify that to his superiors!! So, that is life on the sea for us. The Looking Glass bar / nightclub where we went most nights...... yes, sometimes it was THIS busy! 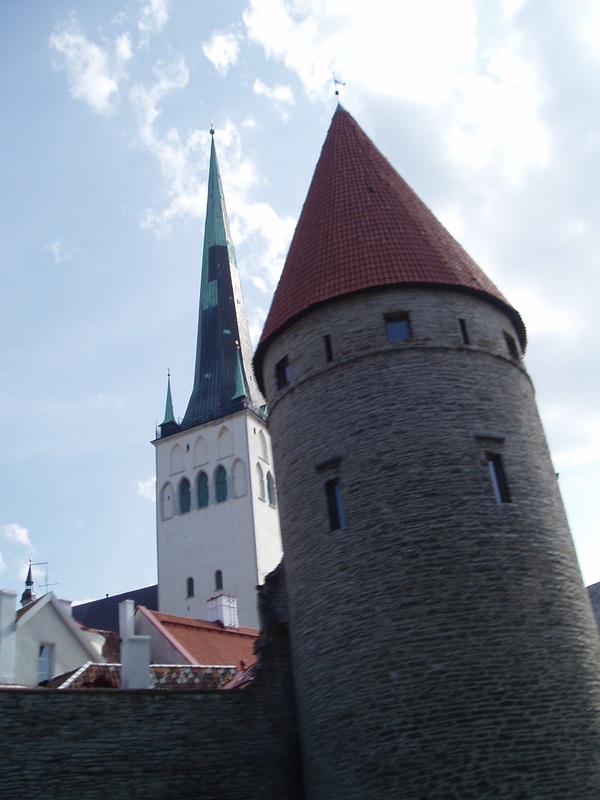 Tallin was a very beautiful old city of the Baltic, with modern parts as well. We loved the architecture of the old city. 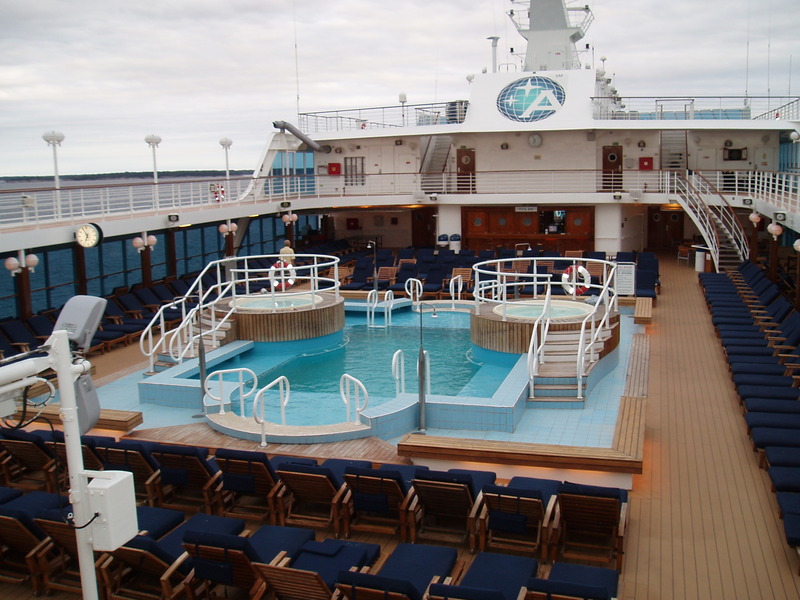 As the ship was only in for a day, and we slept in that morning, we had a short visit ashore, but it was so lovely. It was here we got also to some local markets where they were selling woolen garment, hats, scarves etc and at very reasonable prices – well compared to other parts of where we had been anyway! 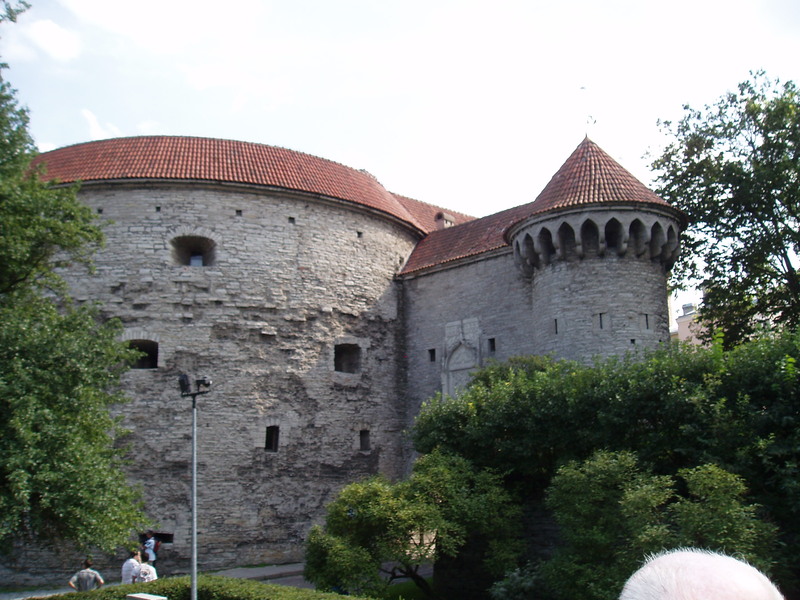 We did the hop on hop off bus to see all the sights and it was so informative about the history and development of Tallin. Stockholm we had two days in. We did the hop on hop off there also. They are such a good service. We did not do an organized tour but spent a lot of the day wandering the old city streets on our own. Well, on our own with thousands of other tourists, that is! It was sooooooooooooooo HOT! AND soooooooooo EXPENSIVE! 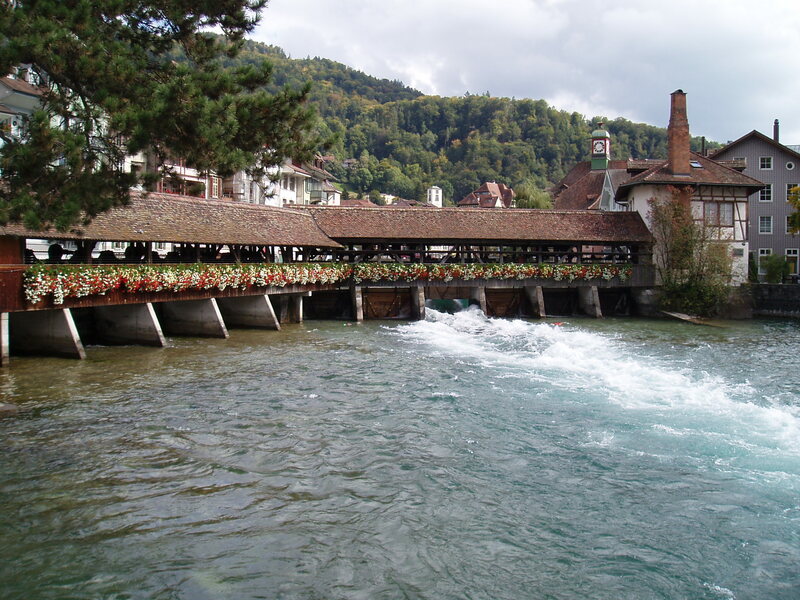 We stopped off for a drink at the bar on the river edge and a glass of wine cost about 17 euros – that is about $25 NZD! Gulp! No, SIP, actually. 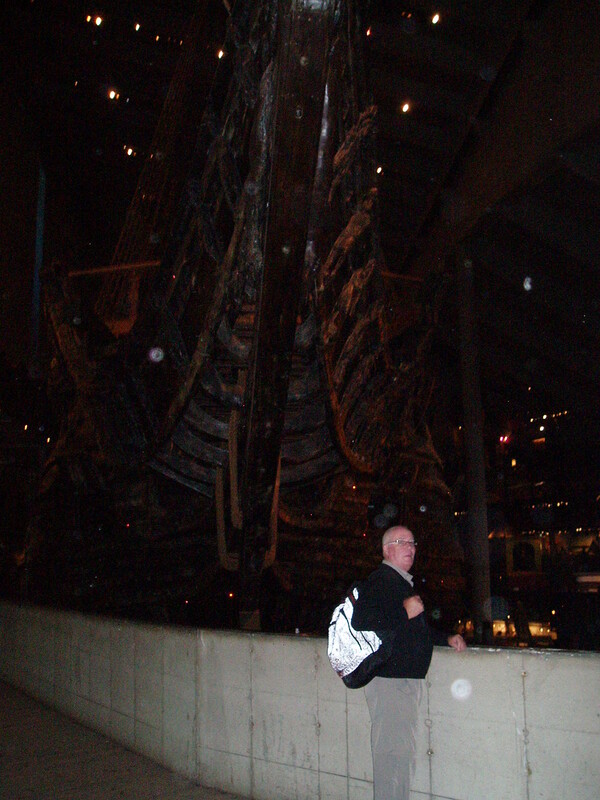 On the second day we went to the Vasa Museum – which is a very old ship that sank in the harbor on its maiden voyage. 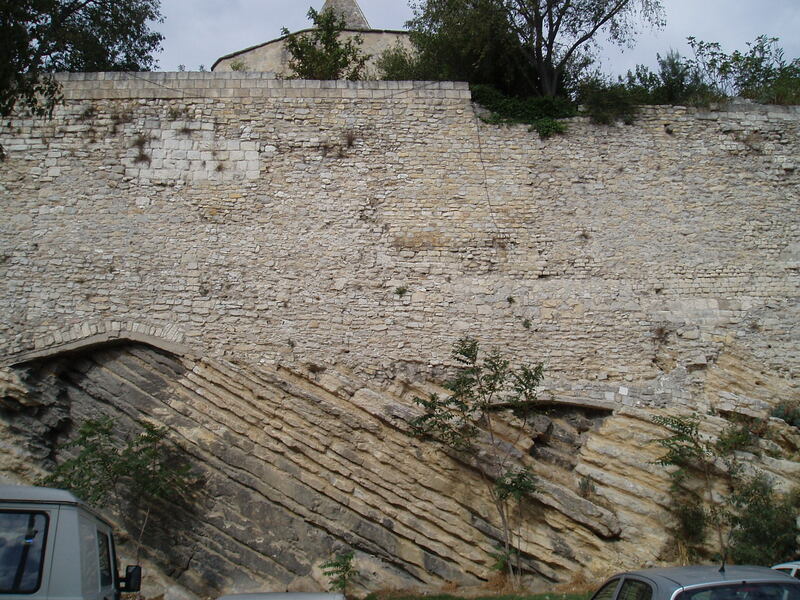 After 300 years under the sea they managed to raise it and reconstruct it. 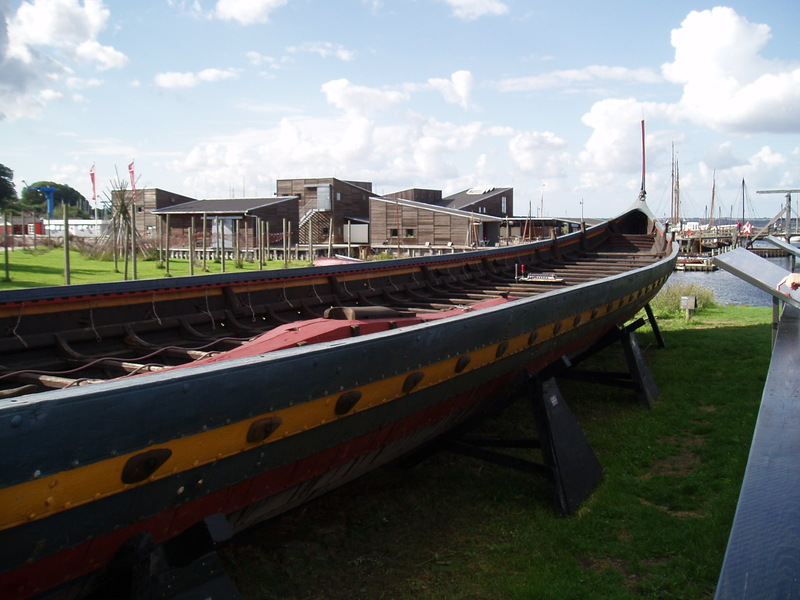 The museum was very interesting in why the ship was built, how, who etc and then how they raised it up and restored it. The last full day on the ship was at sea and was a lovely time to catch up with people you had met, enjoy the food and pack. Unfortunately the weather wasn’t too sunny so not much pool lounging, however it was warm enough. The whole time on the cruise, I only wore a cardigan once. When we disembarked for the last time, it was Copenhagen. 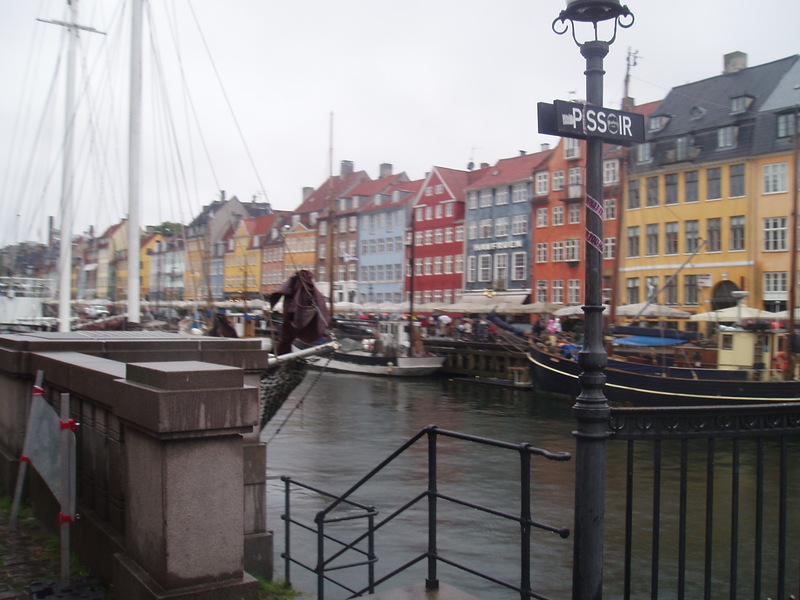 Most people were off to planes to go home but we stayed three nights in Copenhagen. It sure is a beautiful city, but we also got to see some of the other side – drugs, street people, and a strong stench of human urine in the streets. We went to a part of town that is all old colourful houses, or they were, and now it is the restaurant and bar centre and we had lunch there. It was also delish! 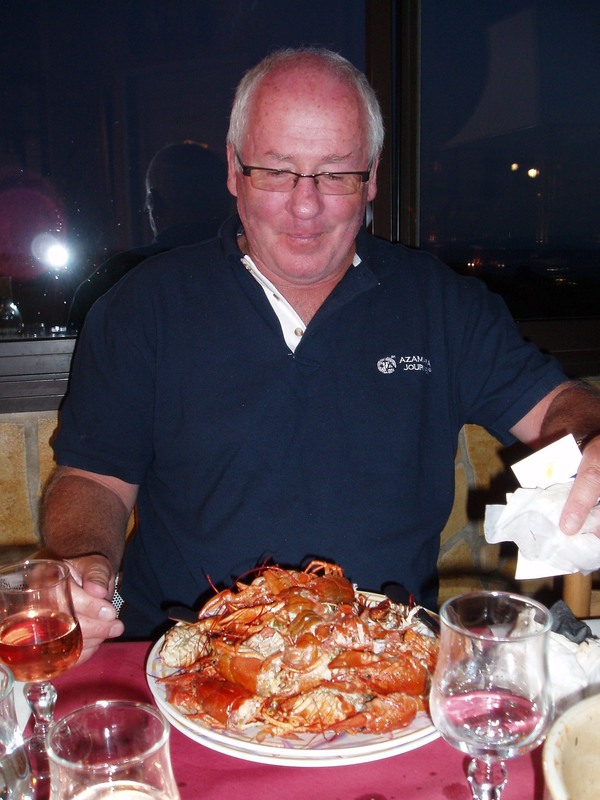 Peter had the local fish delicacy which he said was like a very nice flounder. 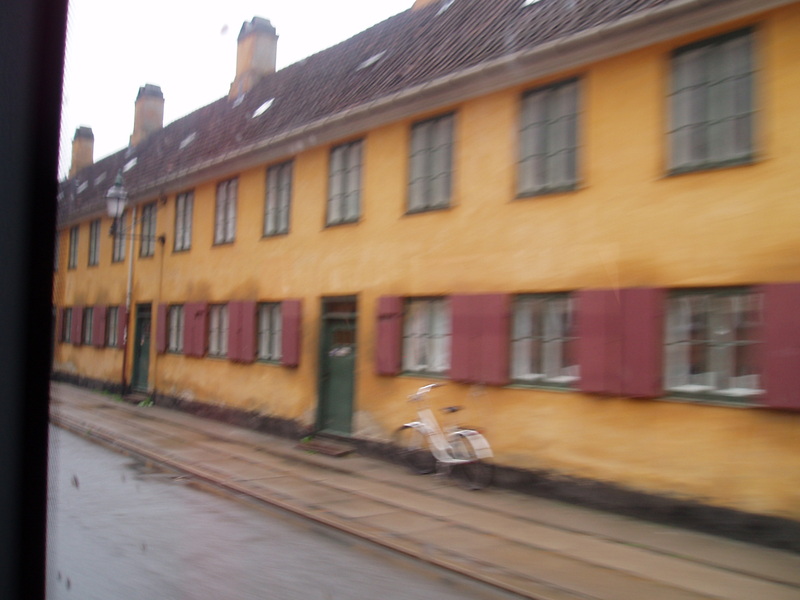 In three of those houses Hans Christian Anderson lived when he wrote his famous works. We also got to see the ED service at the hospital – no, not to worry, this time it was proactive. 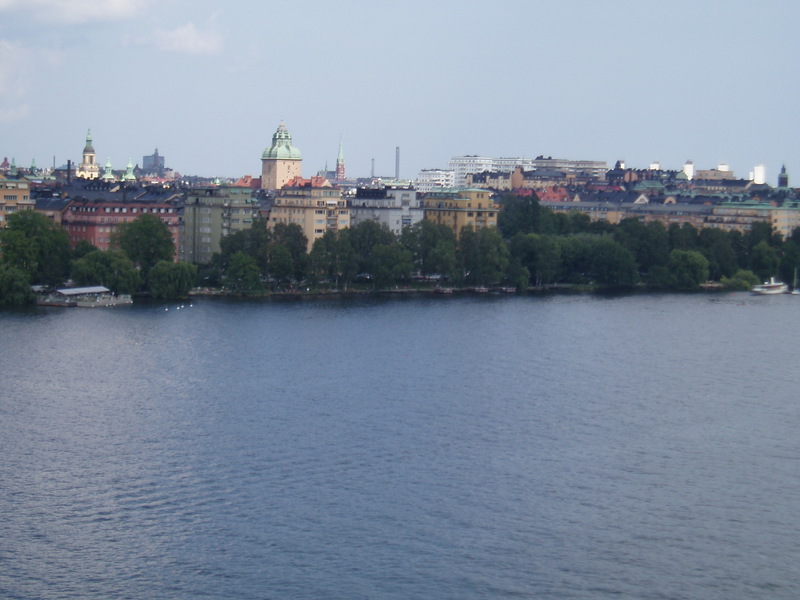 Peter still has to have regular blood tests and in Copenhagen that is where you get them. It was the most efficient system we have struck for blood tests and it was free! Apparently the politicians of Denmark think all people should have free health care. 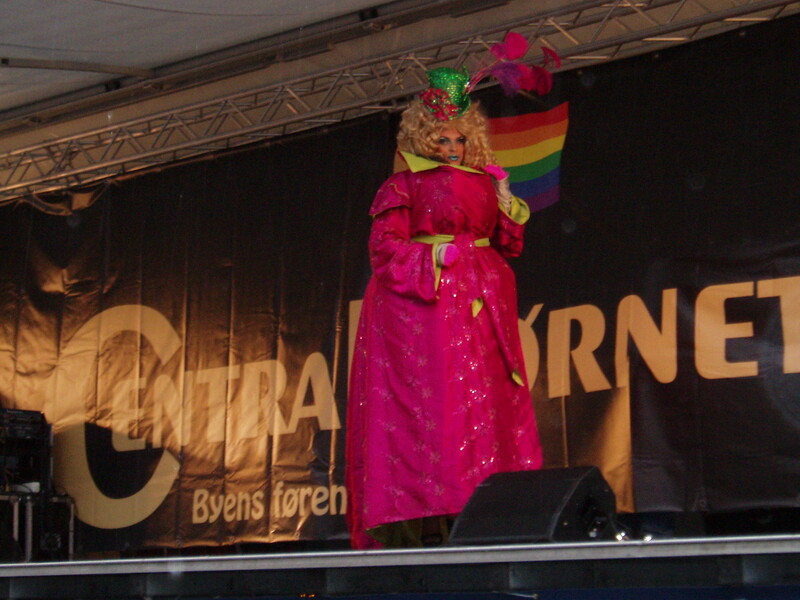 That afternoon we happenned on a Gay Pride show in teh town square. In spite of teh rain we stood and wathced a band and a drag queen show – they both were excellent. Drag Queen in glorious spendour! We ate that night at an amazing restaurant I had read about – and magically it was just around the corner from our hotel. 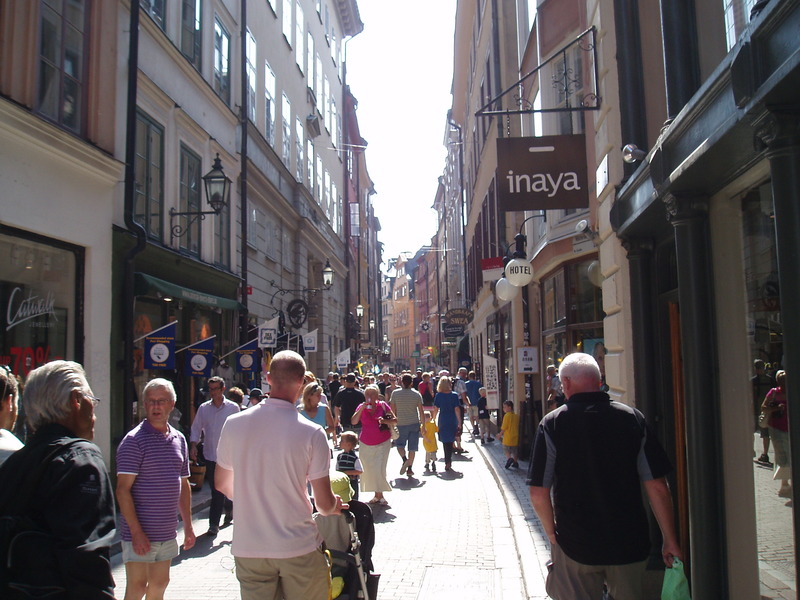 It was typical Danish food but in a very nice restaurant that serves it in what we call Tapas Style – i.e. a range of small plates. Delish! I commented on the large use of the herb dill, and the waiter laughed and said how did I guess the chef was Swedish – the Danes use horseradish and mustard, not dill. The next day Peter went off to the Viking Museum – which he had to work out how to catch what regional train and what bus at the other end to get there, and he did! It is a bit tricky in a foreign language. I went to look at the Danish Design centre and then some shops. The Danish design detail and ingenuity is amazing. That night we asked at the hotel about a local good Vietnamese restaurant – and we were not disappointed. A young chef had just started out on his own a month ago and we met and talked with him a lot. Got to know the trials and tribulations he had – not least of all his mother is the cook and cant be hurried along! It was a funny story. Unfortunately we talked too much, and we thought Tivoli (a local theme park but with apparently amazing gardens and night lighting) closed at midnight so we rocked up at 10.45 to go in and were refused as it was shutting at 11. The hours had changed the week before back to 11pm! Dang!!!!!! 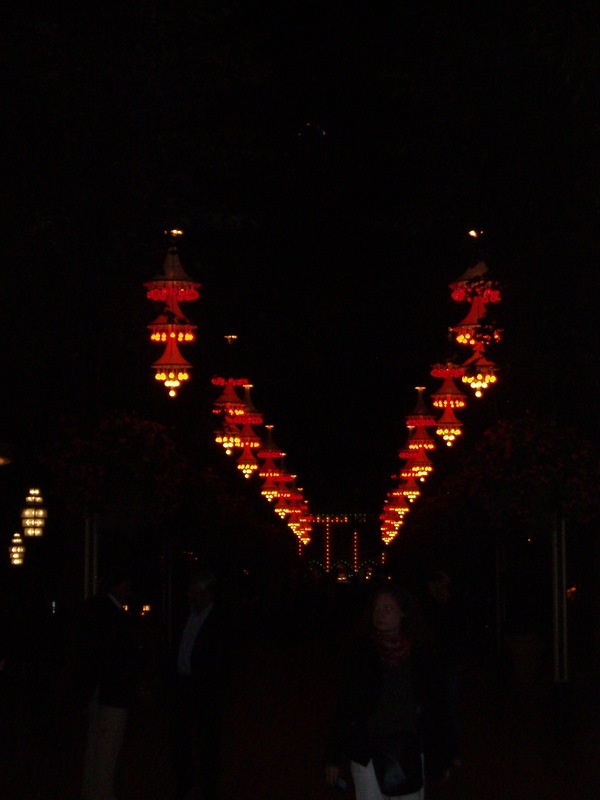 Tivoli entrance lanterns - all we saw!! The following day was leaving time and we caught a cab to the airport. Oh the queues for check in! A kind lady assistant came and helped us check in on line / self check in so we missed the queue. 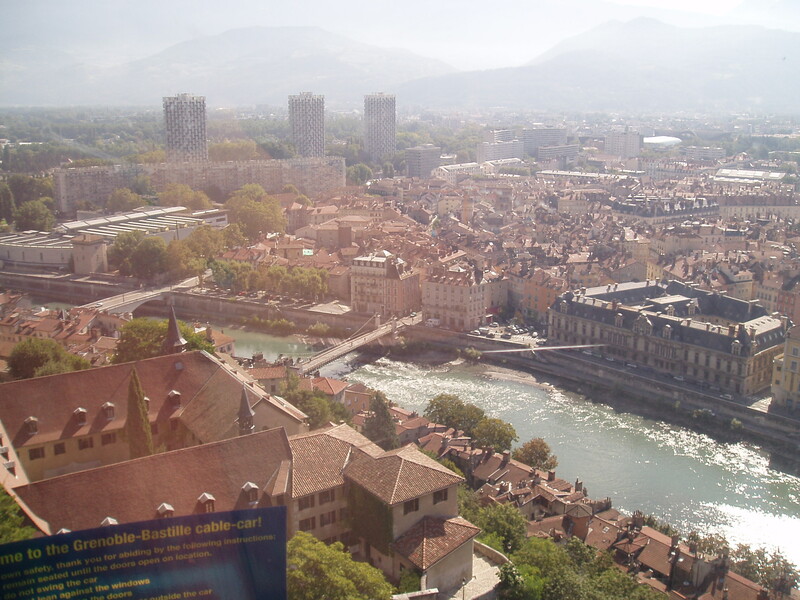 We flew from Copenhagen to Heathrow and then Heathrow to Toulouse, for our new holiday chapter and French adventures. (I tell you – our first day here we have sat quietly just reminiscing and absorbing everything we have seen, people we have met, laughter and friends. It has been lovely to have that time). So here we are, in a little French village called Saissac, in the South of France. We are here for a month and we are looking forward to our adventures and fun here too. Lots of Love, Jo and Peter. Well, this blog will be hard to write to try and express what we have seen here in St Petersburg. 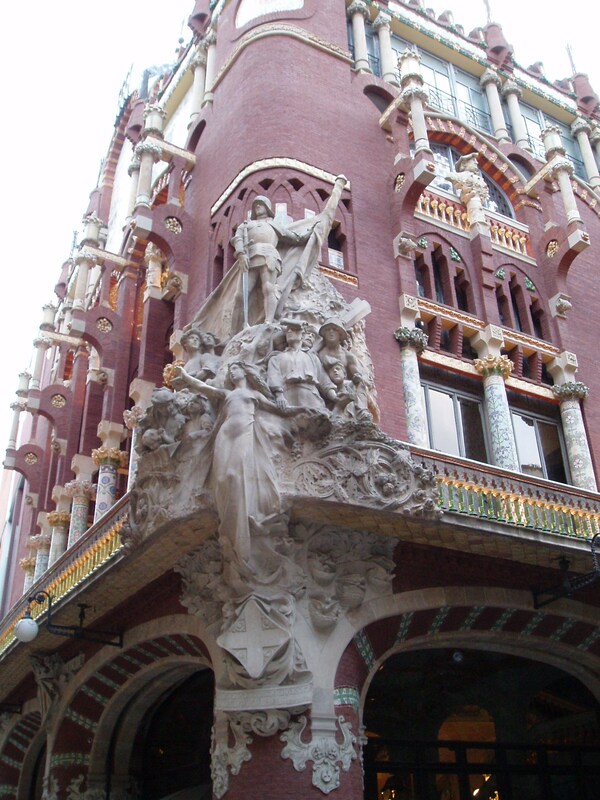 It is a stunning city and we have been amazed at the buildings, architecture, etc. And the wealth of previous rulers as expressed in the buildings and land they had. 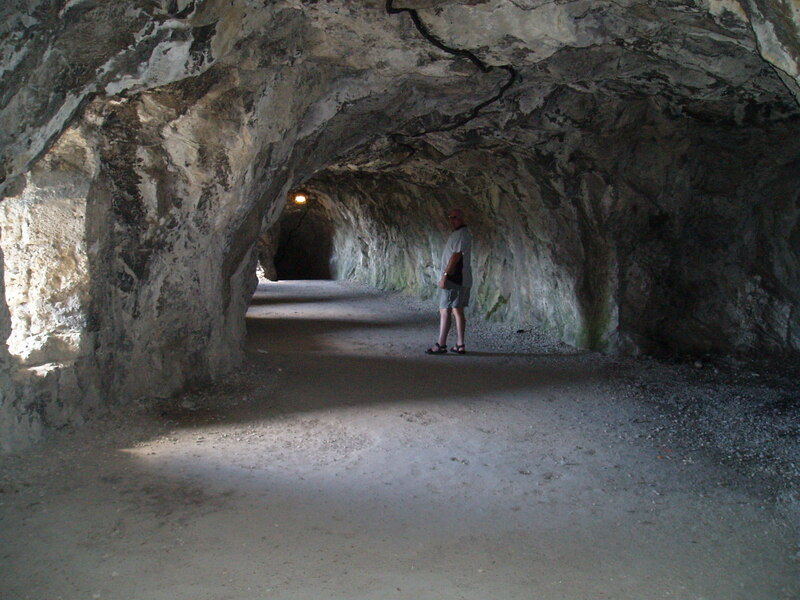 We have had two days here and we chose to go on a private tour. This involves a car, a driver and an English speaking guide. We so appreciated doing it this way – no queues, excellent information and Karina, our guide, had excellent English and we enjoyed some jokes with her too. We were also very lucky with the weather. Apparently the skies are mostly grey here all year except for July. But we have had sun every day and about 25 to 30 degrees. Karina repeatedly said she couldn’t believe the weather. The first day here customs was a bit of a hassle. We had to be off the ship at 8am to meet Karina, but so did the first two tour bus people so there was a bit of a queue to get through customs. No smiles or chatting from those people! We didn’t need to arrange a visa as it was sorted via the tour – so in effect our tour ticket was also our visa. You are not allowed off the ship unless you have a visa (which you have to arrange in your country of residence) or a tour arranged. So we haven’t been able to go wandering in to town etc. That has not stopped the crew who has marine visas and they go ashore after work at night and some don’t return till 6am and start work at 6.30. Apparently the secret is to drink copious amounts of red bull when you get back on the ship!! Just while I mention the ship crew – they are fantastic!! Very friendly, helpful etc. One of the benefits of being on a smaller ship. The bar lady calls Peter Mr. Peter. Last night we had dinner with Canadian friends we have made on the ship then we all sat on the deck listening to the party music at the pool and watching the amazing sunset. Two of the crew joined us and we drank Russian vodka and had a lot of laughs with cruise stories, including Peter’s fishing story. 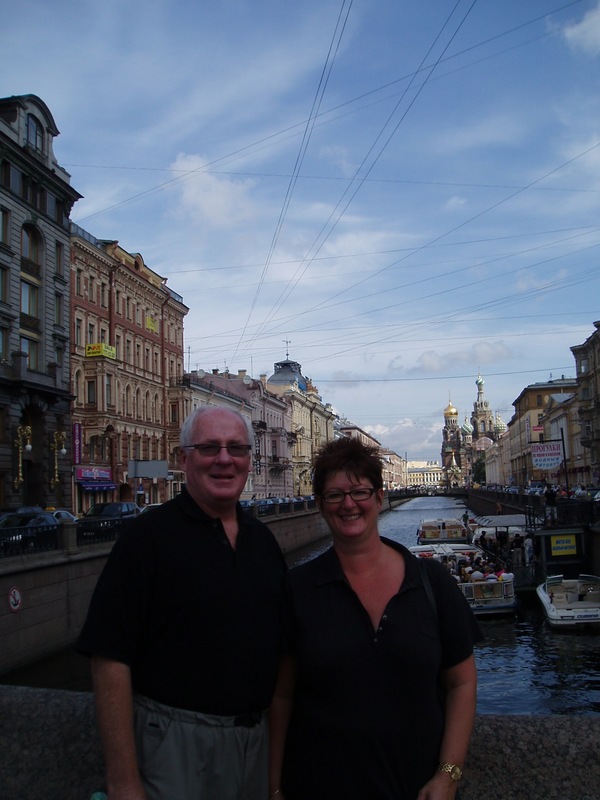 Right, back to our time in St Petersburg. So after customs Karina was waiting for us with an “Esplin” sign. Very easy to find. The driver was called Igor and didn’t speak a word, was rude and wouldn’t come to pick us up when Karina took us for an unscheduled walk in to the centre of town. She said “I don’t like that man – don’t tip him”. He was not a happy chappy at the end when Peter shook his hand and no tip was left there! So, day one. Before I start, a warning – there are a lot of churches in this part. But these ones are truly something else! 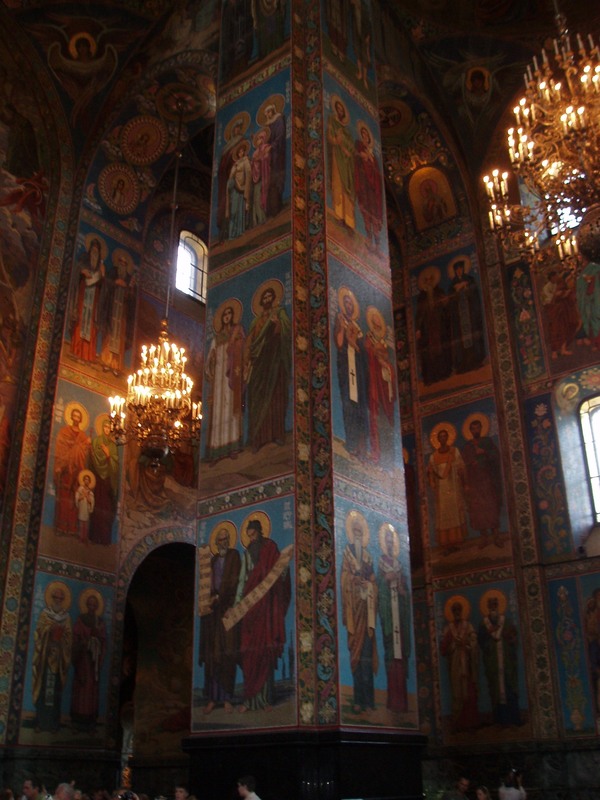 We first went to a local church (Cathedral of St Nicholas) where a Russian Orthodox service was happening. The church was amazing in its own right (gold leaf, decorations, art, etc) but with the priests singing (no musical instruments) and chanting and echoing around the church it was a very spiritual moment. After a drive and seeing some of the local sights off to St Issacs Cathedral. 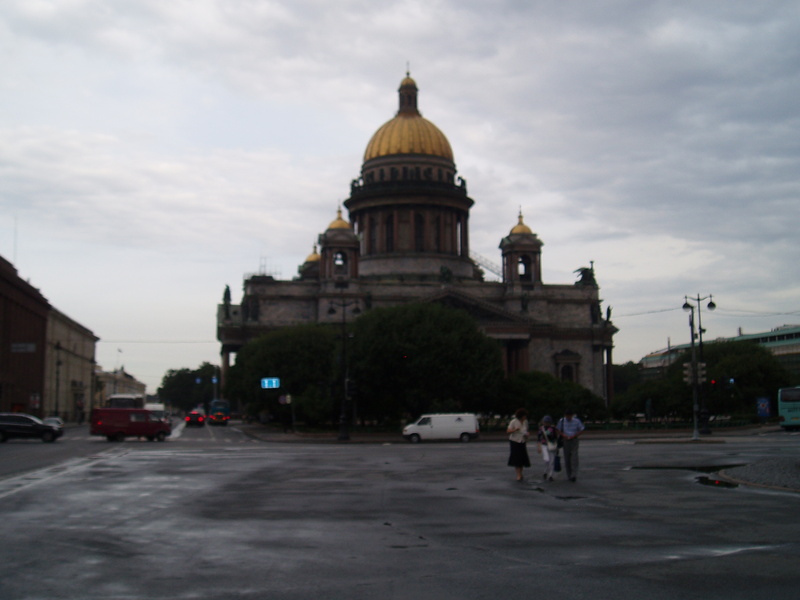 This one is famous for its huge gold dome. And it is huge! How do they keep them clean…………… In the same square as St Issacs was the Astoria Hotel – where Hitler had planned to have his big party after the war. He even had the invitations printed already. It is a huge place and we went in to the foyer to have a look. All marble and chandelers. 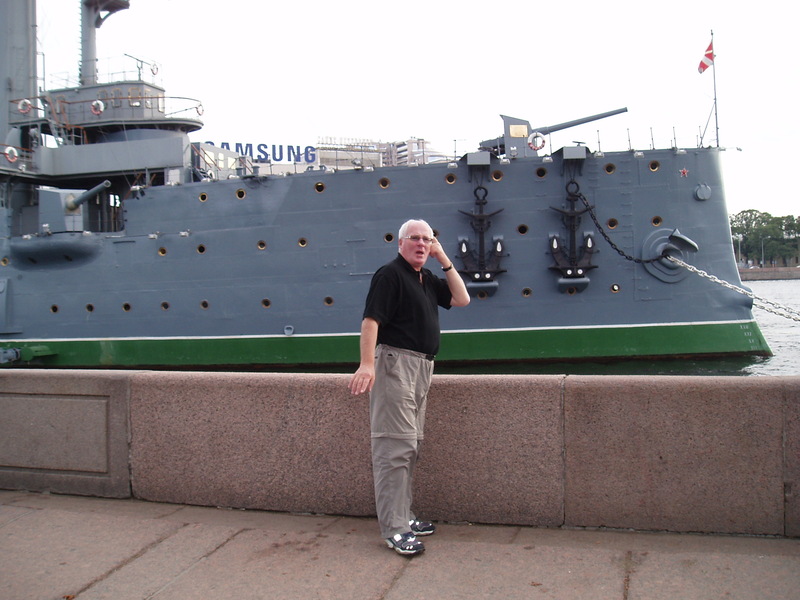 Then we got to view the river, the Winter Palace, statues galore, Peter and Paul Fortress, and the Aurora Cruiser – which was the navy ship that fired the blank shot to start the revolution here. 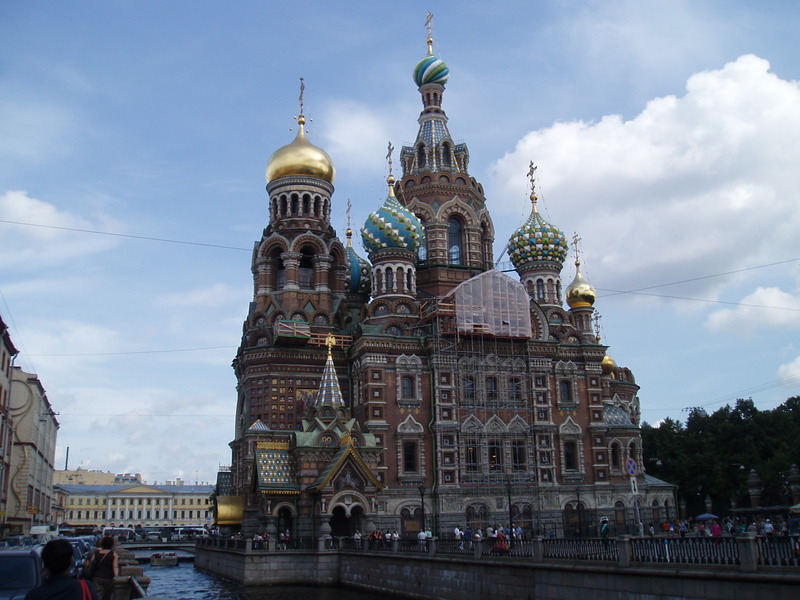 And then………… we went to see the Church of the Spilled Blood. Oh what a place and what a story. 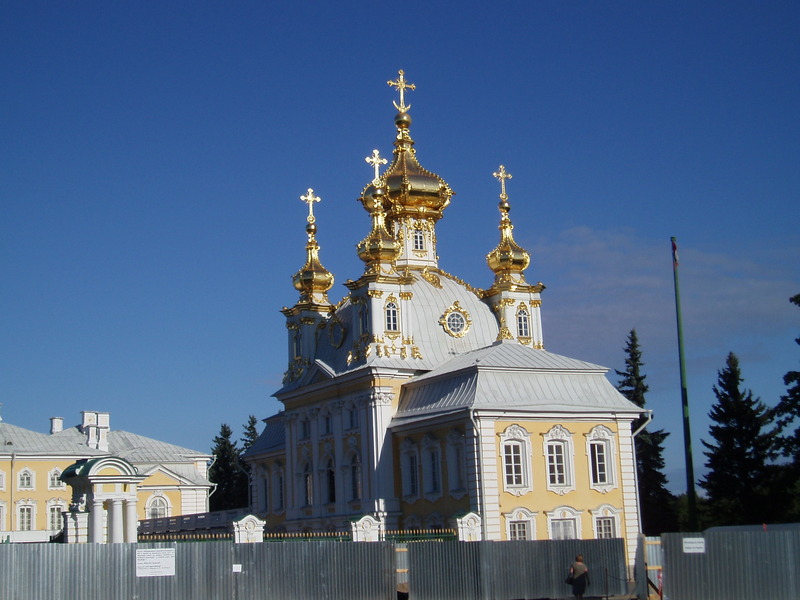 I wont bore you with all the details but it is basically a shrine to Alexander II. Amazing both inside and out. 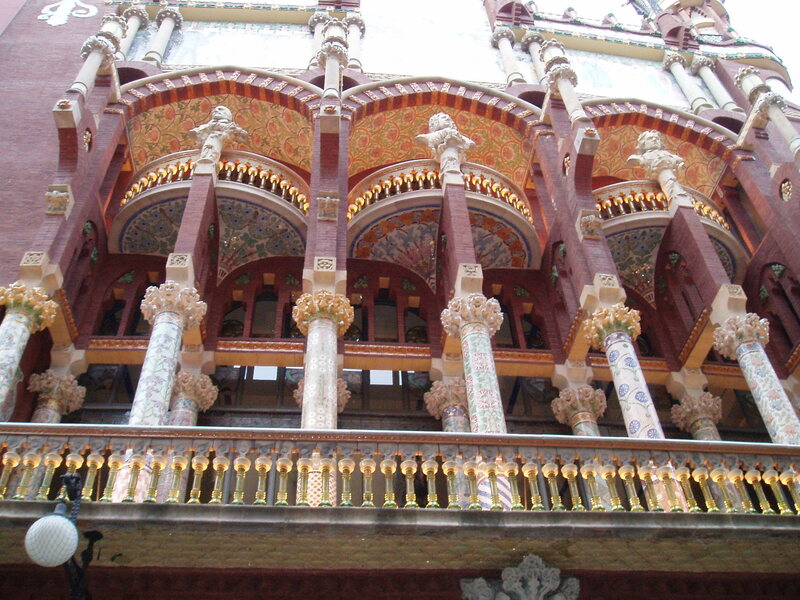 What they built way back in 1880’s……….. it has 220 sq metres of mosaics in side! We really were amazed and kept saying “Wow”, “wow”, “Wow”. We got back to the ship about 2pm in time for lunch of course. The lunches on board you have two choices (three if you include room service, but who would with all these views from the decks!) One is a full buffet with foods galore and the other is a Grill by the pool – with hamburgers, wings, ribs, baked potato etc. The buffet changes everyday and usually has a theme. Today had no theme but options included soup, a sandwich bar, a Caesar salad bar, hot beef sliced to order, pork medallions, chicken escallops, vegetarian pad thai, tons of vegetable dishes, a taco bar (mmmmmm great chilli and best ever guacamole! 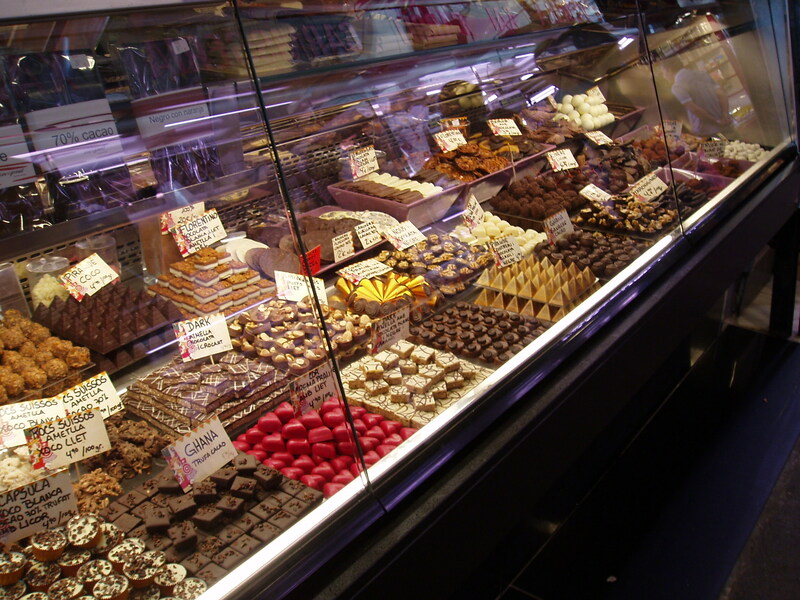 ), a bread bar, a salad bar with 5 different salads and a dessert bar. Oh, and of course the ice cream bar! Wine is complimentary with lunch. Then the next day we had a full day tour with Karina and a new driver, Constantine. What a day. 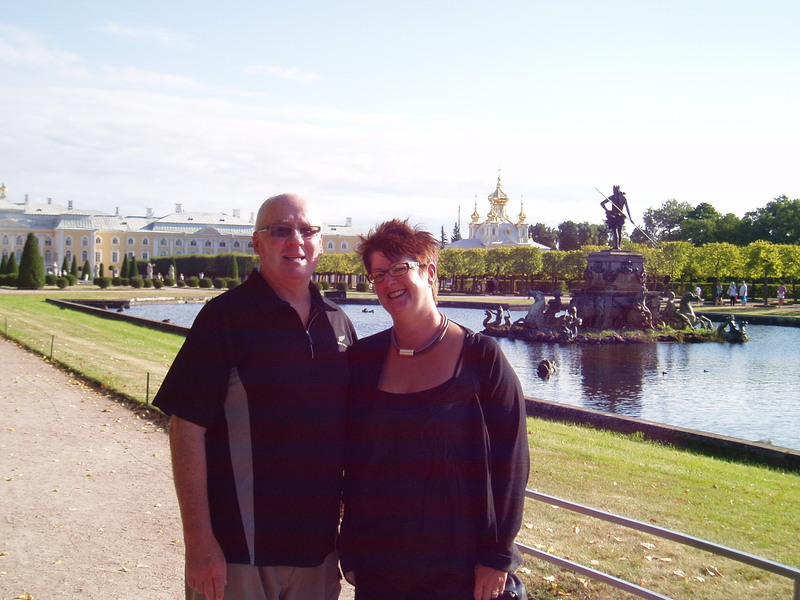 We visited the Summer Palace (oh my goodness! 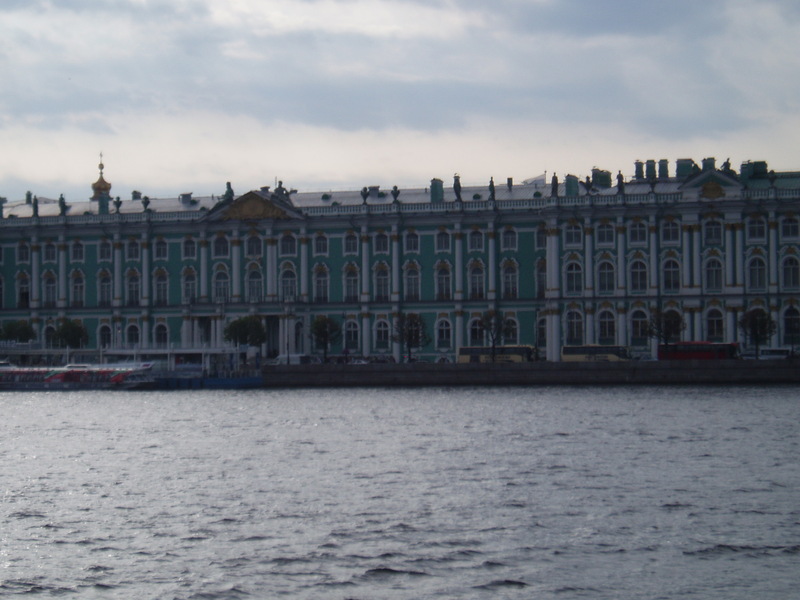 ), the Hermitage Museum, which is the Winter Palace, and saw a few extra sights. We are kicking ourselves we didn’t ask to see the subways, as apparently they are full of chandeliers, art and amazing to see. The summer palace is very hard to explain. So amazing. No photos allowed inside due to the original 19th century silk coating the walls instead of wallpaper, the original dinner set etc. Some articles had been taken away and hidden before the war which is how come they survived and the others are reproductions based on drawings and writings. We have never seen anything like it. 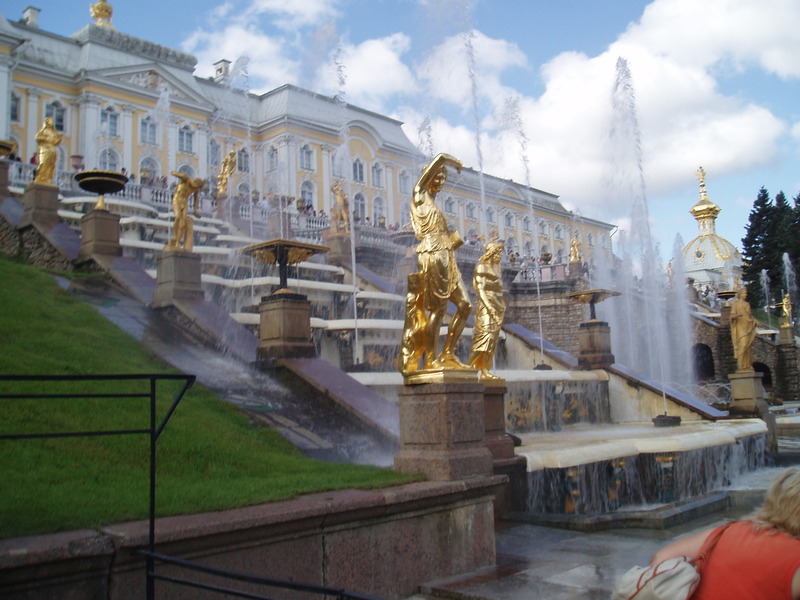 And the grounds with the fountains…………..
And yes, it is real gold gilt on the statues. They cover them in the winter with boxes. 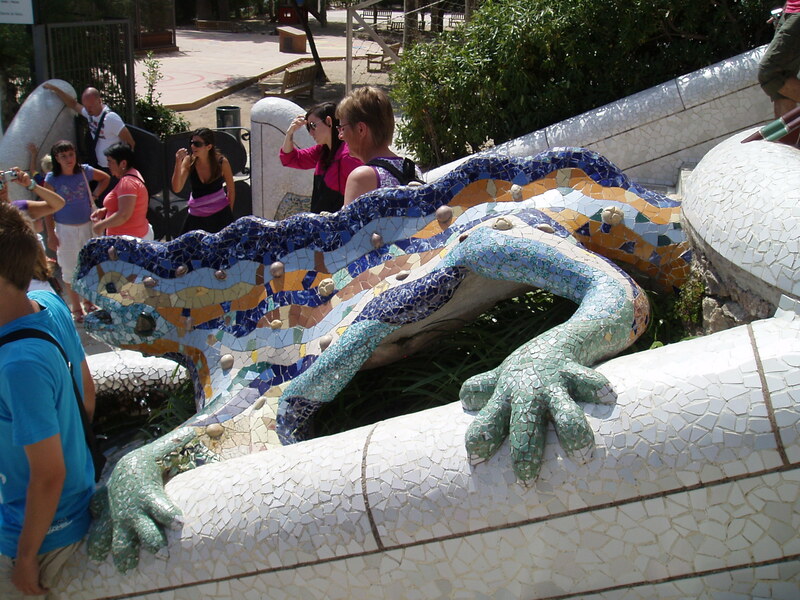 The fountains are very powerful and have no pumps or anything – it is all gravity fed. 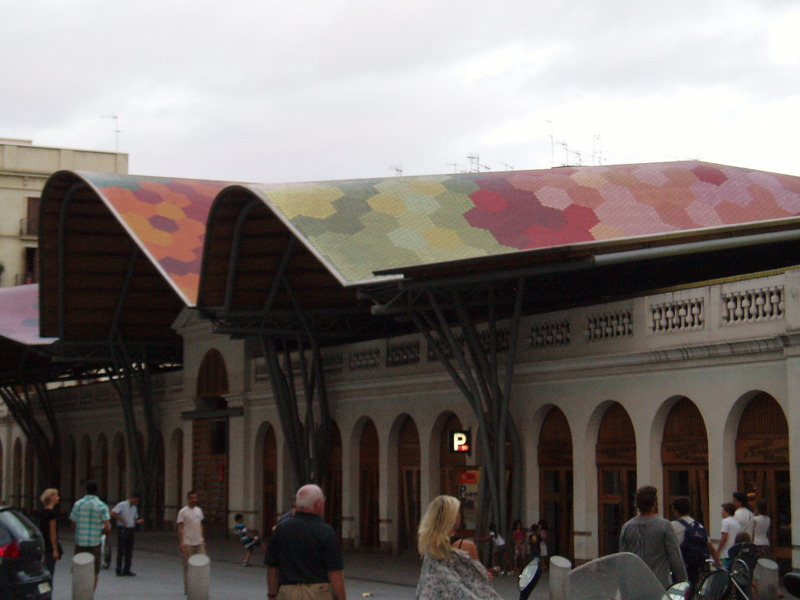 And designed so long ago – it is quite incredible. 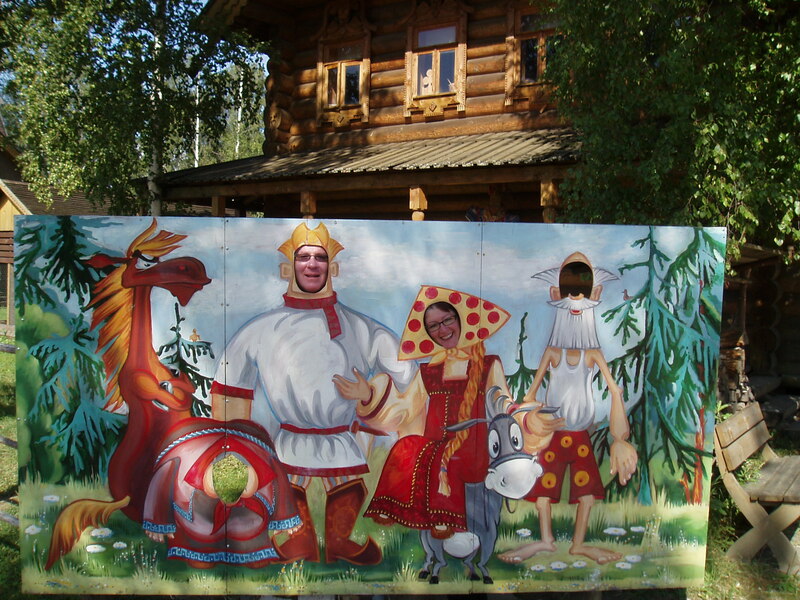 On the way back to town (an hour drive which was a 3 day horse trek back in Peter the Great’s time) we stopped off at a tourist village to see a traditional village look. Then Karina took us for lunch at a traditional café, instead of the usual big hotel restaurants. We were very happy about this. 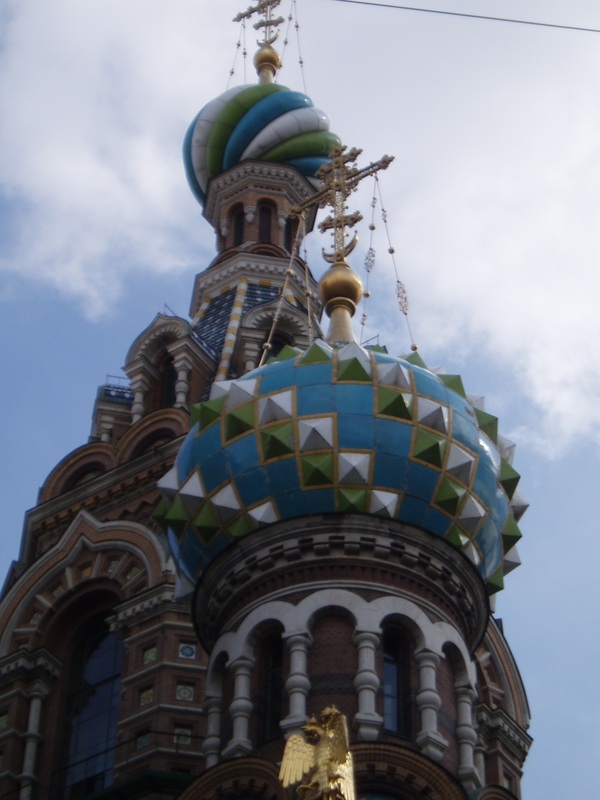 Turns out Russia is famous for its pies – oh I wish now I had taken a photo of them. A whole server full of these pies – all beautifully decorated with pastry cut outs, and full of interesting insides – chicken and rice with dill, meat, mushroom, fish etc. And each pie is square and HUGE (e.g. 1 foot by 8 inches) and you order by the size you want. 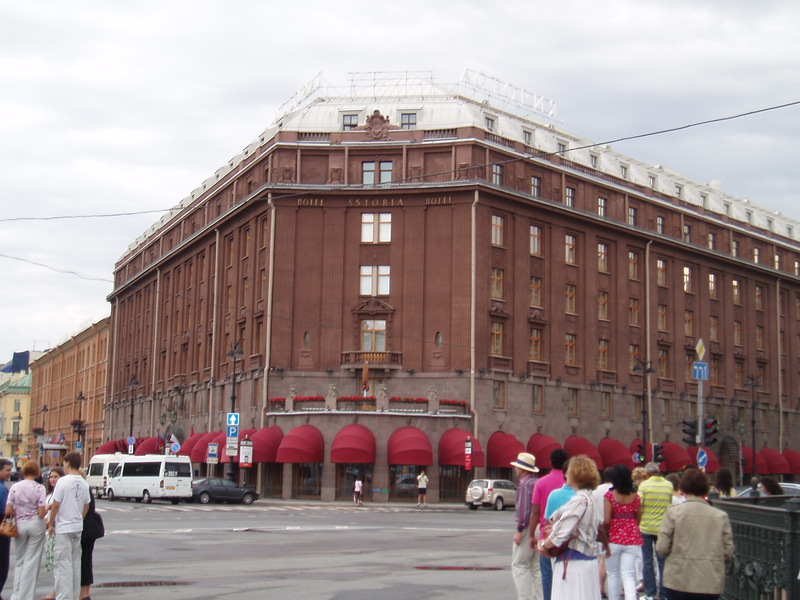 Peter also had the borsch – the beetroot soup and I had something I can’t spell or pronounce……. Meat cooked in dumplings, smothered in sour cream. A lot of sour cream is used here. They were OK, but different. Once again a lot of fresh dill on top. 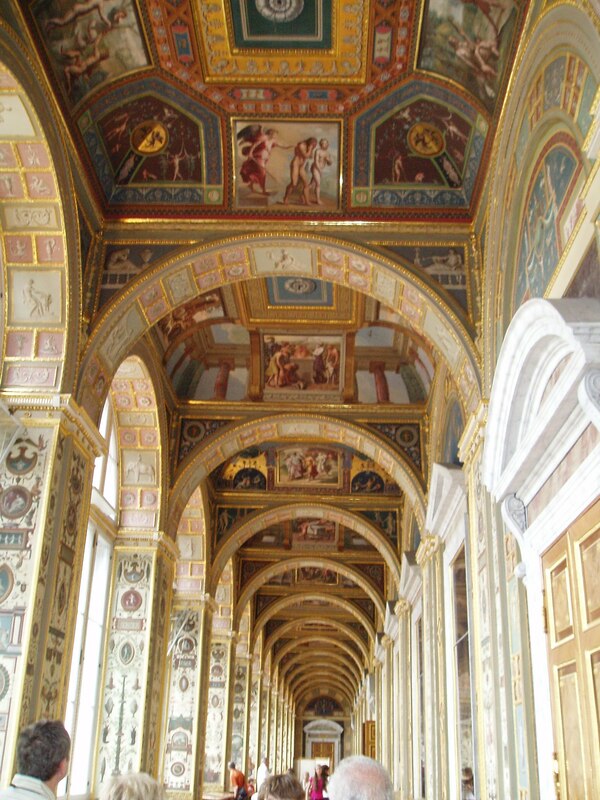 Then off to the Hermitage Museum. Oh to see Renoir, Raphael, Michael Angelo, Picasso, Rembrandt, …………… all together. There are over 3 million works displayed and needless to say we didn’t see all of them (thank goodness!! Phew!). 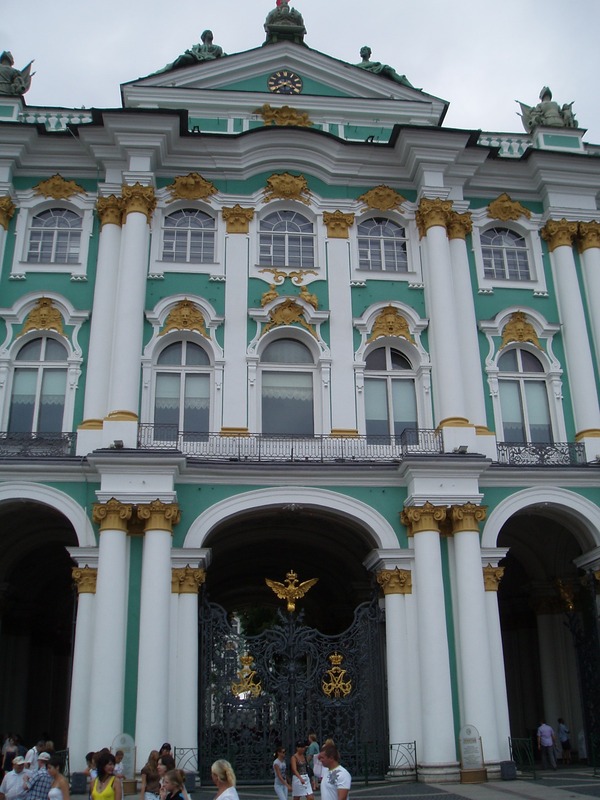 This is all in the winter palace so the building itself is quite something. I am sorry I can’t quite portray the feeling, the opulence etc via words. I hope the photos do help. Raphael’s ahll painted by Raphael at the request of Catherine the Great, to rival teh Vatican’s paintings. 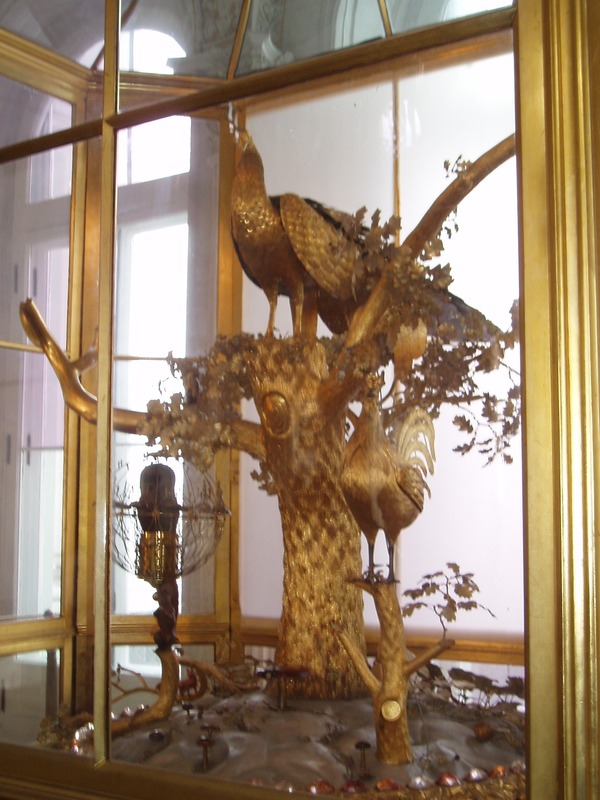 This 24 carat gold clock was presented to Catherine the Great – the animals are animated and each Wednesday at 1pm they still wind it up for the animals to move. We got back to the ship at 4pm and I felt a little sad to be saying goodbye to Karina. She was so lovely and knew so much we had formed a bond with her already. Last night we ate with the Canadian friends at one of the two specialty restaurants on board, where the food is amazing and you need to pay a little extra to eat there. We had a great dinner (French onion soup, goats cheese soufflé, pork and then dessert) and then joined the party at the poolside with a band, singers and such. Watched the sunset go down at 11.15pm!!!!!!!!! 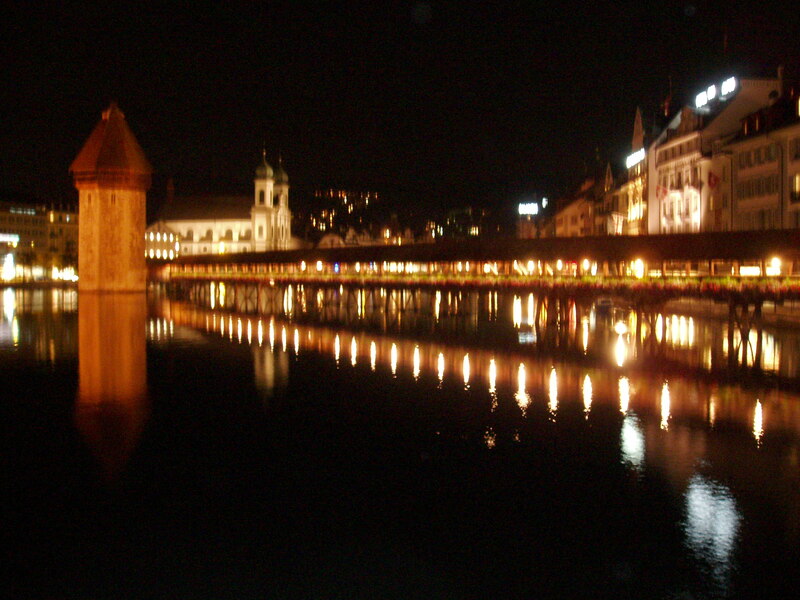 Then we went off to the night club and danced to a DJ music and were still up to watch the bridges over the river open. Of 300 bridges here 25 open (raise up) every night from 1.30am till 5am to allow ships to enter the river. It was a very beautiful sight. So that is St Petersburg. We could have spent a week here of course but feel so privileged and in awe to see what we have. 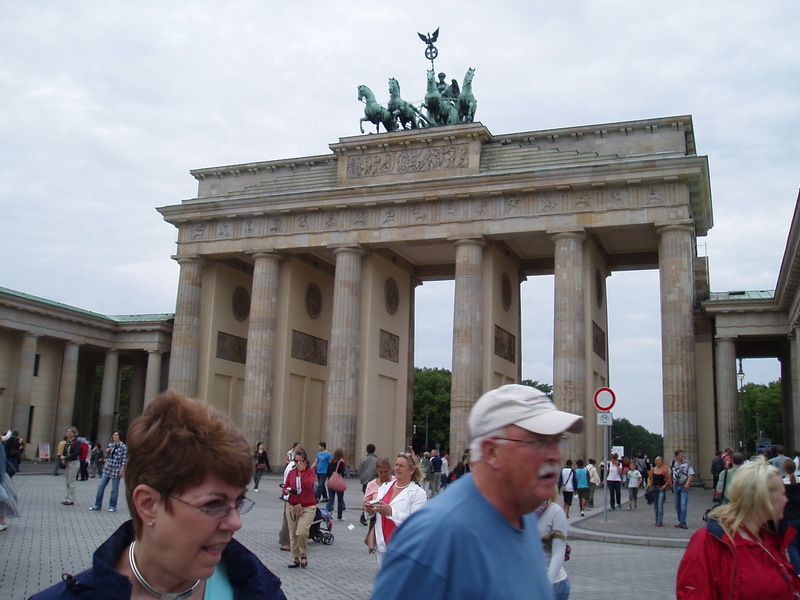 And for the country to have rebuilt it so much since the war bombings is just incredible. It was so sad to say goodbye to Kate. We had just spent time with her on her birthday and it was great. In addition Suryana the daughter of our friends in Dunedin who lives in England had come to Brighton to see us – and we had a lovely day with her. As the flight to Copenhagen was early in the morning we stayed at Yotel, at mini hotel inside Gatwick Airport itself. It was fascinating and like something from star wars. A mini pod / room with an electronic bed that acts like a couch and then zzzzzzzzzzz goes down to a bed. Large and comfortable too. Internet access, ensuite and just there – right in the departure area. Fascinating. Caught the plane to Copenhagen – quite uneventful except for the huge airport and departure area at Gatwick. From inside customs it takes 25 minutes to walk to the plane itself. Copenhagen is beautiful. 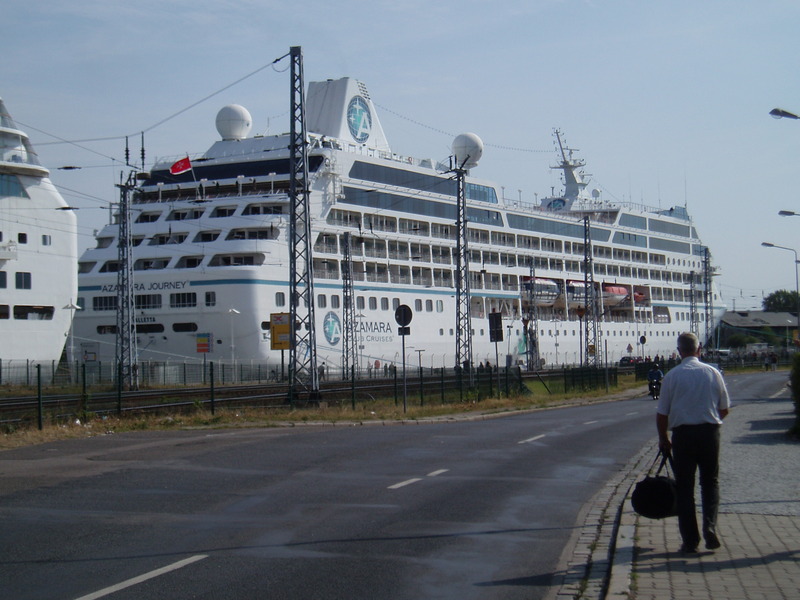 We had only one night there (but three days when we get back) before we took the cruise up the Baltic sea. But even in the one night we already love it. 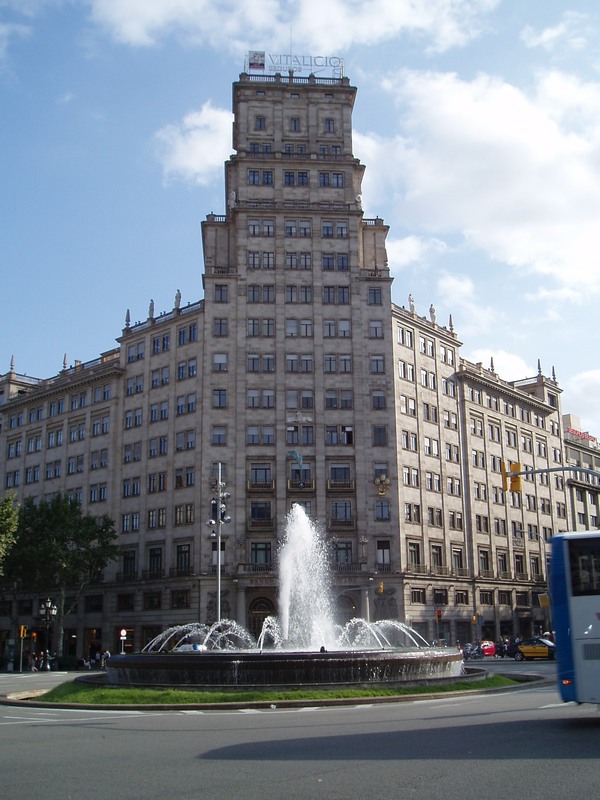 The buildings are lovely, the atmosphere great………. photos later when we go back there. The cruise left at 5pm the following day and boarding was from 2pm – or so we thought. Actually as it turned out boarding had been from 11am so no queues, simple process and took all up of maybe 10 minutes. As we boarded we were offered a glass of pink champagne and then we went to explore and find our cabin. We were so excited. It was like going to Disneyland or something. However we weren’t sure that playing the music from “Titanic” over the p.a. system was such a good idea………. 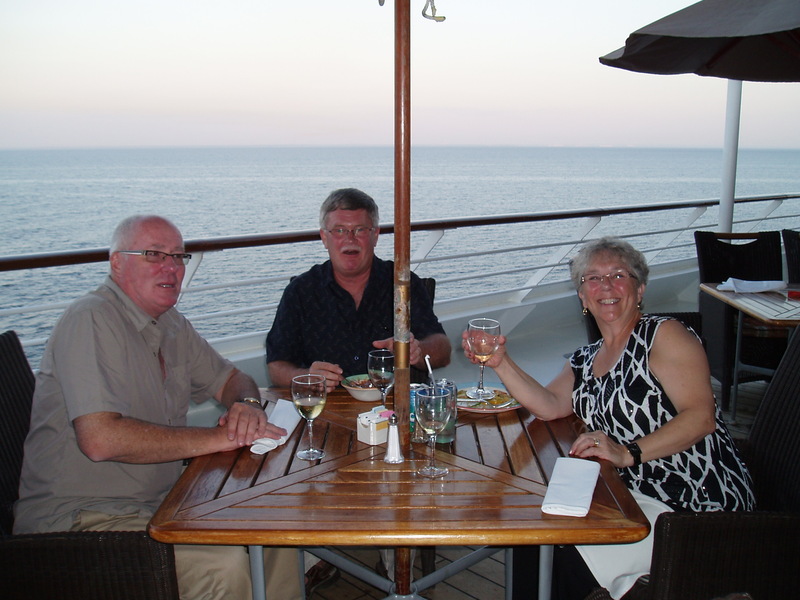 Our cabin is wonderful – a deck with a table and 2 chairs and inside everything you want. Great butler service and without even asking things turn up in your room like newspapers, ice, soda, water, towels, night time chocolates…………. Mmmmmmmmm. 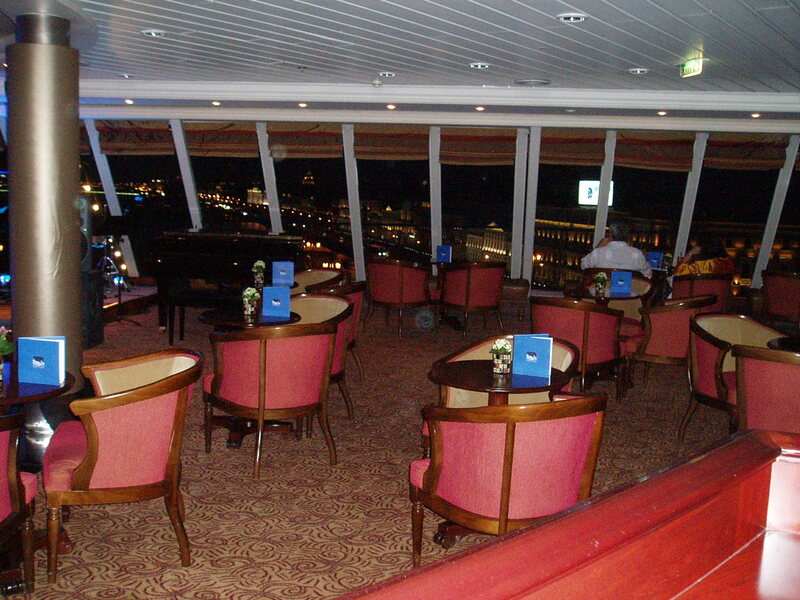 The first night we tried the main restaurant (wonderful), explored the ship and then at 10.30 went to the nightclub. Hmmmmmm we were the only ones there. Turns out we are amongst the youngest on the ship and everyone else was in bed! Oh dear! But that didn’t stop us dancing to the live music……. By ourselves………. A great night. Next morning we were berthed in Warnemunde, Germany. We had chosen not to do a tour that day so as to get used to the ship, explore the local area etc. Warnemunde is a quaint little seaside town and we were so lucky it was having a festival (summer holidays here) and lots of sailing ships from all over the world were descending. A beautiful and majestic sight indeed. 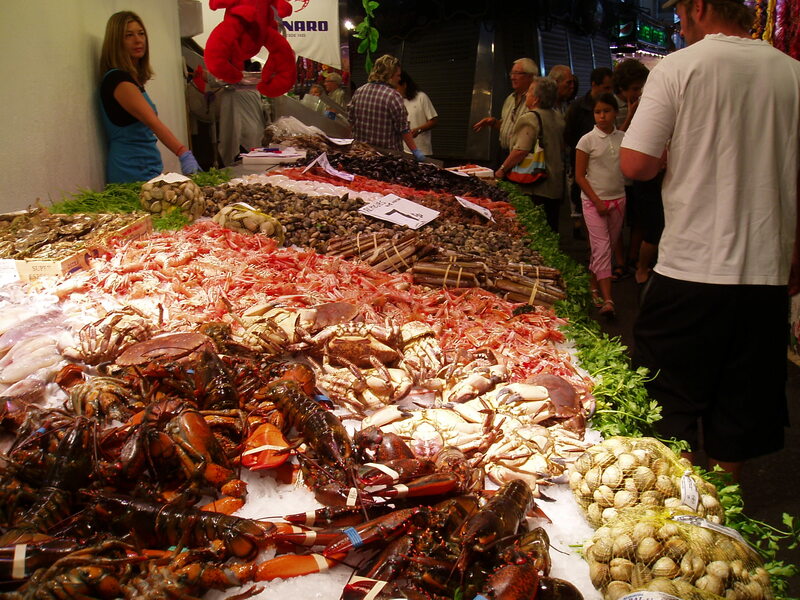 They also had a market at the beach so we explored that and Peter sampled some of the local fare. 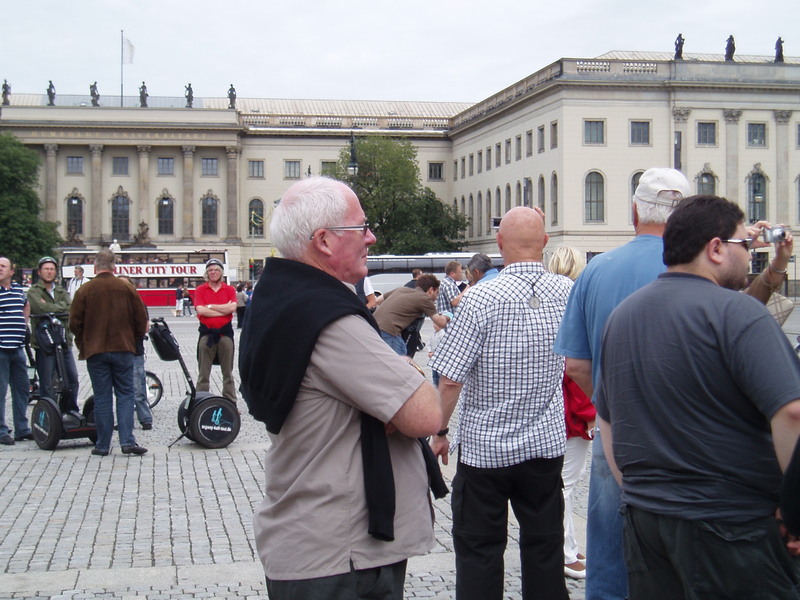 The next day we went on a planned tour to Berlin. 2.5 hours on a bus each way, but worth it. 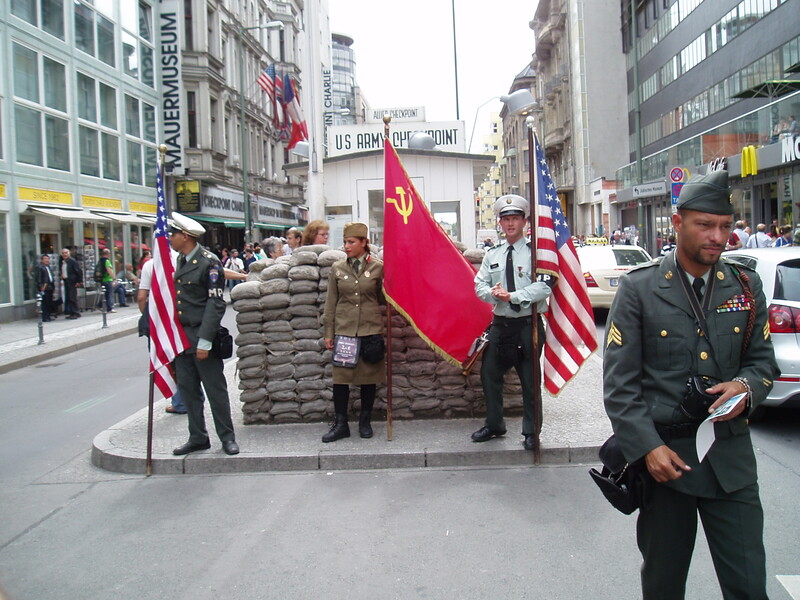 Berlin was something else – incredible history and guided by a local person who had experienced the wall etc. 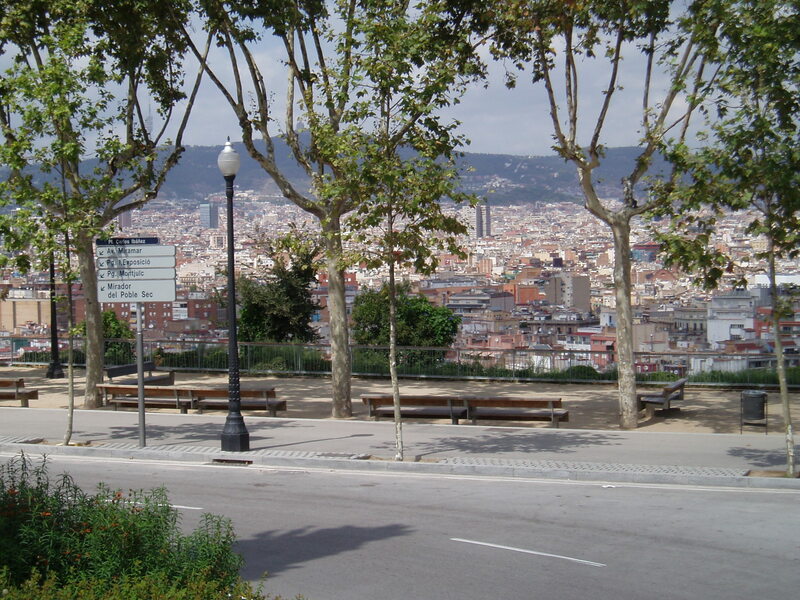 We were surprised by the spaciousness of the city and how green it was. Huge parks etc. It brought home the terror people must have felt. 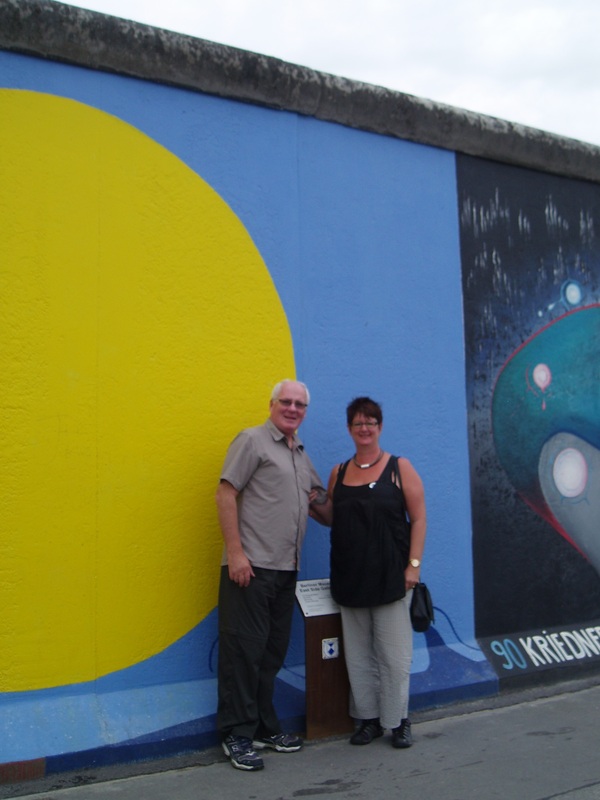 Just touching the “WALL”……… A very poignant visit. It touched both of us. The bus journey back seemed to take forever and as always sensible Peter had his book and I didn’t….. We got back in time for dinner and then for the ship to leave. And as Warnemunde had a festival, and as it was the last visit of this ship for the season, they put on a huge fireworks display. It was stunning. We were sitting on the deck at the restaurant having dinner as we sailed past the display. The food on the ship is great. We have met an extremely good and very fun sommelier – and we have fun and laughter with her each night at the restaurant. She has put our names down for a degustation dinner – which is invitation only. So we are very happy with that. 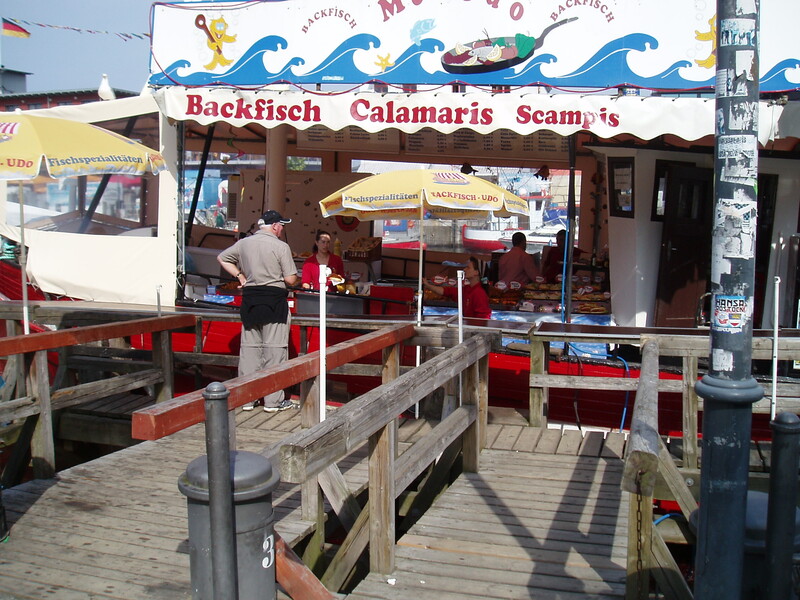 There are four restaurants on board – two of which are “special” restaurants. We ate at one last night and really, it was fantastic, but not much more so than the mainstream one. And as you have to pay an extra $15 USD each for the special ones that makes us happy. 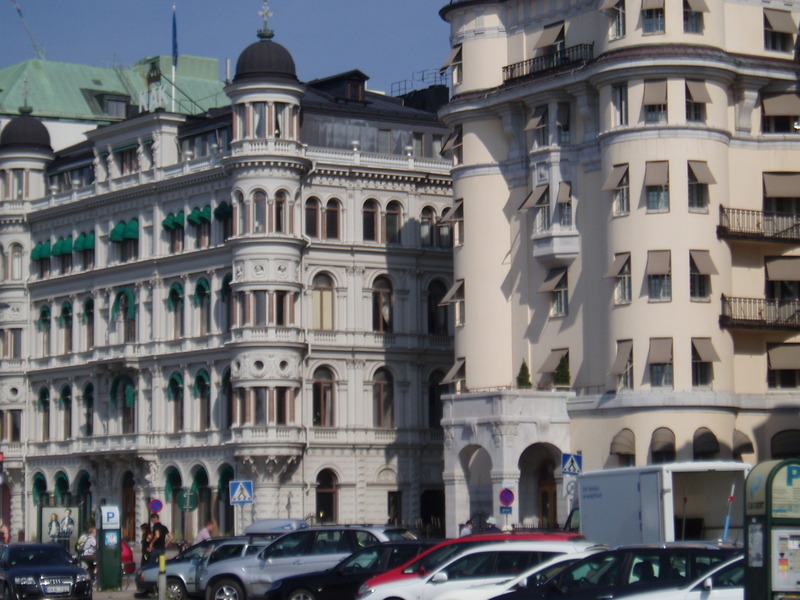 Today was Helsinki, Finland. I had to work in the morning (yes I am doing some work while I am away!!) and Peter had a tour organized for a fishing trip around the Archipelagoes. He left at 10am and I left at 1.30pm for my harbor tour. As it turns out the boat he was on lost its propeller and the tour was cancelled. In the end the three men on it (Peter and two others) were transferred back to our ship by the Police Boat. The three of them had such fun and much laughter and last night we had dinner with them and their wives / daughters etc. My tour was OK and full of facts like there are 50 ports here and only 28 are kept open in the winter by 9 ice breakers, there are 3 million people and 2.5 million saunas………. That sort of thing. Yes, 2.5 million saunas – and in the winter they cut holes in the ice and dive in to the sea after being in the sauna!! Now we are on our way to St Petersburg Russia. We imagine that will be quite something!!!!!! !